I, honestly could feel the stark rays of sunlight, pierce through the sun drenched skies and settle on my sunblocked and goggle laced face. While, the driver played a popular Bollywood tune of my choice, that got my two left feet tapping, my heart was set at reaching my destination. 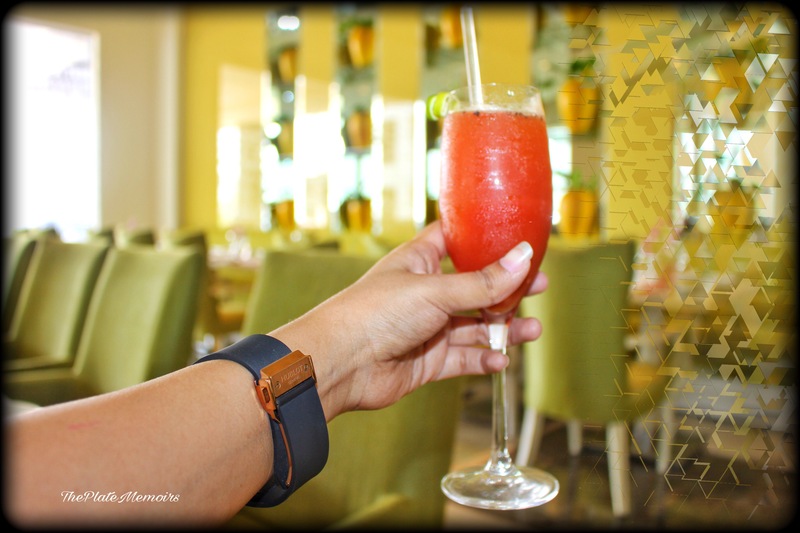 Brunches are always hearty and they are best enjoyed with the people you love. 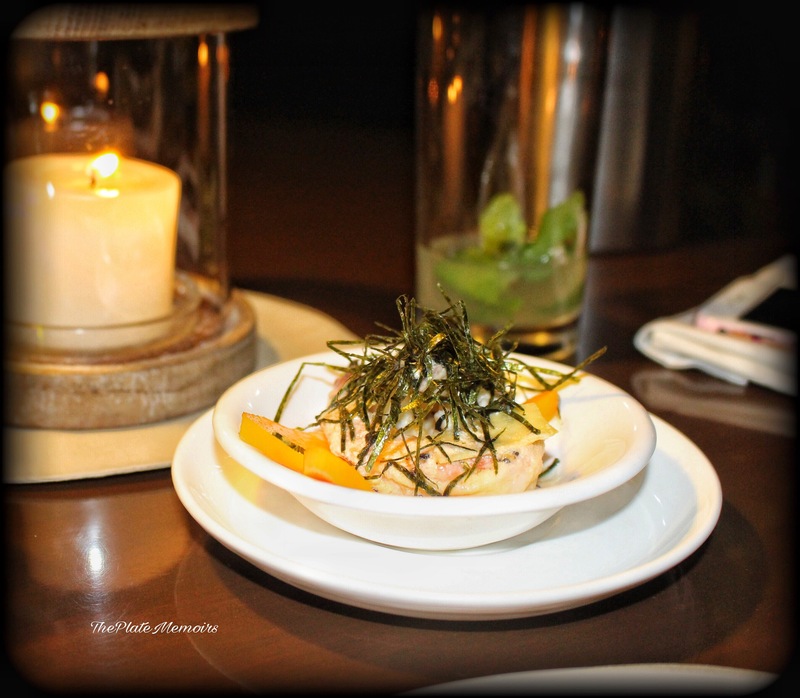 I, was a part of the 59th FBAB meet up that was held at “Melange, Park Plaza”, for the relaunched menu. Melange is a 24 hour dining restaurant, at Park Plaza. 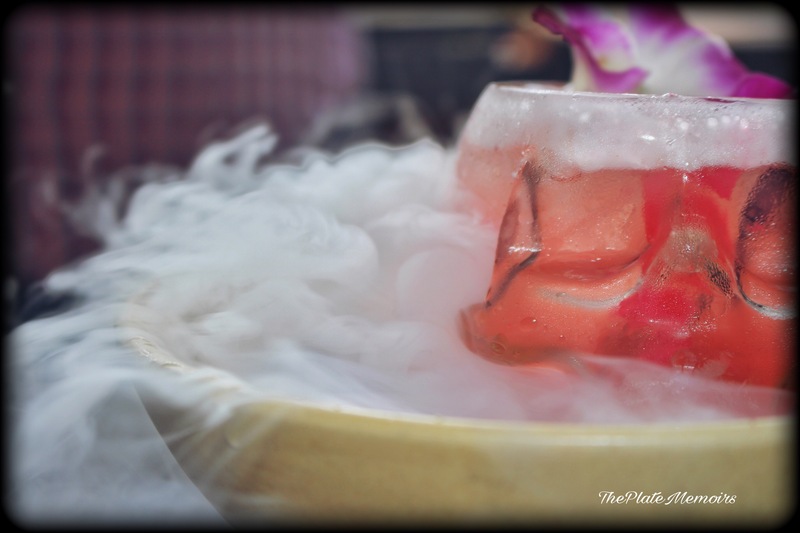 The menu at Melange, is a mishmash of Indian, European & Pan-Asian Cuisine. 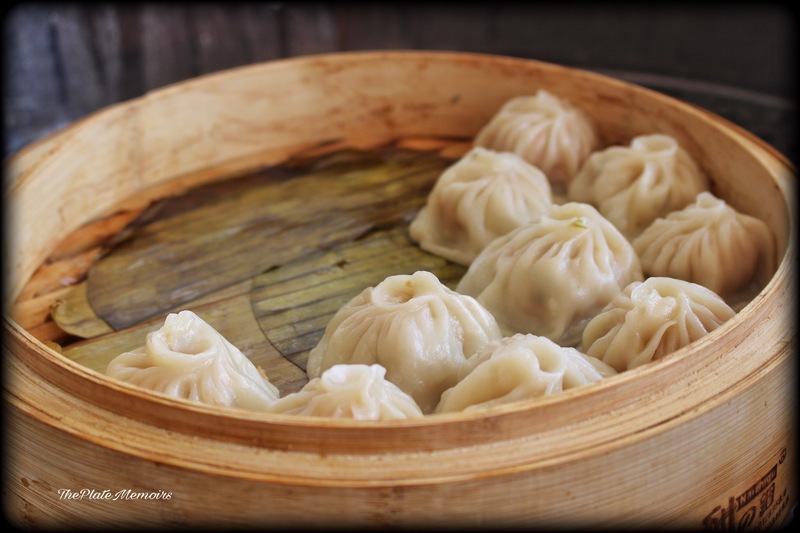 It does stand true to its name & is certainly a melange of different cuisines. Decor : The decor is casual contemporary. The colour palette is my favourite of neutrals & green. Orchid stems, adorn your table. 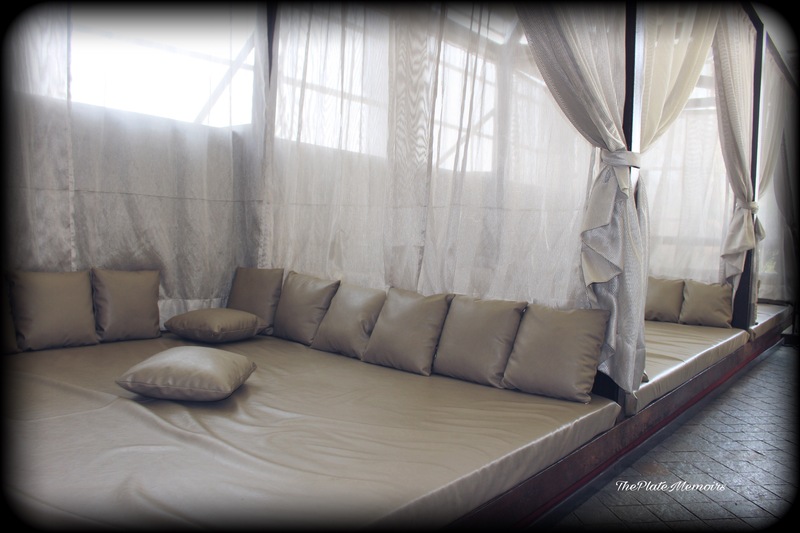 The ambiance is highly relaxed, suffused with positive vibes. Hospitality : It goes without saying, that as this is a star property, the hospitality tends to be just short of perfection. Highly happy with the wait staff, specially the sweet lady making waffles. Courteous, well groomed and keen to serve, they made our brunch worthwhile. 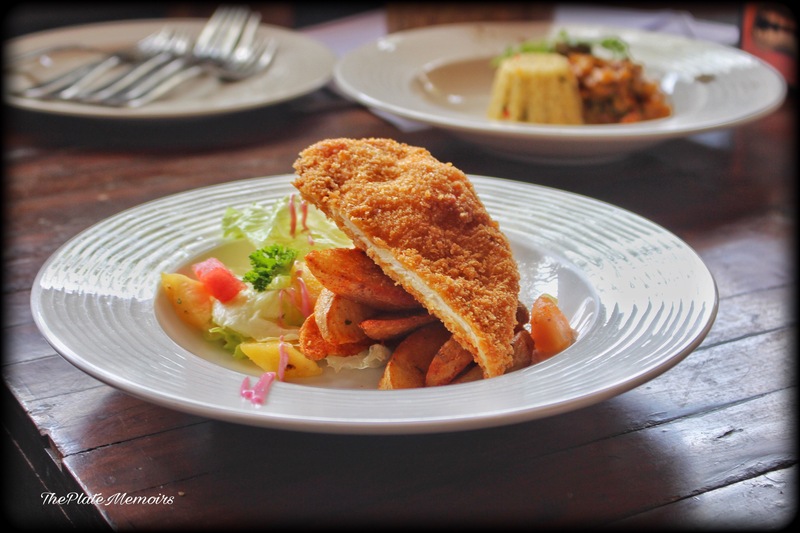 The Grub Story : We were here for their renowned “Sunday Brunch Buffet”. 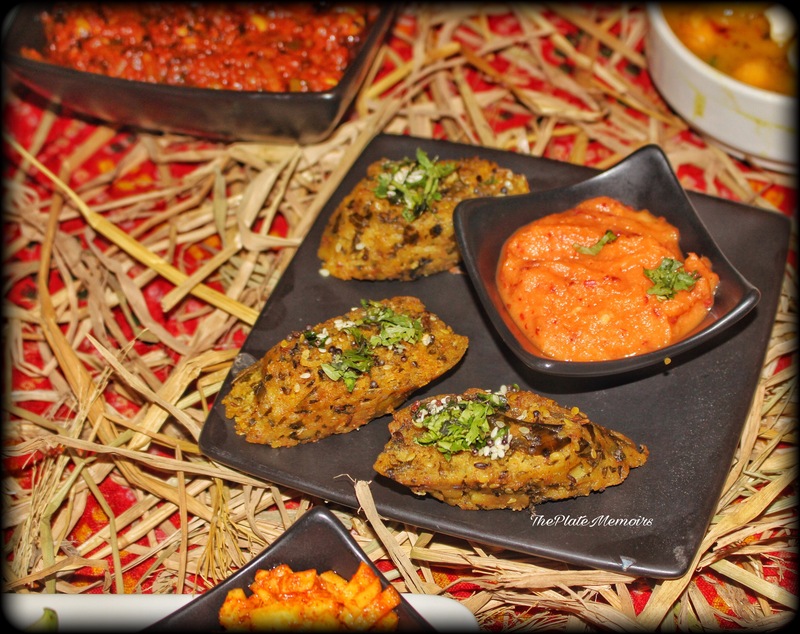 The buffet, is a huge assemblage of dishes ranging from the Rajasthani Laal Maas to the Levantine Hummus with Pita bread. There were quite a few favourites of mine & due to the sheer amount of volume, I had to skip the mains. Virgin Bloody Mary : This was one drink, that I absolutely loved. 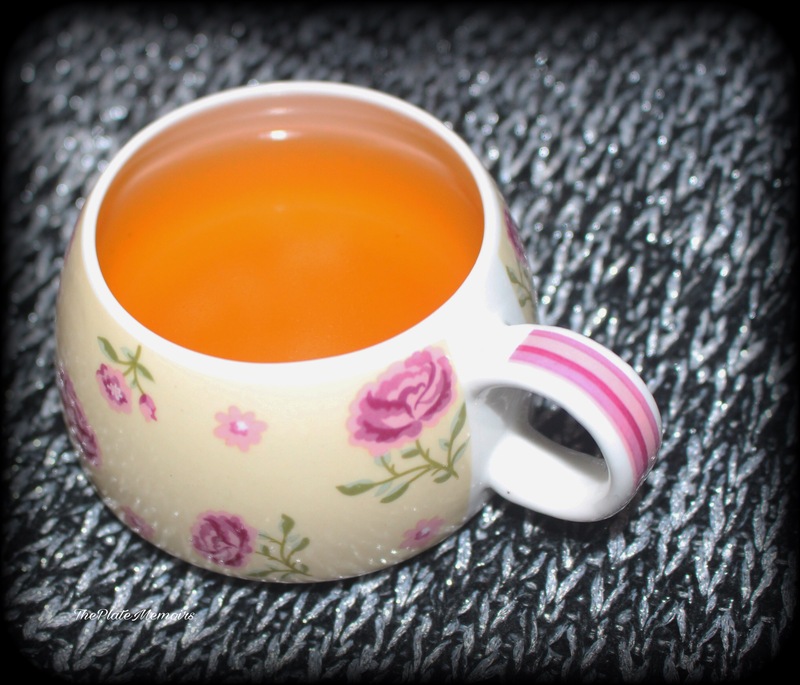 The spicy kick, with tomato juice & lemon puckerings was such a welcome. A part of it, felt like a strained chill gazpacho, but then, that’s what Bloody Mary’s are all about. Highly recommended! Salads : The counter was filled with my favourites. Russian Salad, Caesar’s Salad, Mushroom Salad, German Potato Salad, etc. Trust me, the Salads, each one of them were just the best. Delicious, generously tossed in the dressings and fresh. Sushi : Who doesn’t love some heart warming Sushi? 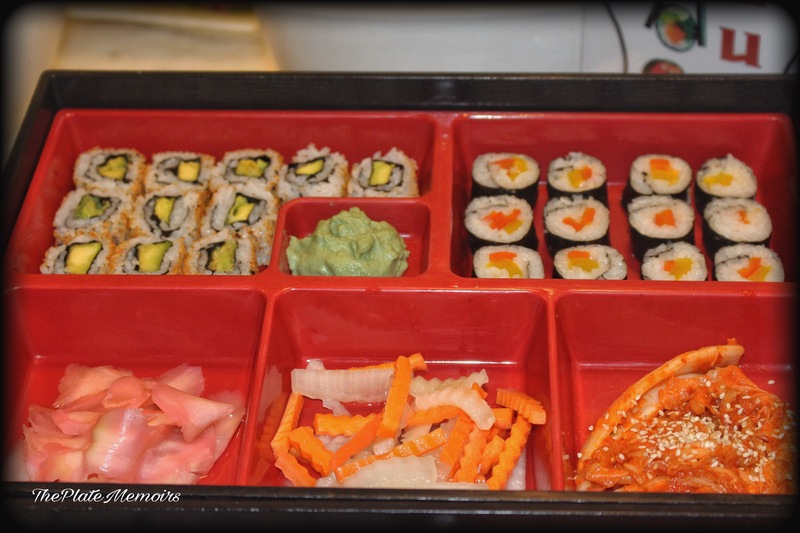 I’m a “Sushi believer”, specially in Avocado Maki Rolls. Pleasantly, surprised was I, to find 2 variations of vegetarian sushi. The sushi was just perfect, with the perfect amount of rice vinegar. Not too much heat on the palate, just subtle flavours. Live dimsum Counter : Even the dimsums, were outstandingly delish, with the subtle hint of seasoned veggies. Live Chaat Counter : The beautiful sizzle of the samosas and whole process of seeing them being made into a Chaat was mesmerising. 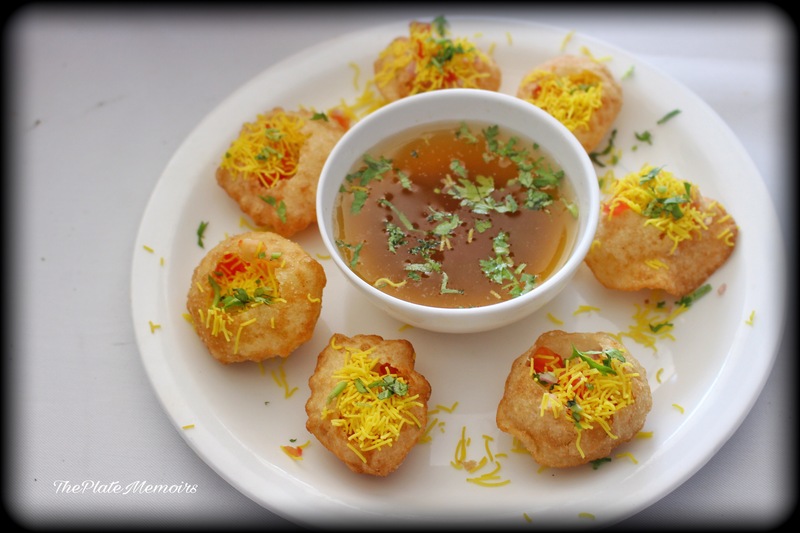 The puchkas were drool worthy as well. Main Course : I had, filled my heart out with salads and had to skip the main course, but I did see a great assortment of Indian cuisine & Italian cuisine. Desserts : Desserts are always the prettiest to look at. 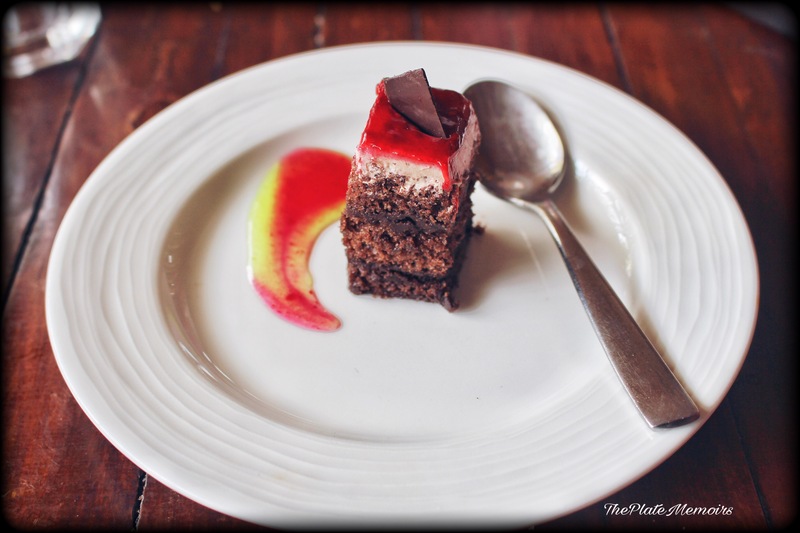 With their colourful layouts and mouth watering offerings, desserts are always the weak spot. Baked Cheesecake: A lush cheesecake with fruits. Such a wonderful one. 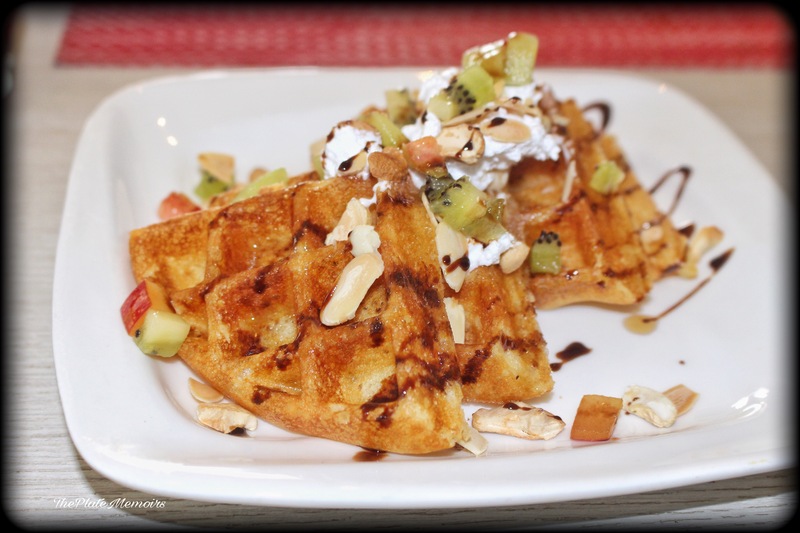 Waffles : The best out of the lot. Please don’t miss out on the waffles, they are just perfect. Buttery, rich and lipsmacking! Verdict : My Sunday brunch was sorted, loved every bit of it. 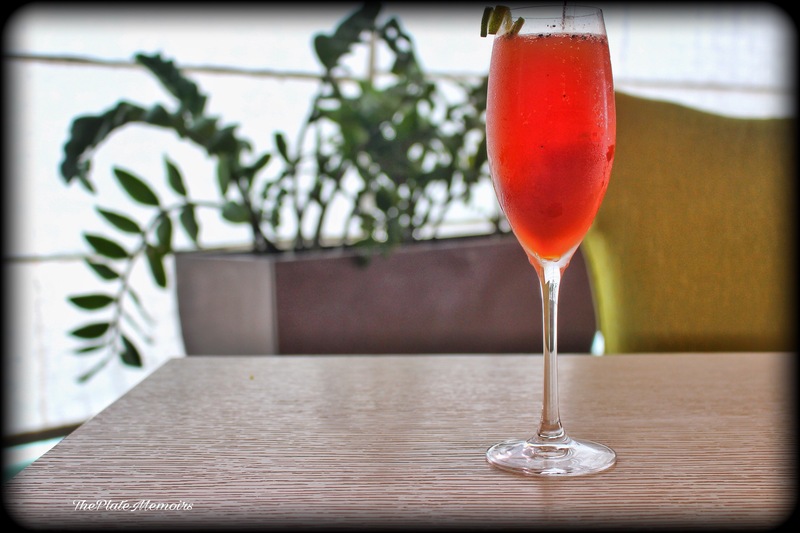 The brunch was at “Rs.1275+ taxes”(without alcohol) , which according to me is a great deal. The spread is huge, you name it & probably they have it. Also, everything on the menu is par excellence. Here are my 4 stars for the Brunch. And just like that, I fell in love with the hamper that came across my way. A basket full of goodies, that literally warmed the cockles of my labile heart. Atty’s was conceptualised in the September of 2016, under the keen eyes of “Mr. Abdul Azeez & Mr. Mohammed Zahrin Aziz”, who themselves are the M.D & Director respectively, of the famous “Empire Group of Hotels”. 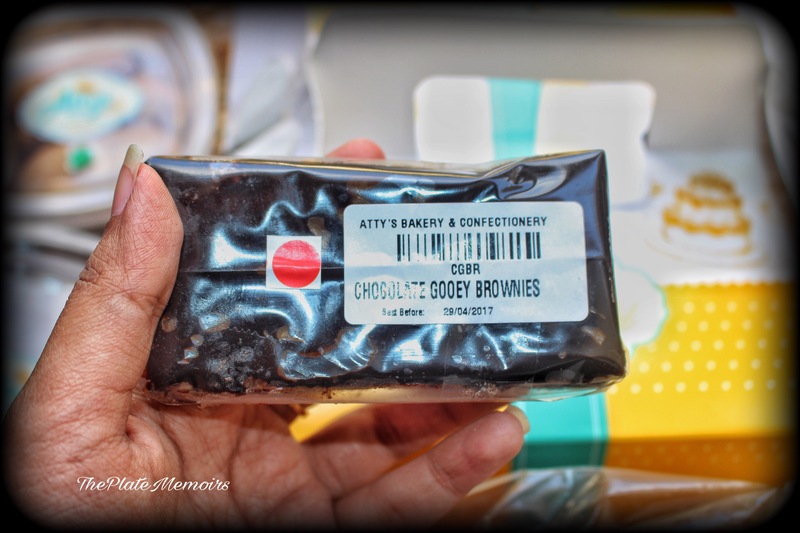 The USP of Atty’s, nestles in their choice of ingredients and stringency. They refrain from using premixes and all baked goodies are made from their in house 100% from scratch flour mixes. 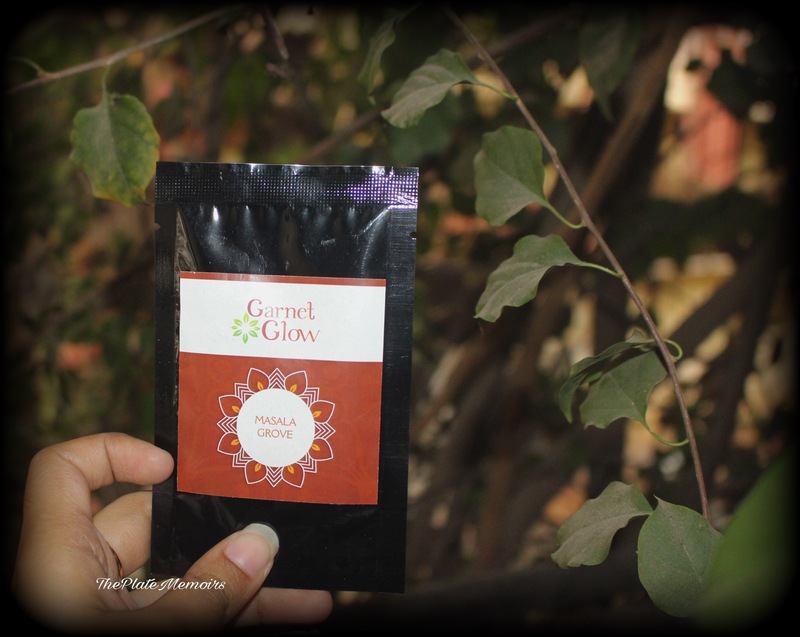 The products here are ” Preservative free, Chemical free & Alcohol free”. Focaccia Bread : A delectable savoury offering, which was light as air with the combination of rock salt, fried onions & brown sugar. 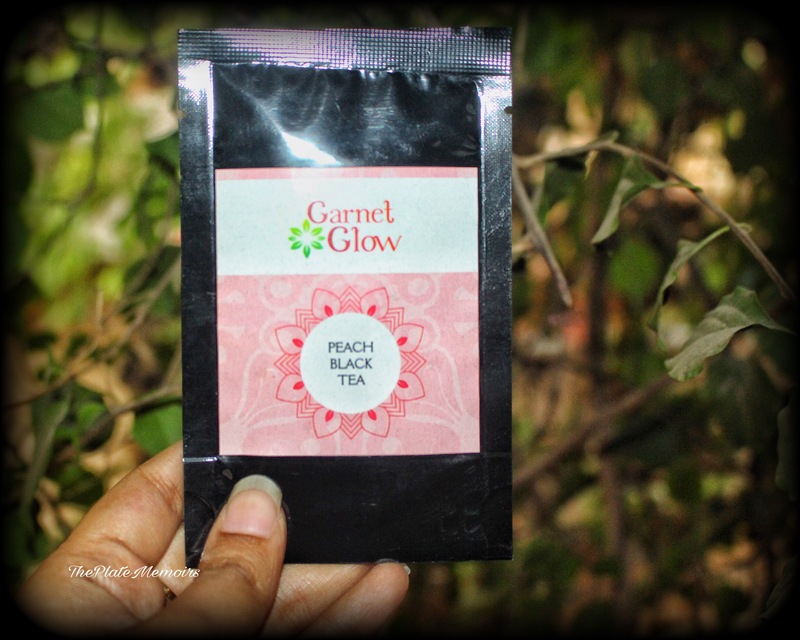 A must have for your midnight cravings. 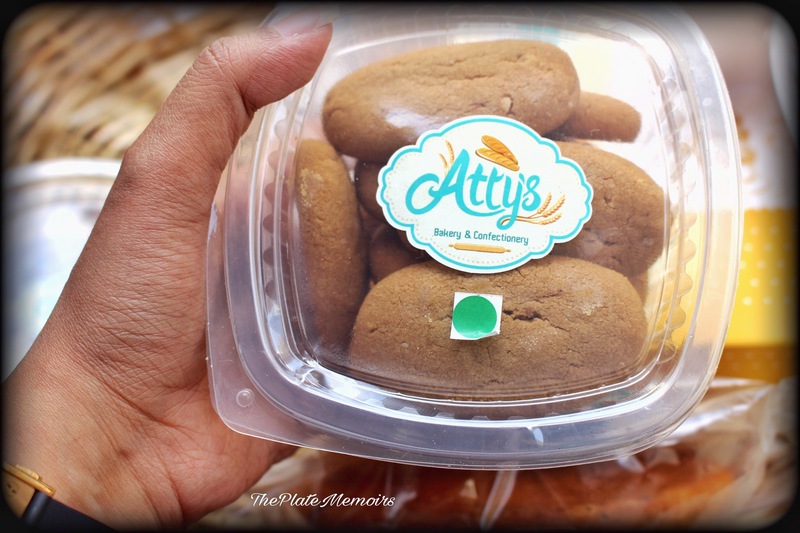 Ginger Almond Cookies : The subtle punch of ginger is prevalent all across, due to the addition of Ginger powder & chopped ginger, in the cookies. The roasted almonds, give more body to the flavour. Plum Cake : Dried fruit cake, made with red cherries, dates, cashews, figs, raisins and tutti frutti. Another great offering that’s delicious! 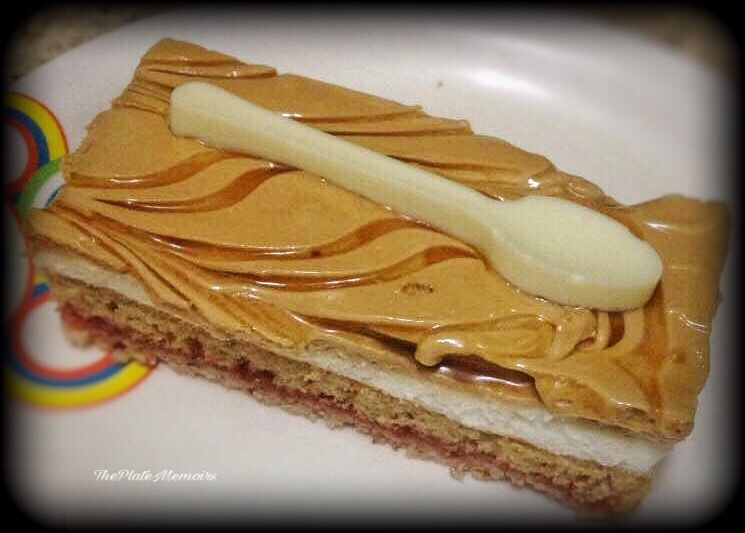 Atty’s Signature Pastry : Made out of crunchy Almond base, mixed fruit jam filling, a layer of banana sponge, French cream topped with coffee cream & caramel sauce. My favourite & another must try. 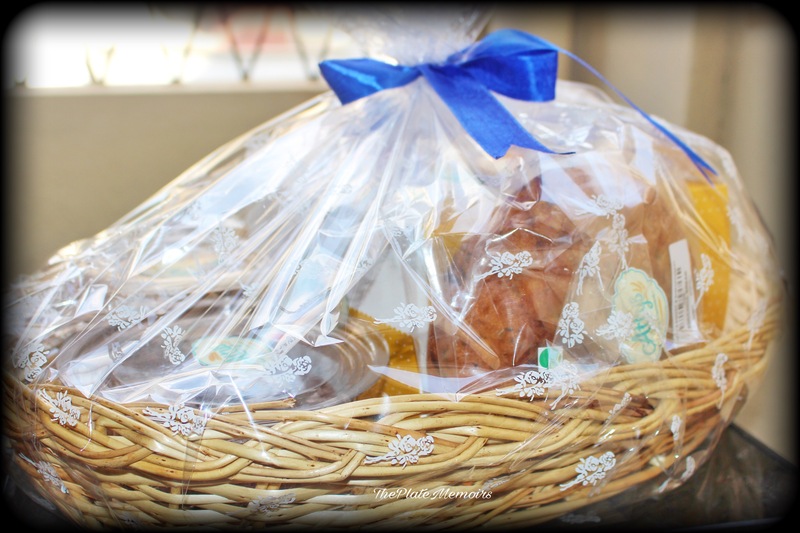 My hamper also had “Butterscotch pastry, Black Forest Pastry and Almond Praline pastry”. All of which, were immensely enjoyed. Verdict : I’m an official rooter for this place. Though, I live in Frasertown and we do have a bunch of boulangeries & patisseries in the neighbourhood. We have none, who are this affordable and stringent. Atty’s is focused not just at great quality of Grub, but also at affordability. Ranks high on my “VFM” meter as well. A well deserved 4 star for you, Atty. And eat we did, with no reservations on our diets. After all, that’s the most “Punjabi” thing to do. While Bangalore was seeing the mercury rise, i was seeing yet another FBAB meet up, pop up on my screen. Kapoor’s Cafe, had opened up a third branch in HSR, after their astounding success in the latter ones. The owner, Mr. Arpit Kapoor is a young & ambitious entrepreneur who has already set up an example of running a successful business, by striking a chord with his customers. 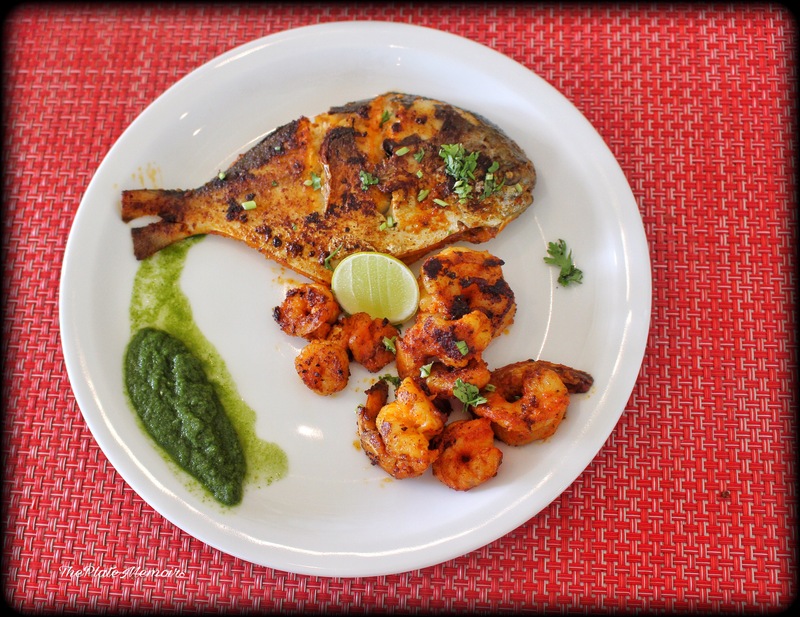 Kapoor’s Cafe is a humble yet zealous venture, which focuses on good homely food & affordability. Their menu is from the hearty “Punjabi” household. Decor : The decor is simplistic, with a beautiful colour palette. 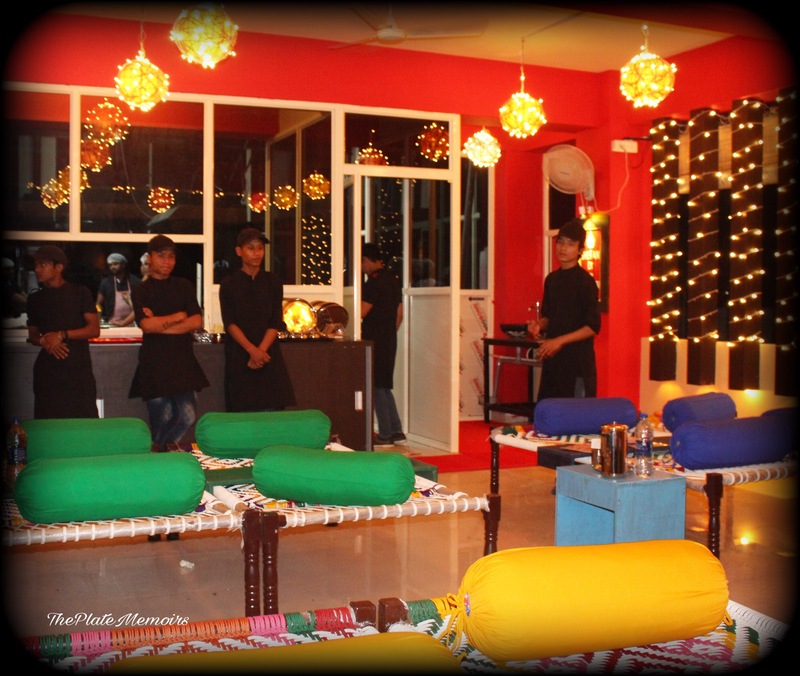 Vibrant hues and fairy lights adorn the place. It’s a modernist version of a “Dhaba” (Roadside restaurants on the highway) You find Khatiya / Charpai (Cots) as your seating arrangement. The whole ambiance and decor is very peppy. What I loved, was the faux grass flooring ( not to be confused with foie gras 😂) at the open air section, of the restaurant. 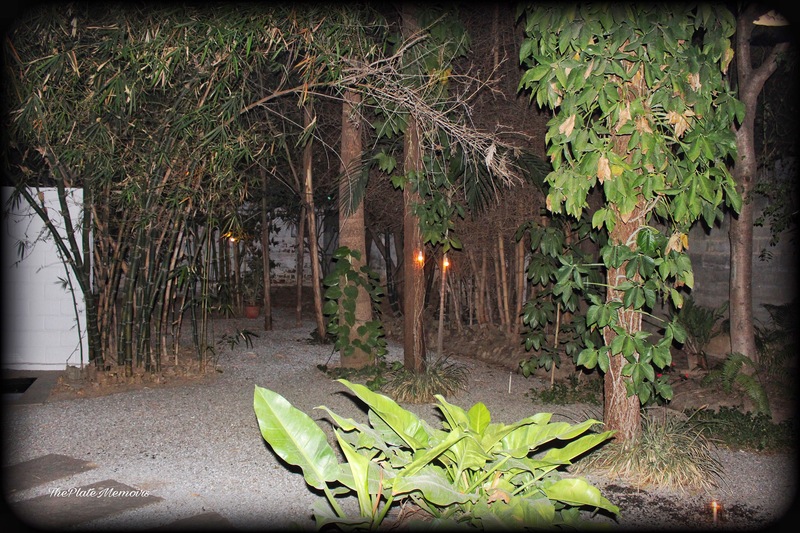 It almost begs you, to throw your chappal (footwear) and walk barefoot, but then sanity knocks in and you behave. Hospitality : “Hai!! mai vari jawaan” This literally felt like, I’ve come, not to a restaurant but, to a punjabi friend’s place. The way they pamper you with their hospitality, is such a huge factor in your return, the next time. Staff is efficient and courteous. 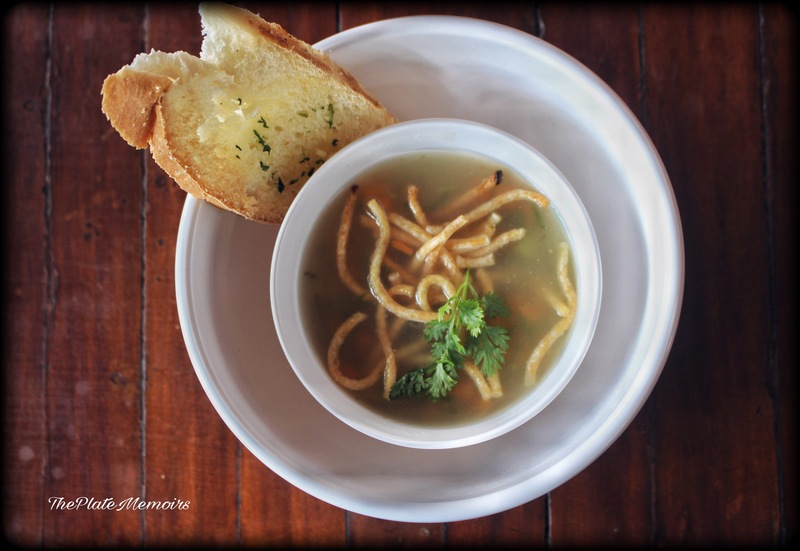 The Grub Story : Relishing the affair, once again. 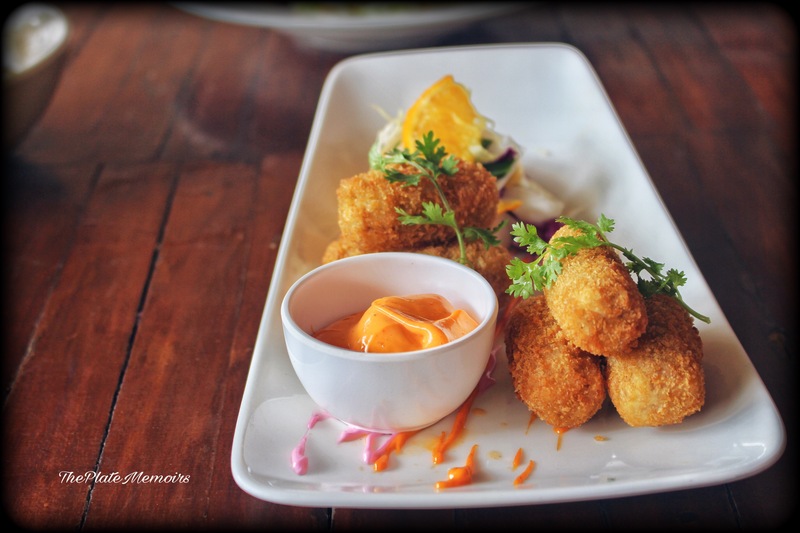 Cheese Pataka balls (Rs. 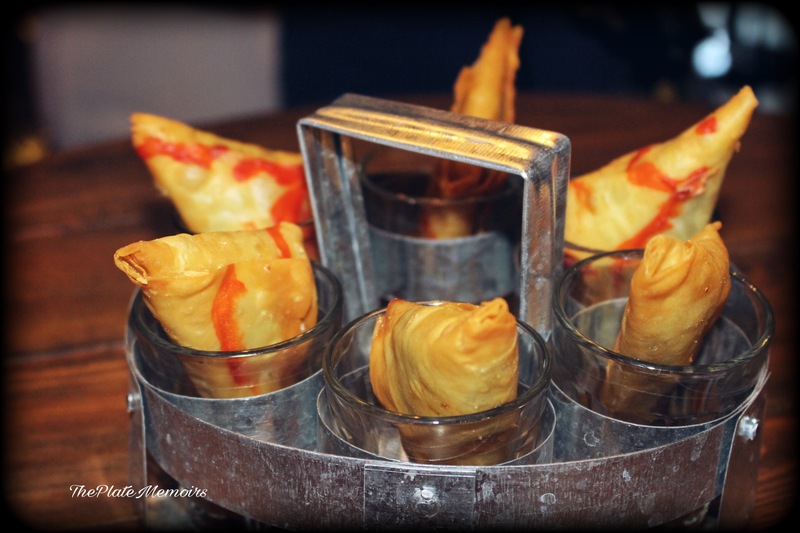 160/-) : Deliciously spiced melting cheese, envelopes your mouth when you take that first bite. Best eaten when hot. Spicy 🌶 much. 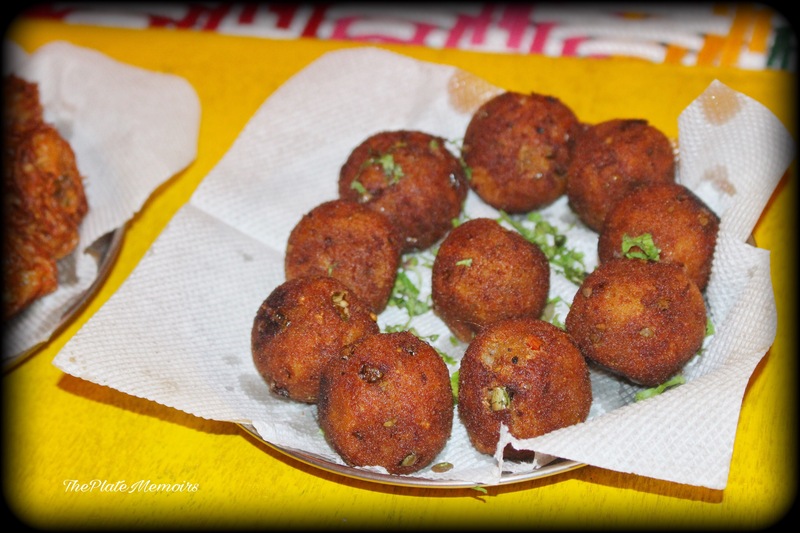 Gobi Pakoras (Rs. 140/-) : One of the best cauliflower pakoras I’ve had. It was just, everything perfect. The batter done beautifully and the florets full of flavour. 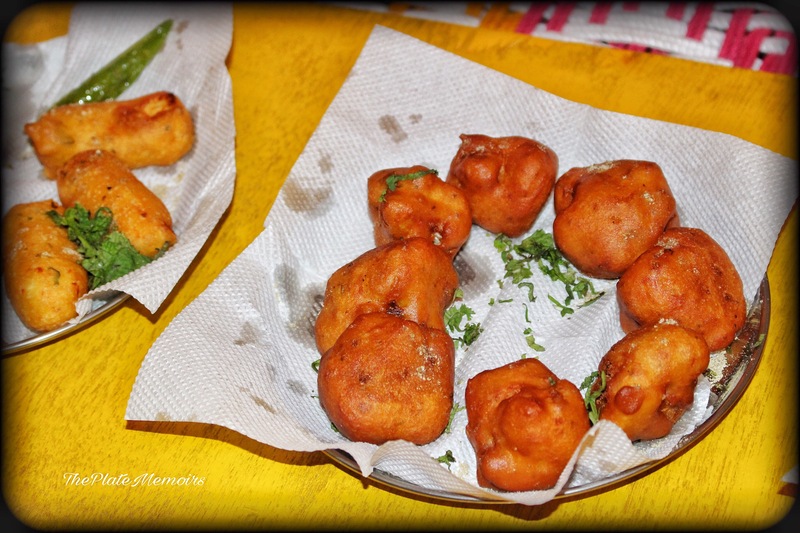 Paneer Pakoras (Rs.150/-) : Didn’t click too good with my tastebuds, because somehow the Paneer fell a little flat while trying to be flavourful. 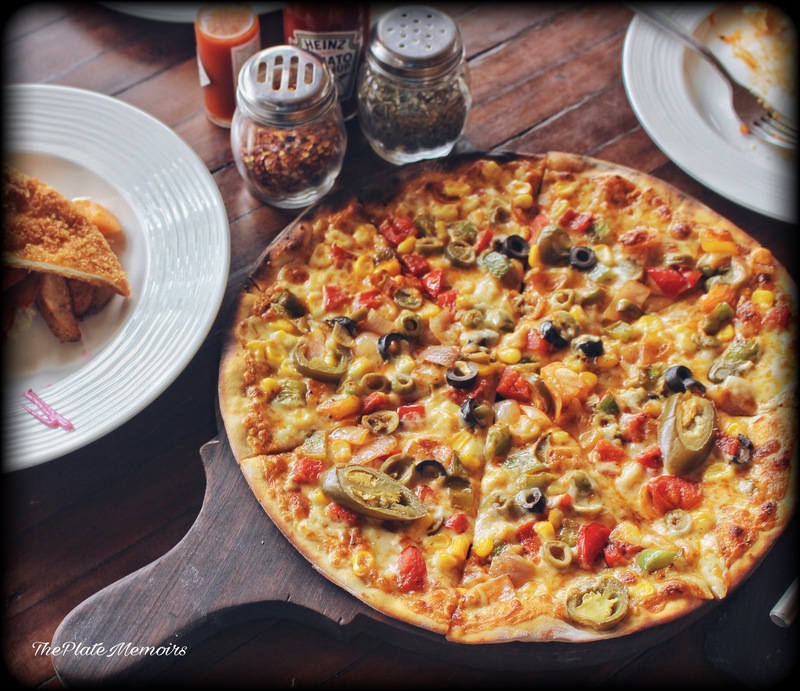 Cheese Burst Paratha (Rs.150/-) : This 4 layered Cheese Burst Paratha, was such a hit among everyone. Extremely cheesy and ambrosial. This is a must have over here. One of their USP’s, I say. Maharaja Thali : A beautiful assortment of Pindi Chole, Paneer butter masala, Dal Makhani, Raita, Muttar Pulao and Missi Roti. Every subzi on the Thali was lip smacking. I have to admit, that it’s a little higher on the spice level, but it’s just something you will not be to stop devouring. 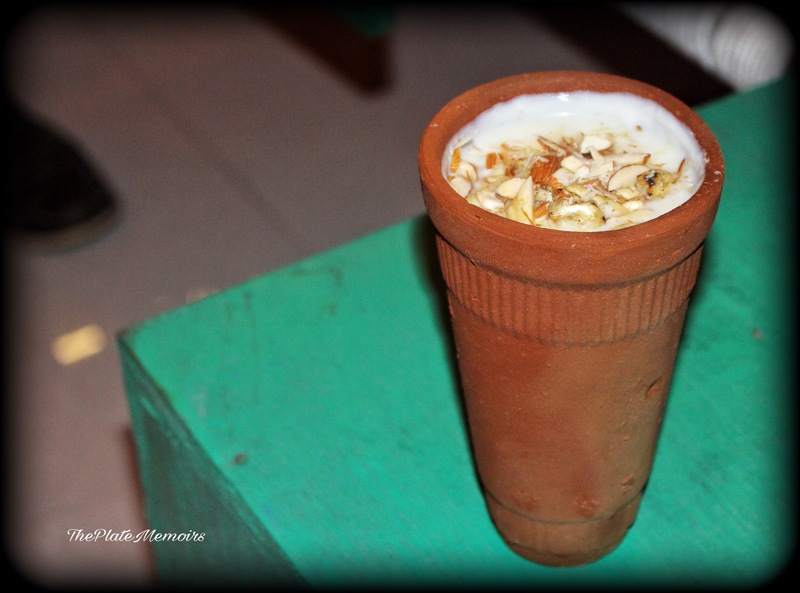 Dry Fruit Lassi (Rs.175/-) : Gosh!! This is where, you can judge authenticity. The Lassi, took my breath away. 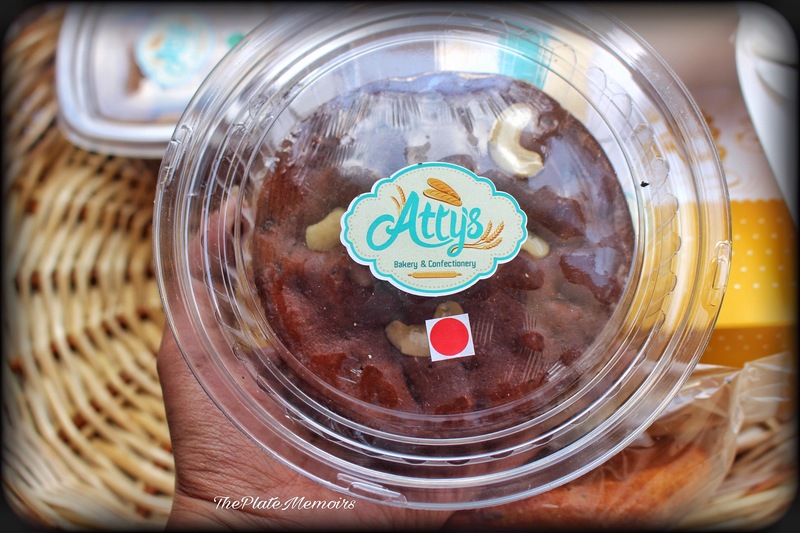 So rich and heavily loaded with dry fruits, this is why I will visit this place again. Fruit Cream (Rs. 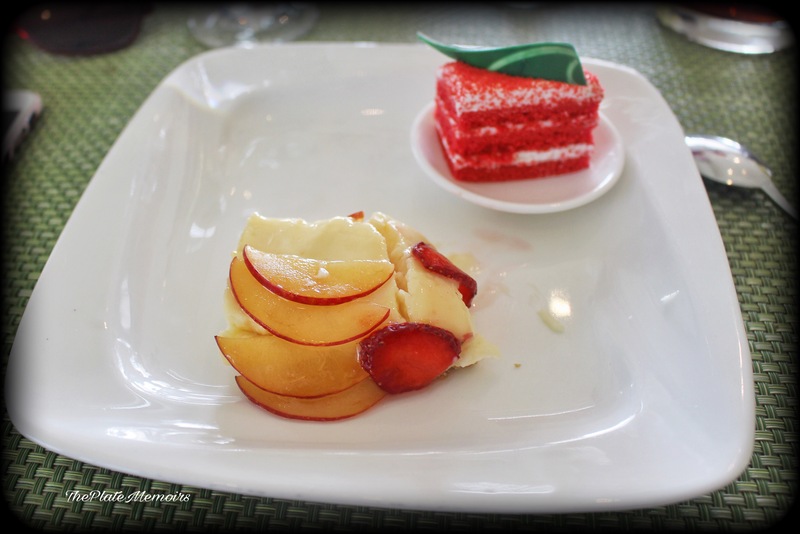 150/-) : This is how, fruit cream, really is supposed to be. 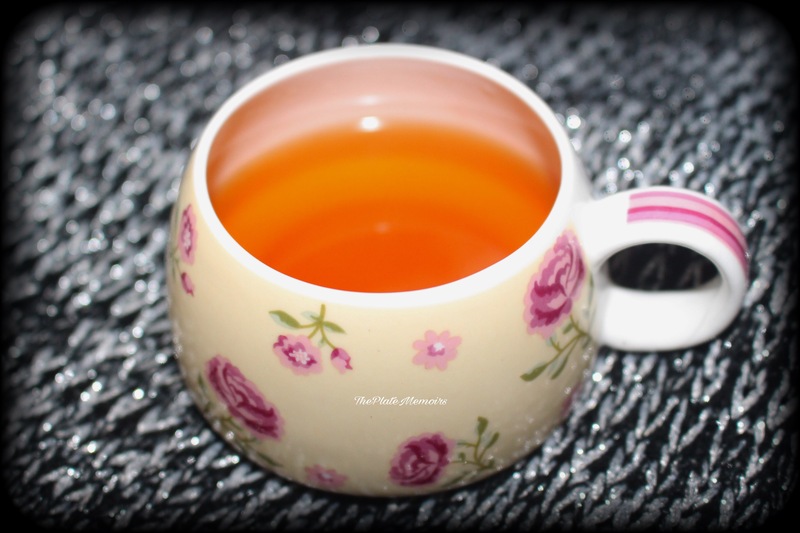 The richness of that cream and the subtle infusion of nuts and fruits in it. The result is a dessert that completes your meal, literally. Verdict : Kapoor’s Cafe, is a boon for all the souls that crave authentic Punjabi food. I, was impressed with almost everything that I savoured. Yes, the spice levels are high, but having said that, the food is so delicious that it hardly deters you from taking the next bite. I, had my nose blushed red and runny but my appetite was satisfied. Wishing, the entrepreneur “Mr. 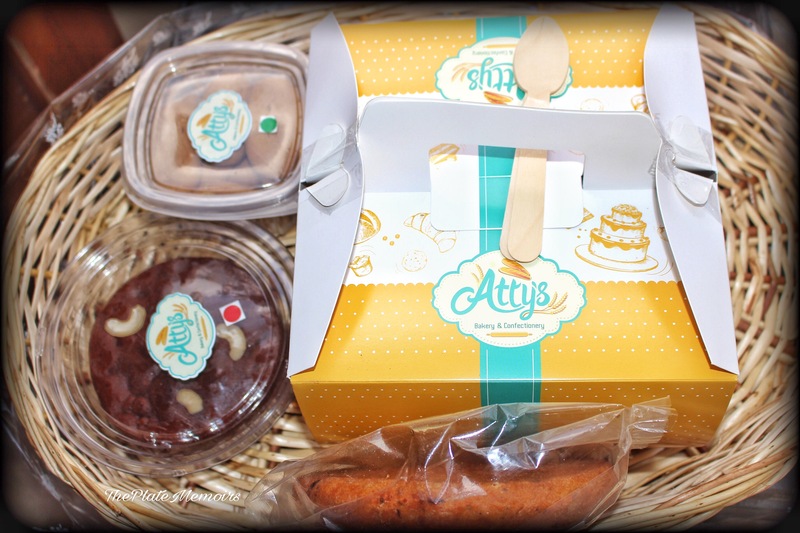 Arpit Kapoor”, loads of success in his venture. The silent creak of wispy trees, the crunch of pebbles shivering under my feet and the mellow shine of that ivory moon, had attuned my heart to the magnificent spread that was, yet to unfold. While, I perambulated the place with a keen eye, it was no surprise that i was falling in love with it. The 15 second walk from the car parking to the table, was so beautiful, with the trees passing by my peripheral vision, that it almost felt like the world existed only at the ingress of this place. 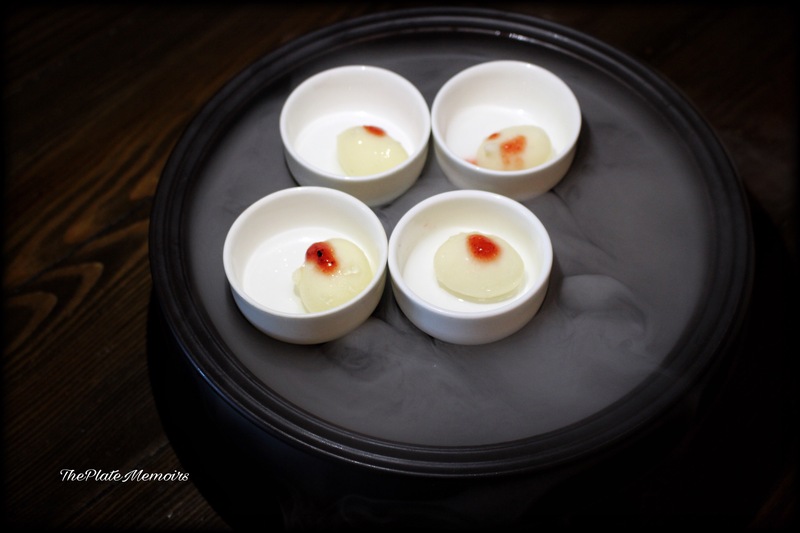 Grasshopper is a legacy in itself, where the memories and family cook offs of the previous generation have metamorphosed into the boutique restaurant of today. What started as a family that opened doors to friends, gradually snowballed into an exclusive “Reservations Only” restaurant. Even to this day, they take guests only on prior reservation and do not offer walk-ins. 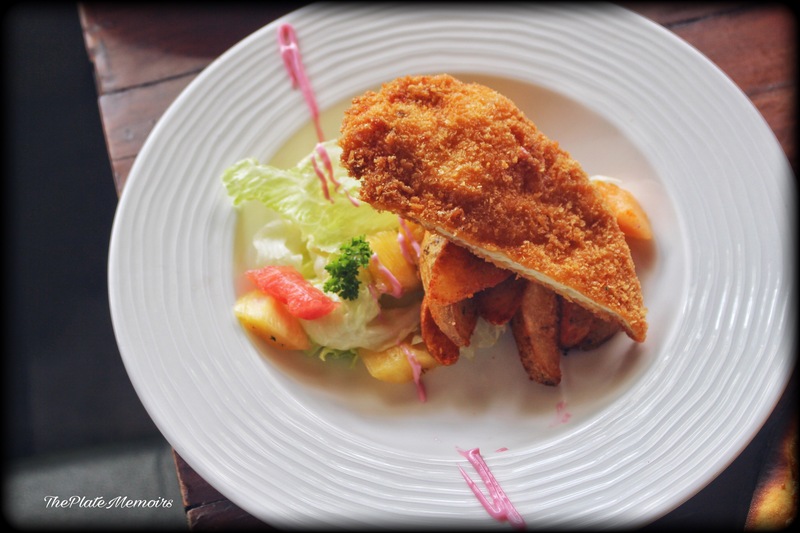 Their menu is specially curated on your choice of fare. You are required to notify the owner “Mrs. Sonali ” your food preferences, a day or two before, the big day. There is no “a la carte” & you are given an element of surprise with your meal. Decor & Ambiance : This is an impressive experience to soak yourself in. 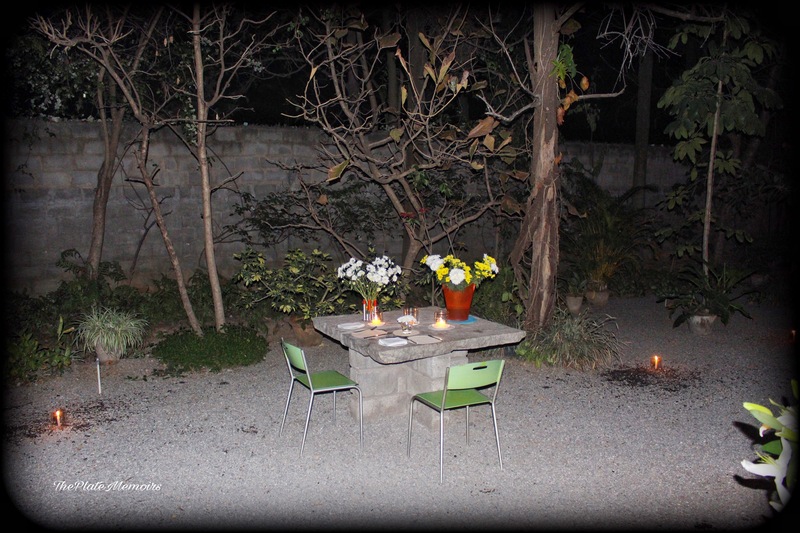 It’s an alfresco dining concept, with starry or sunny skies (depending on the time of your visit), green trees and yellow flamed candles as your decor. They are letting Mother Nature, impress you and trust me, she really is. There are about 5 tables and 2 exclusive dining options with extra care on privacy. 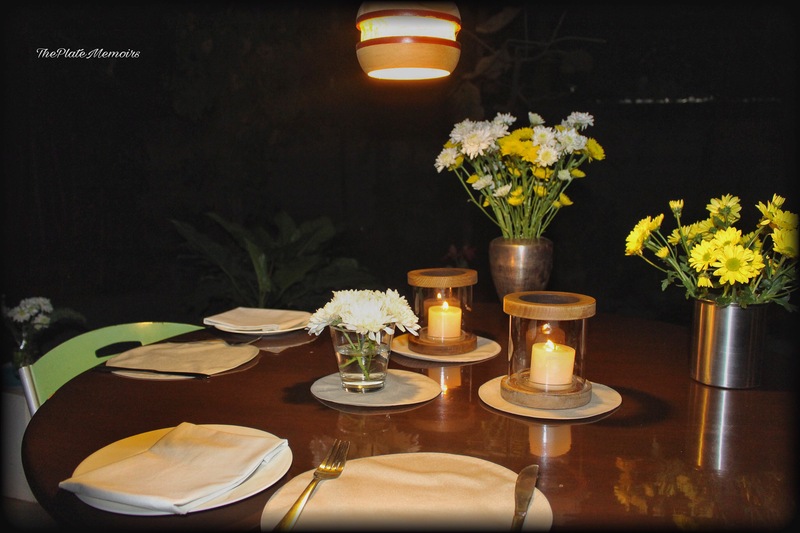 The ambiance is breezy, casual yet romantic and hushed. You will not find anything of opulence, yet you sit in the lap of luxury, because of the vibes that, this place emanates. 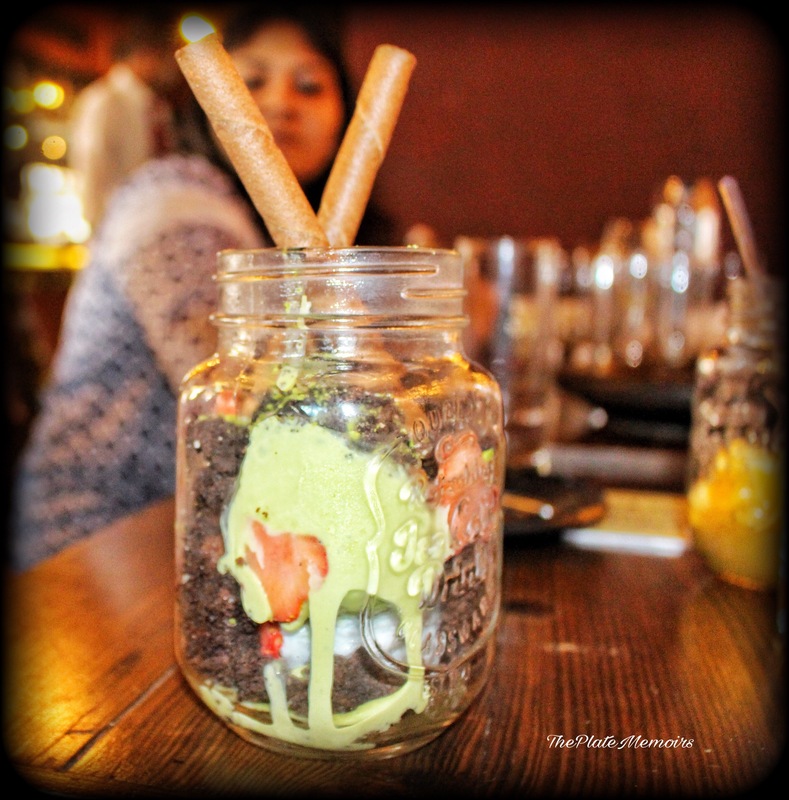 Hospitality : Grasshopper is synonymous with indulging you in care. The maitre d’ is in touch with you, throughout your meal. His presence is subdued, appearing almost magically when you need him, without calling out for him. He keeps a check on your table and let’s the meal transition from one course to another. This was a perfect definition of how “service a la russe”, is supposed to be. 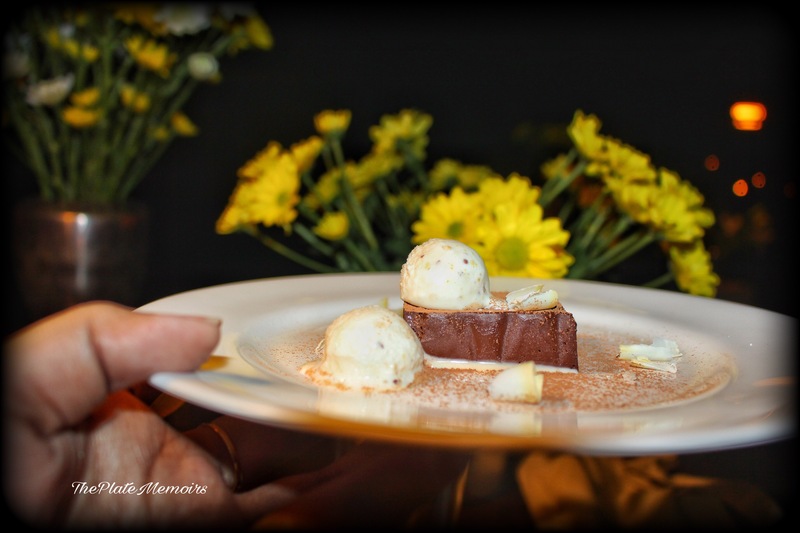 The Grub Story : The fare is an elaborate continuum of a 7 course meal. 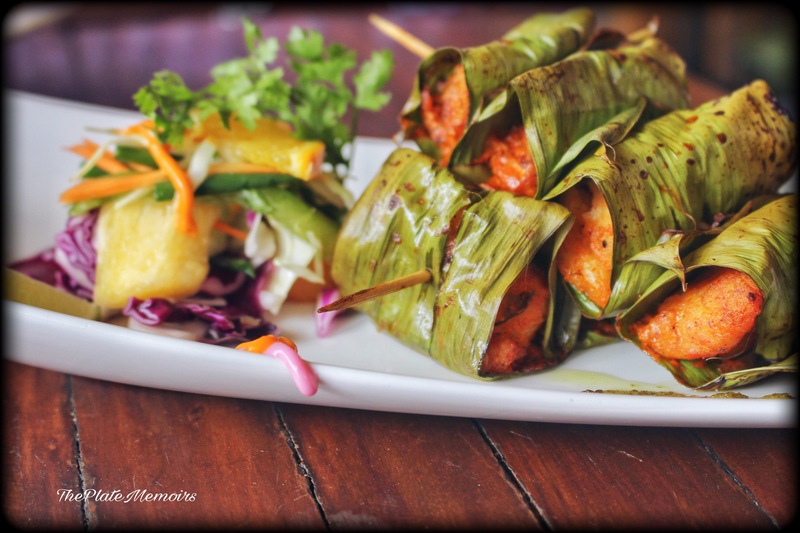 The cuisine style is European and there’s heavy emphasis on simple, organically sourced and exotic (in terms of Indian market availability) ingredients. 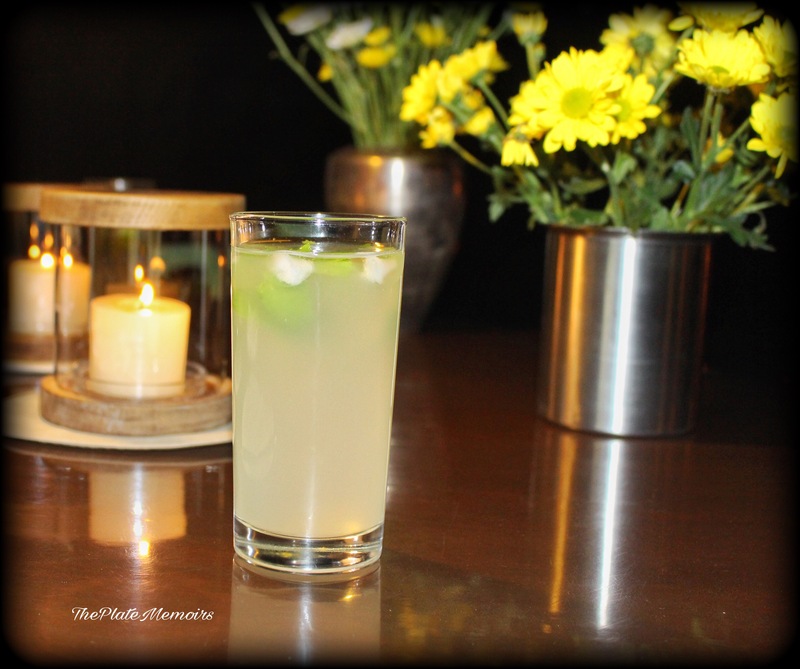 Ginger Mint Cooler : A chilled glass of the Ginger Lime Mint Cooler, proved to be a splendid boon. 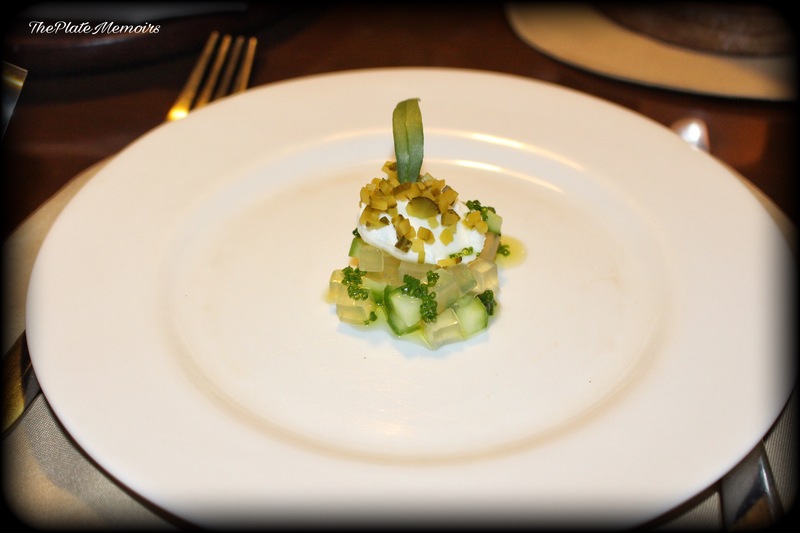 Cucumber gel with herbed cream cheese and gherkins : This amuse-gueule, was art on plate. The base note was a smooth salty one, with the freshness of the modernist cucumber gel that complemented the herbed cream cheese & lip puckering gherkin squares. Full marks for implementing the gelling technique. 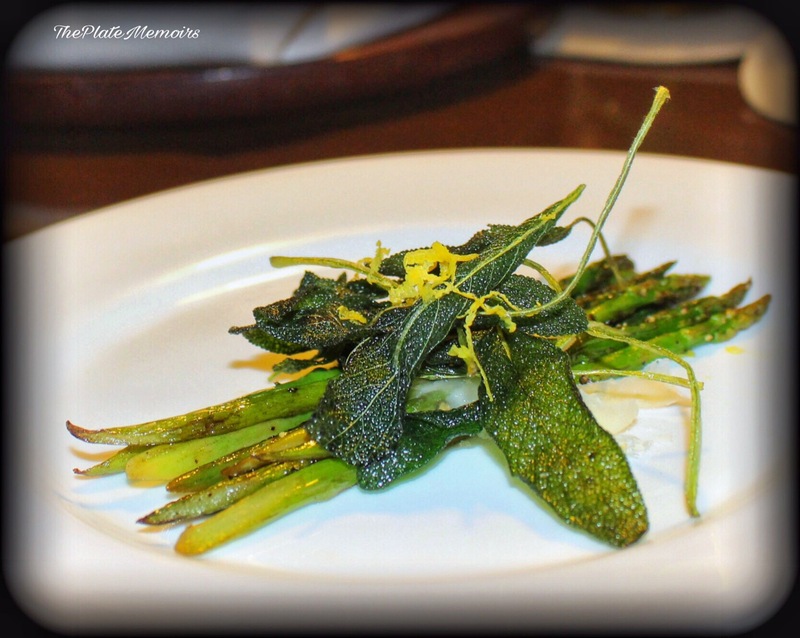 Asparagus with Crisp Sage and Parmesan : A perfect set of (maybe) buttered asparagus which just gave into the pressure of the knife and cut ever so easily, without any resistance. 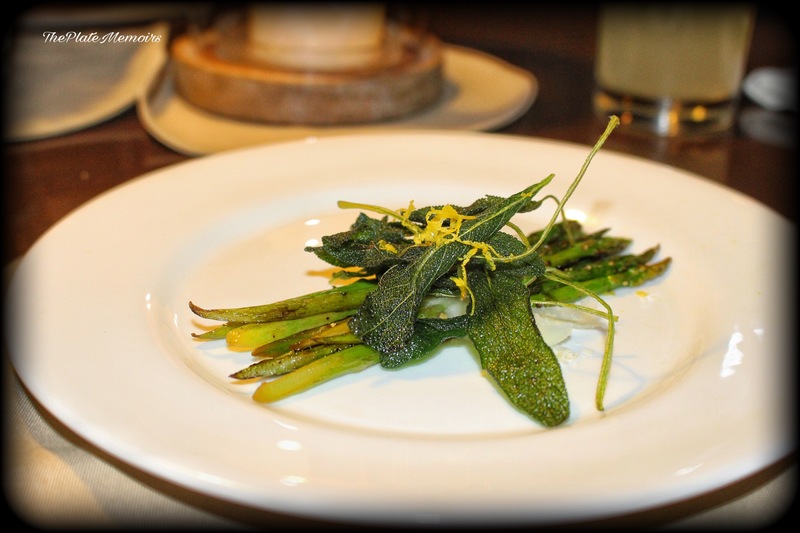 The crispy sage leaves were a deep hued green and crisp to the “T”. A lemony flavour was prevalent all across the dish and the nuttiness from the Parmesan, made me realise how simple flavours can be unrivalled. 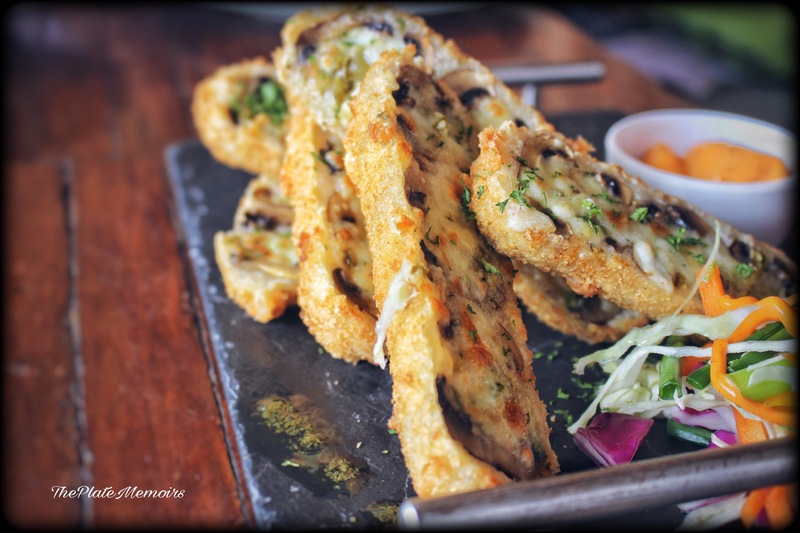 Smoked Aubergine Crostini : Give me a Crostini any day and I will gladly gulp it down. This was one of the best topped crostini, I’ve had in a long time. 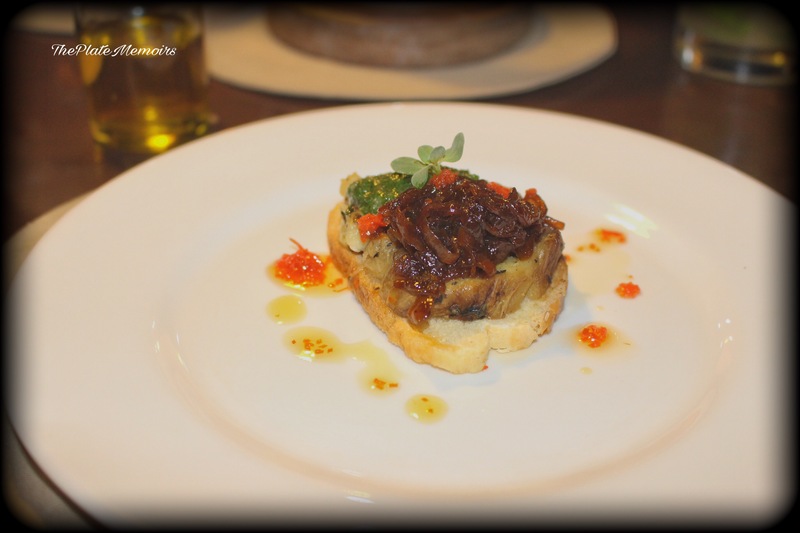 A crispy soft crostini with smoked aubergine, caramelised onions and walnut pesto. Though, it looked lacklustre, the flavour explosion made you addict yourself to it. The warmth of flavours from the aubergine, a distinctive sweetness of onions and the walnut pesto, were nothing but foodgasmic. 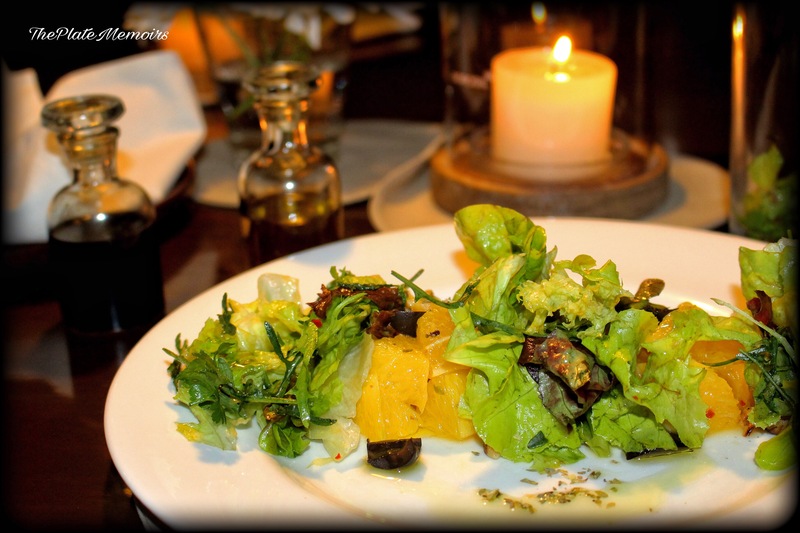 Orange Salad : A subtle medley of orange segments with black olives, walnuts and oregano. The Salad was the palate cleanser, which was much needed before our mains. Refreshing! Vegetable Terrine : It was Picasso on my plate, the colour palette, reminded me of “The Weeping Woman”. Google it, to know what I mean. 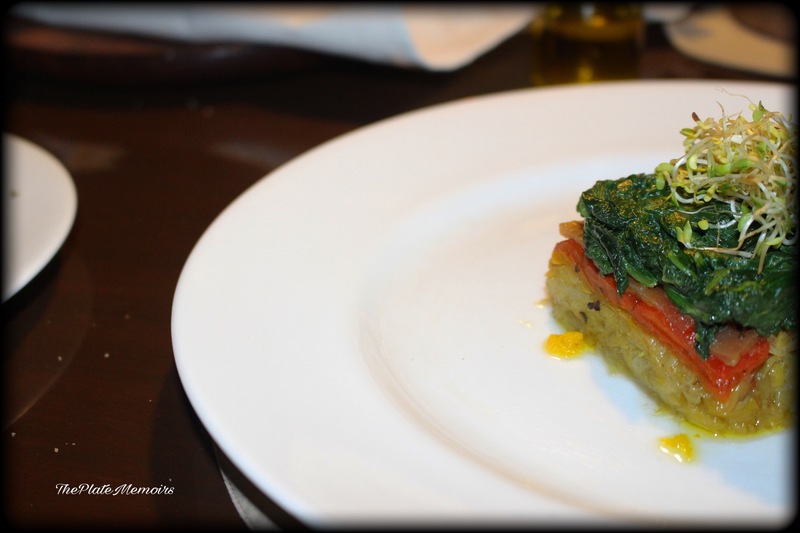 This vegetable terrine, consisted of leeks, potatoes, roasted peppers with creamed spinach. The colour play satiated my eyes and the flavour play, satiated my soul. The little square, looked ever so spartan, but was I, in a state of disbelief at the soirée happening in my mouth. The butteriness of potatoes coupled with the earthy tones of that spinach & the sweet hints from the roasted peppers gave a taste so complex, from ingredients so simple. This was the magic “Ben Okri”, spoke about. Grilled Zucchini and Broccoli with minted pea purée : I’m a pea purée fan, I love them in my Salads, under roasted veggies, on baguettes & almost everywhere, i can sneak them. So, I do know a great “purée de pois” from an average one. This was the great one. The introduction of Mint into the pea purée was a welcomed move. 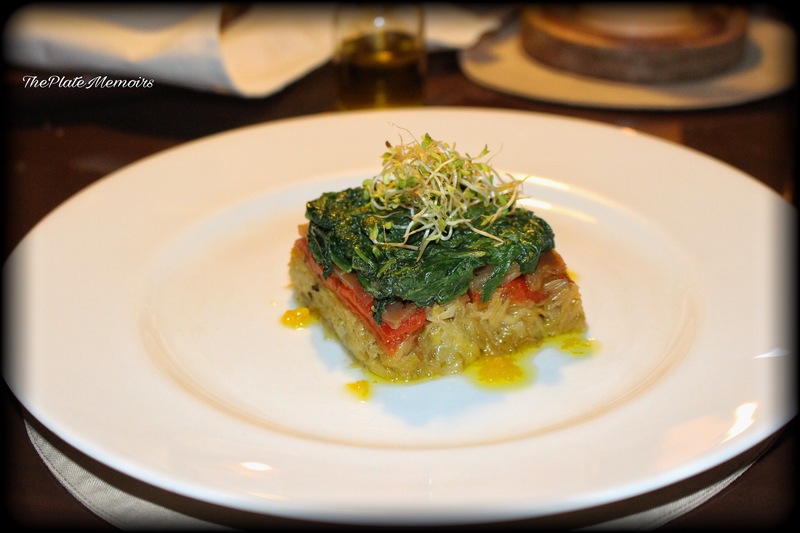 The dish was layered with grilled zucchini & potatoes. 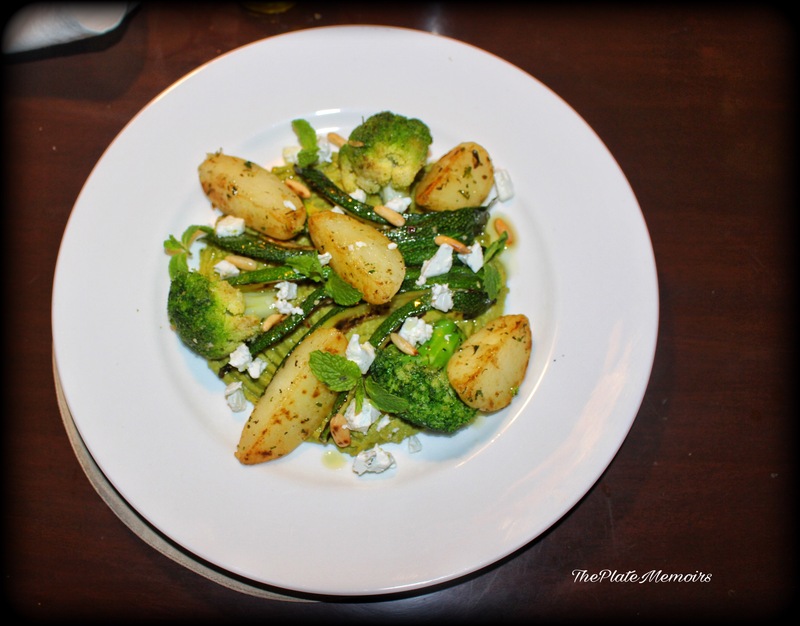 Buttered asparagus, took it up by the notch and the vibrant green broccoli in conjunction to the Feta & roasted pine nuts bowled me over. Never did I think, that all these flavours would work so well together. 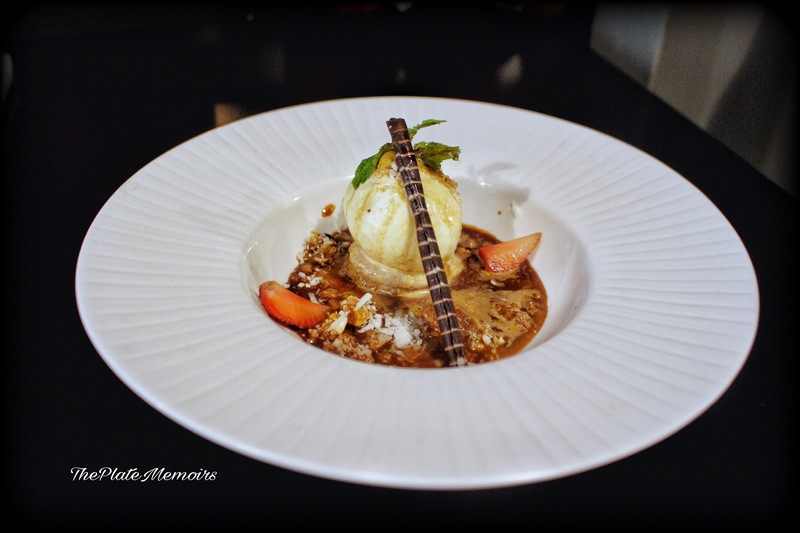 Lemongrass ice cream : I’ve filled my appetite with lemongrass ice creams, during my brief stint in Malaysia. I adore them. 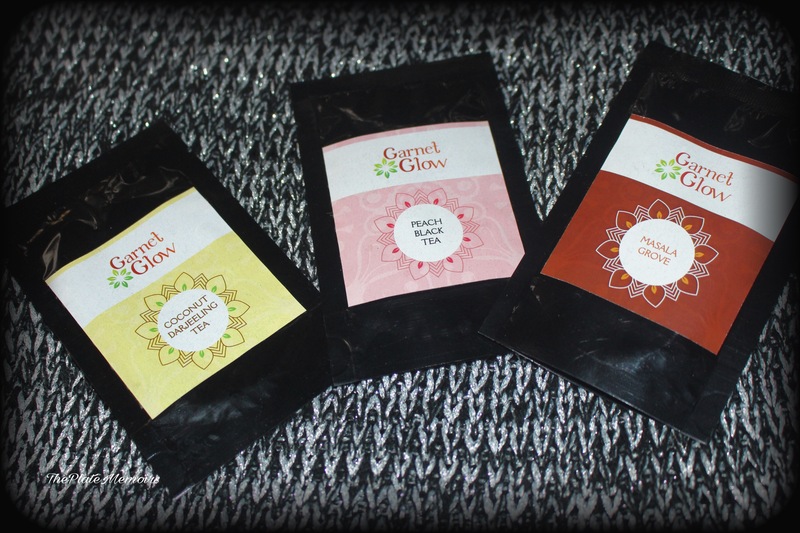 Love the citrusy infusion. Grasshopper, gave to me, a reason to revoke my love for it. The citrusy fragrance of lemongrass just wafted in, all around your olfactory senses. 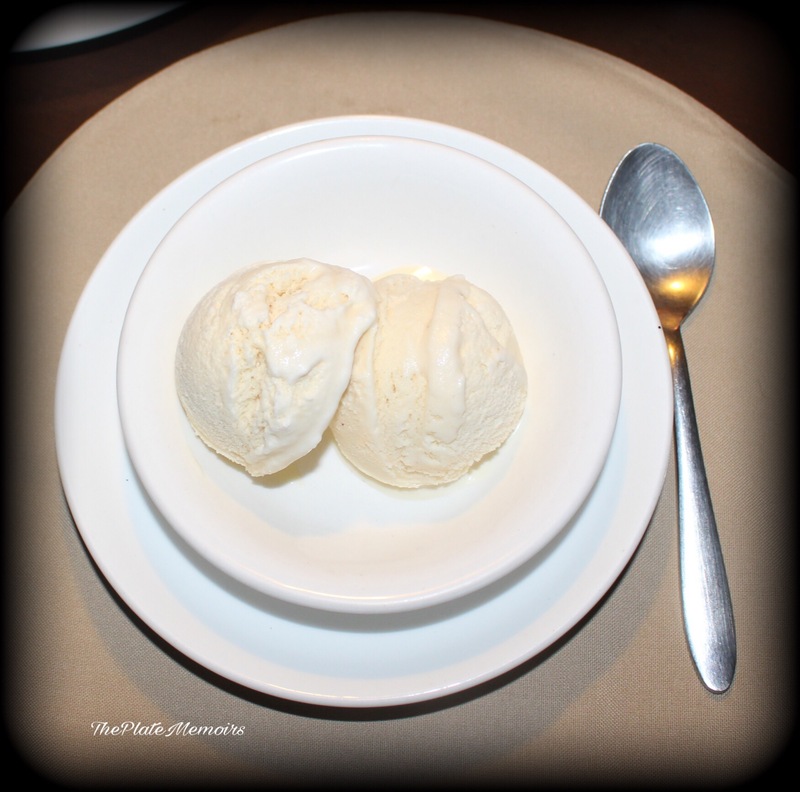 Organic honey and cinnamon ice cream : Another favourite & something I enjoyed immensely. 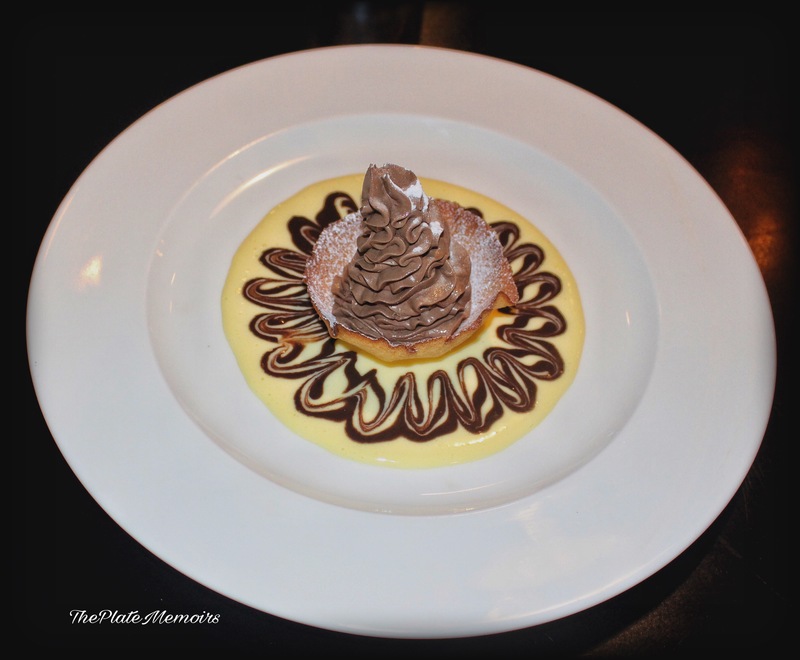 With the cinnamon, warming my palate and at the same time calming it, my love for this creme glacée, extends beyond words. Verdict: It isn’t a surprise that, I’m in deep throes of amour with this place. It’s just the perfect setting for your special day. Because, really you don’t need to dilly dally over anything, except giving time to each other. The chef, practises the art of “legerdemain” albeit in the kitchen, because he makes every dish look so deceptively simple, when in reality, it’s not. A 7 course meal for two costs at around ₹5000/- + taxes. A 5 course meal for two costs around ₹4000/- + taxes. P.S. 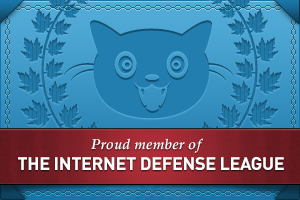 : The logo has been sourced from google images, for representation purposes only. Well, I’m asking you quite literally, when “Mango” is the fruit in question. Would you? Allow me the privilege to save you from that precarious situation & pamper you with Mangoes at the comfort of your chair or if you’re fancy shmancy then, in your Bergere. Remember how, each Indian childhood has a page dedicated to Mangoes? It’s either the collective scavenging with friends or the sweet aroma of mangoes wafting when your grandmother or mother peels them or just craving it immensely. Does this ring true? Read on. 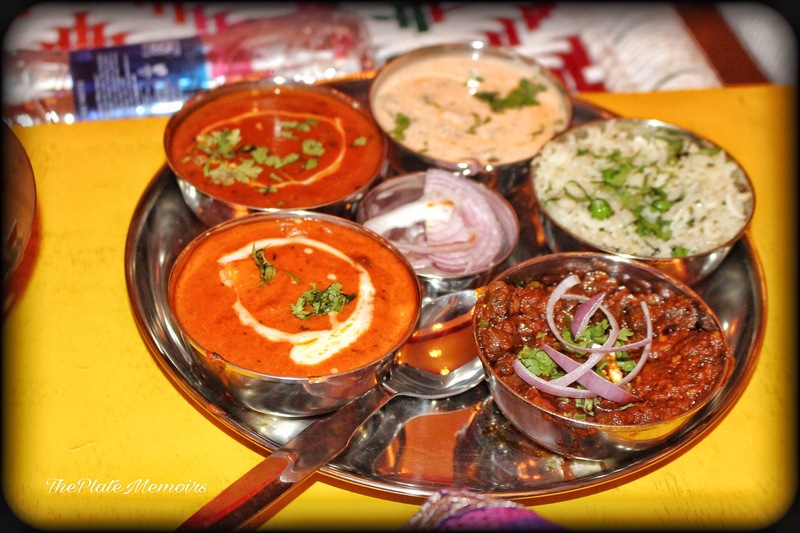 Rajdhani, is a well seasoned name, in existence from the past 50 years. It is the flagship brand of “Mirah hospitality”. This vegetarian Thali restaurant, tries to break the stereotype of Thali restaurants being boring. With the cuisine concentrating on “Rajasthani & Gujrati”, you will be pleasantly surprised to see 72 rotating menus, to keep you entertained. Decor : A very polished feel to the decor having deep tones with contrasting neutral tones to balance the colour theme. The upholstery is comfortable and fair enough. The ambiance is casual as well as unhurried. An elegantly relaxed place to dine in. Hospitality : I, just can not employ enough words to tell you, how much they pampered us. With the aarthi being done, the tika being applied & the act of partaking a small piece of ladoo, while entering the “Rajdhani” premises, the guest feels like, there really can be no place better than this. From the usher to the maitre d’, everyone was passionate about their job. Extremely courteous staff. 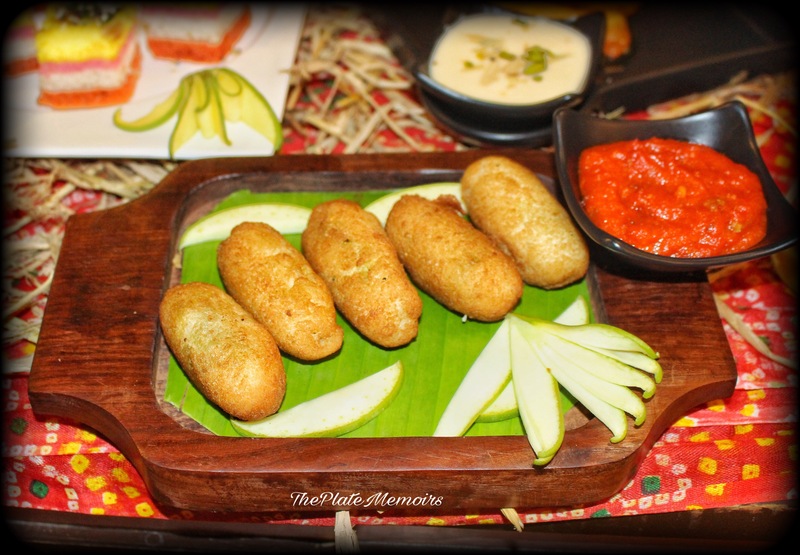 The Grub Story : I, was quite eagerly anticipating the “Aam festival”. I had to put that little tick next to the food bucket list, after all. The Thali was a gorgeous masterpiece. Though, we started off with an empty one😜, by the time it filled up, it looked like a charm. 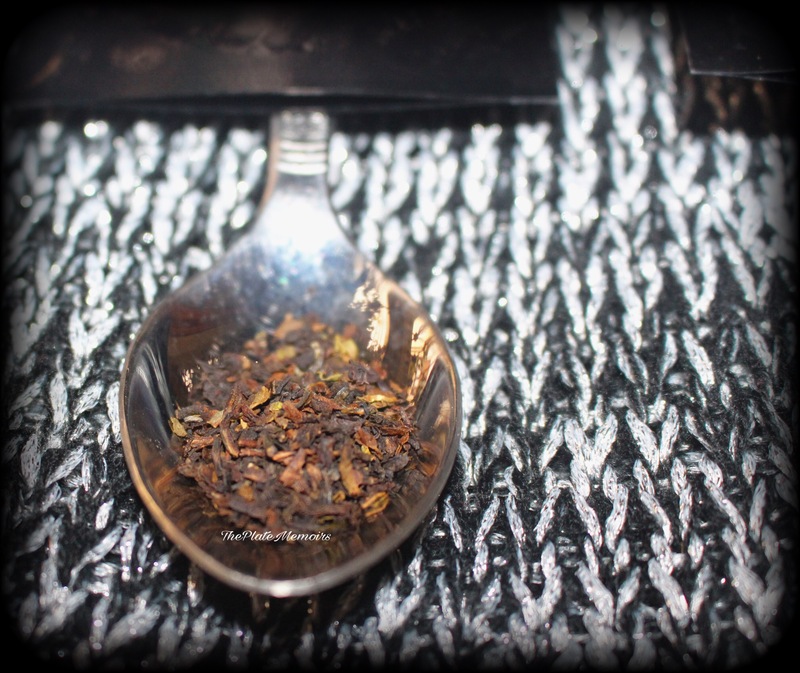 All of which were extremely smooth & flavourful. My favourite was the Aam lassi, for its subtlety. 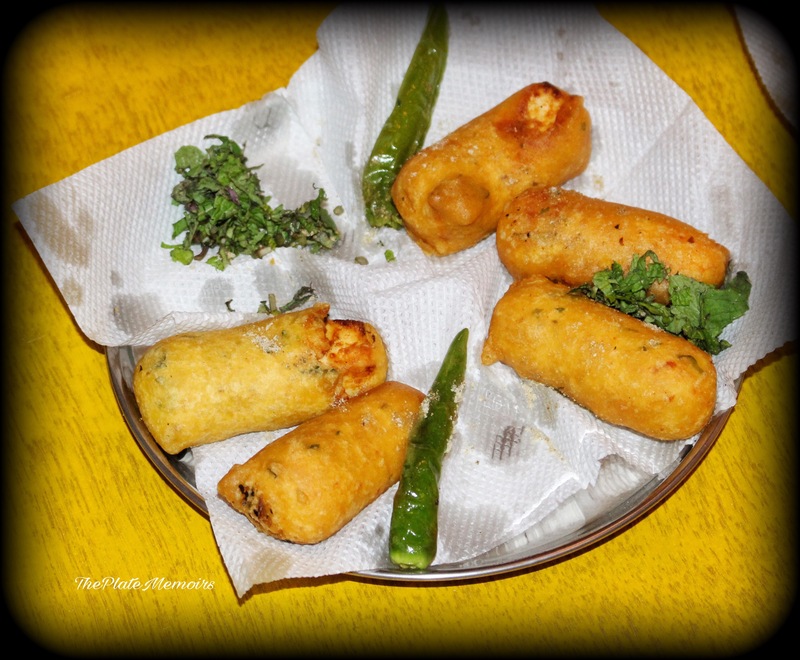 After the drinks, our Thali started getting filled with an array of Farsan or fried snacks. 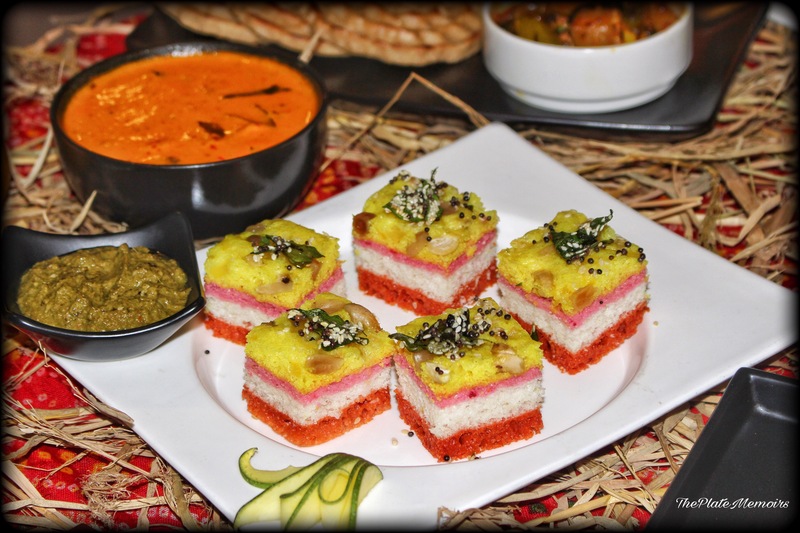 Shahi Aam Dhokla : A pretty looking dhokla with quad-coloured layer. 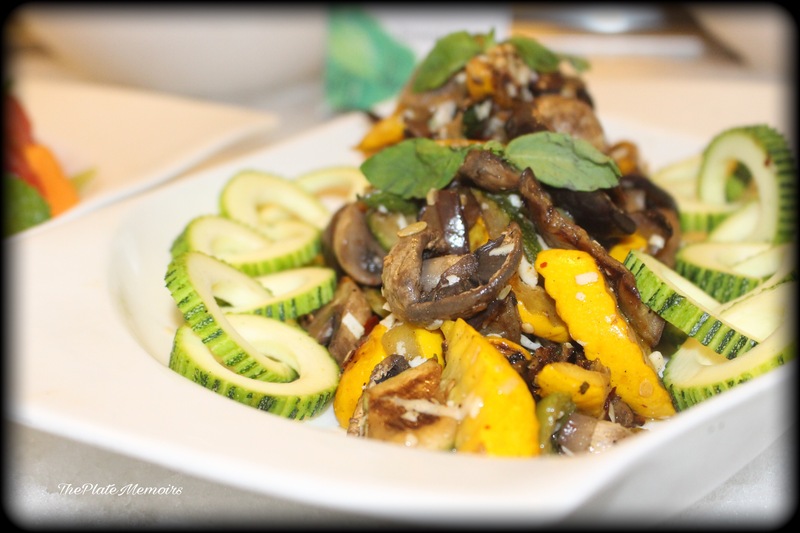 The flavour of mango was very pronounced and made this an enjoyable munch. 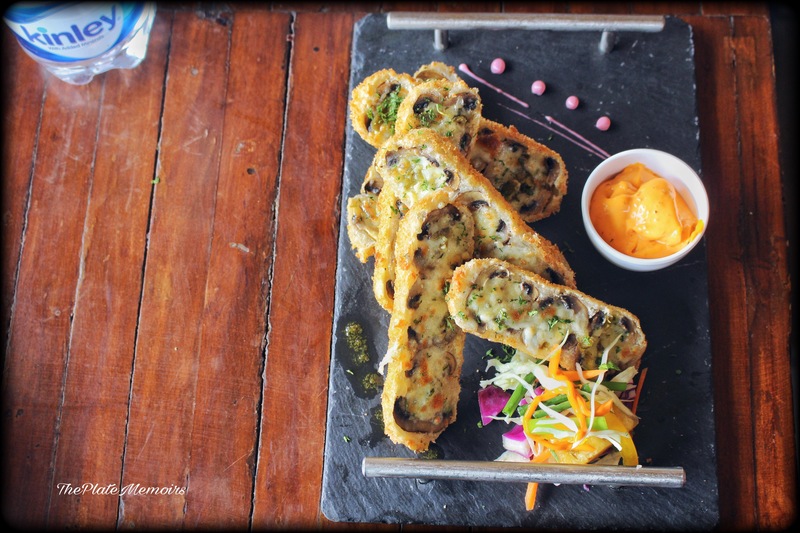 Kairi stuffed bread roll : This was an ingenious dish in which, the raw mango’s sourness was masked well with spices. The result was a bread roll with tiny hints of sour notes. 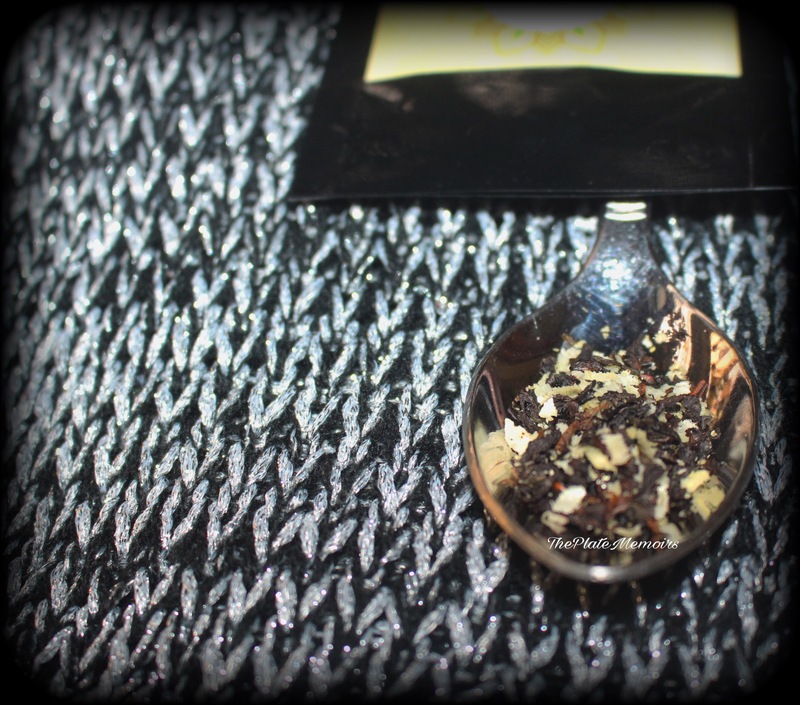 Chatpata Kacha Kairi Muthiya : Worked on the same sweet-spicy tones, with an extremely soft texture. 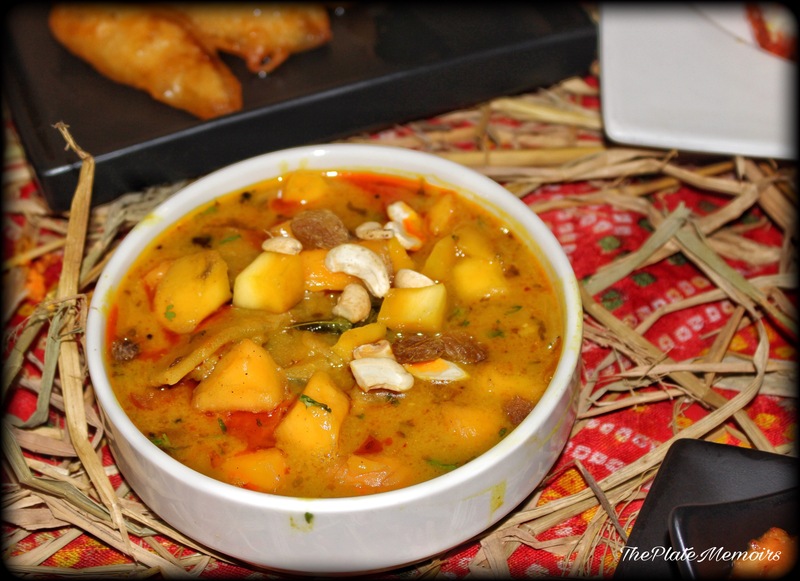 Mango Dryfruit Ghugra : A subtle Ghugra with minimal flavours. Now, after the Farsan, we started with the curries & rice. A choice that spoilt us and had me tethering to my seat, even after the event was over. 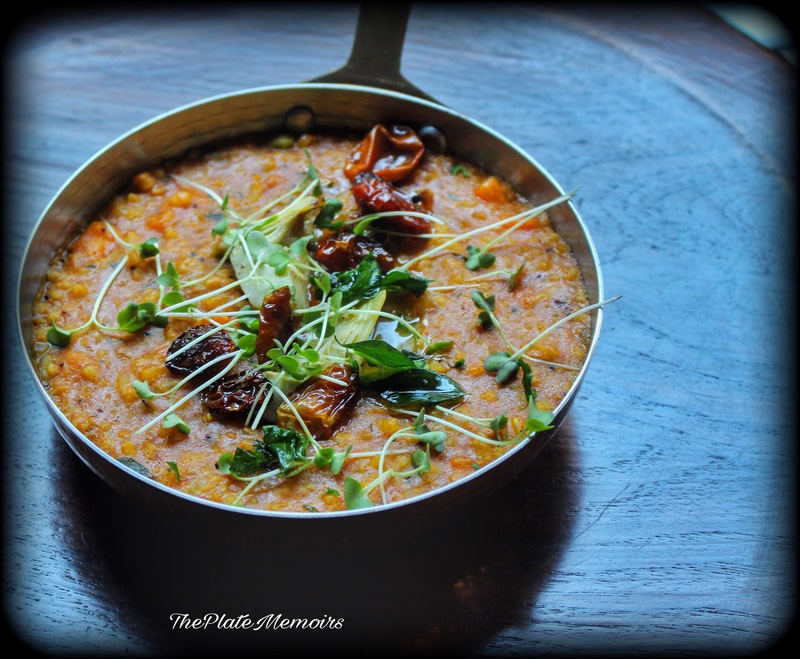 What made me go gaga, was the “Mango Dal”. Oh my goodness!! What a burst of flavours, playing up in your mouth. 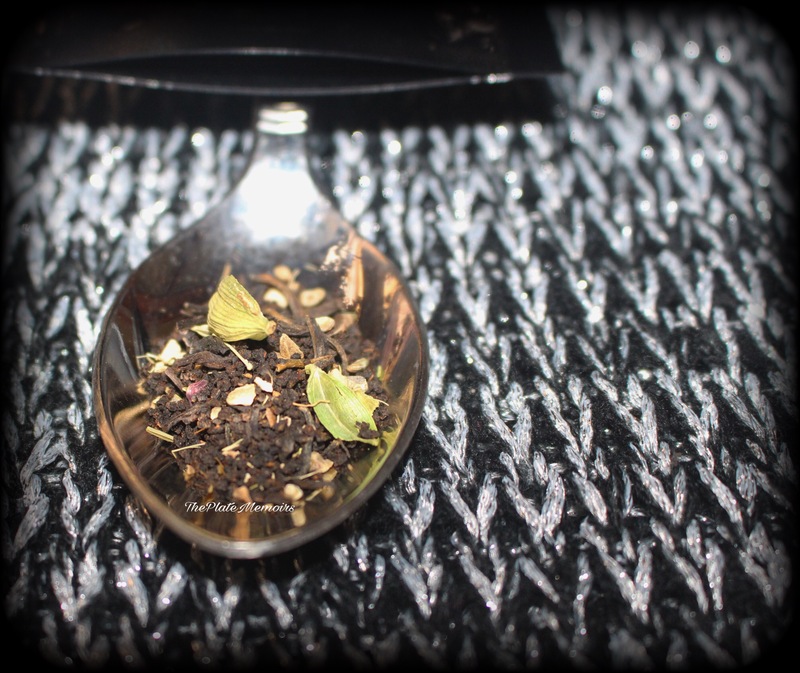 Having said that, the flavours complemented each other and didn’t at any moment clash. Another star was the “Aam ki Launji with Khoba Roti”, which was a new experience for me. The Aam ki launji, was again a sweet-spicy dish, with the base note being spicy and hints of sweetness due to the added sugar. 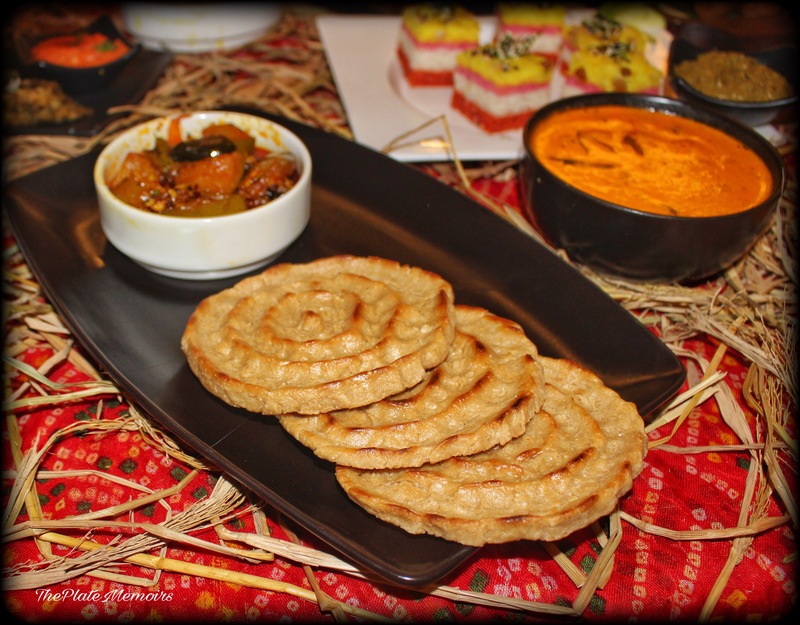 It had the warmth of carom seeds deep through the dish and went great with the Khoba Roti, which is an impressive flat bread. 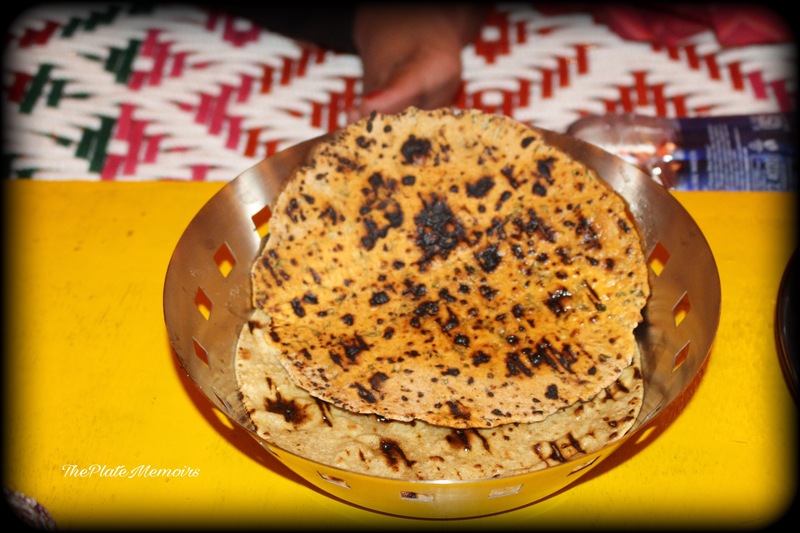 This Roti, is much thicker than the normal rotis, with a crusty exterior and a soft interior. It’s almost like a hybrid between a roti & a biscuit. Oh so yum!! 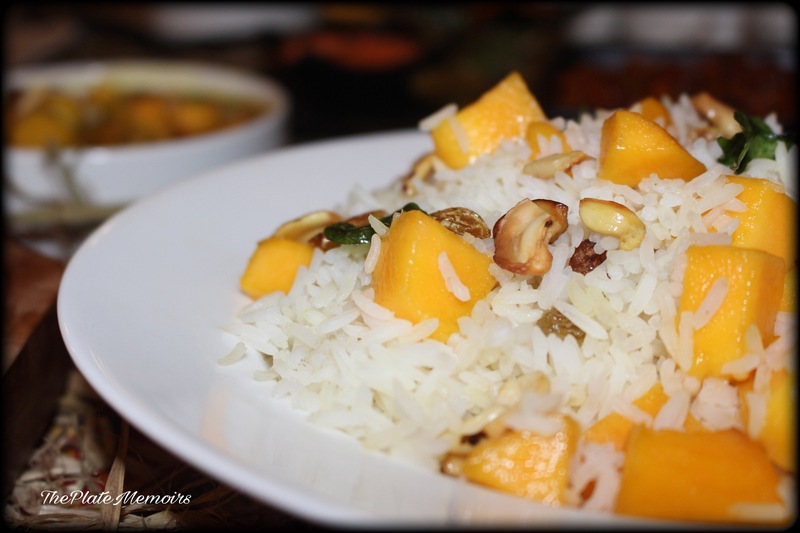 The Mango Pulao was packed with just the most clean flavours and hint of sweet acidity from the mango. Impressive! At last, we were given desserts, which weren’t many, but just 2. I was, hoping there would be more, but I wasn’t disappointed. Amrakhand, isn’t something that I haven’t tried, no novelty here. Faired fine with my tastebuds. But.. the “AAM JALEBI”, made me fall in love again. What a well thought dessert. I would’ve eaten just the jalebi for the meal and walked out happy. 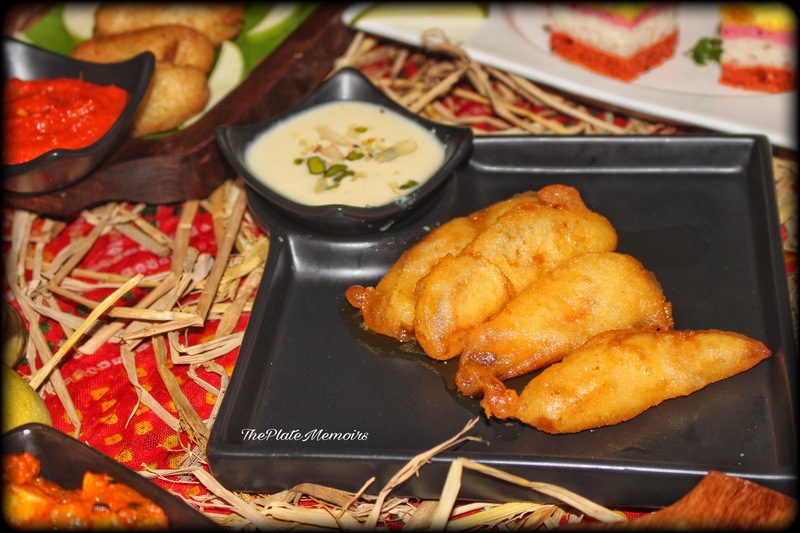 The Mango slice was dipped in the Jalebi batter and fried. Then generously dipped in the sugar syrup. A sweet sour harmony of notes, which makes you want for more. 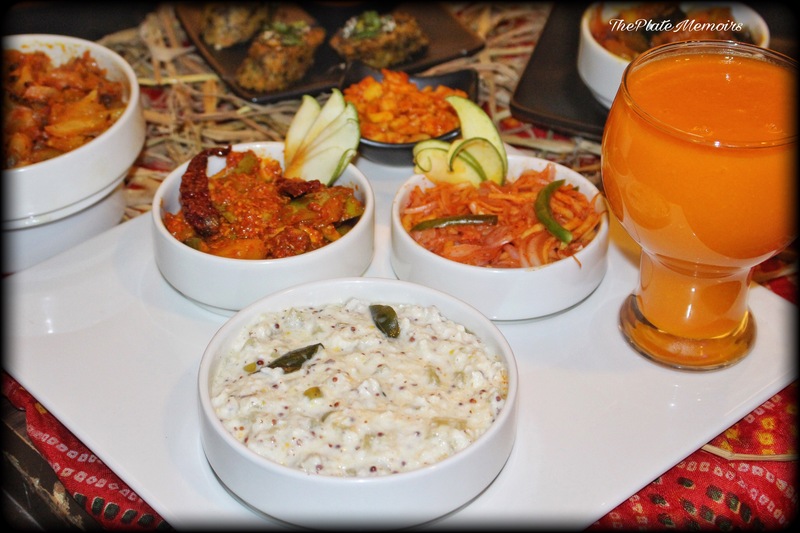 Served with mouth watering Rabdi on the side. Verdict : Being an individual, who doesn’t really fancy mangoes (yes, i’m the first in that category) I enjoyed the Thali a lot. There were staunch favourites and some average curries as well. 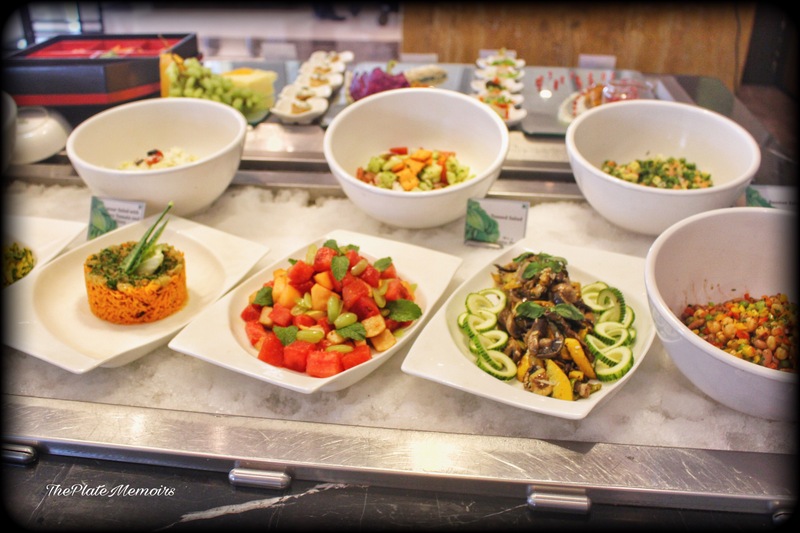 Aam festival is Rajdhani’s take on the summery weather, where everyone wants to indulge in the “King Of Fruits”. 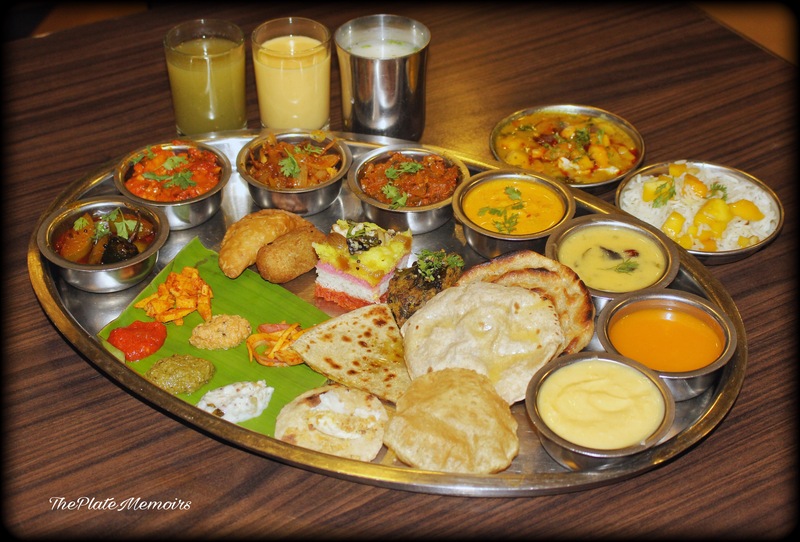 The Thali retails at Rs.450/- lunch and Rs.499/- Dinner. The Aam festival, goes on till June. 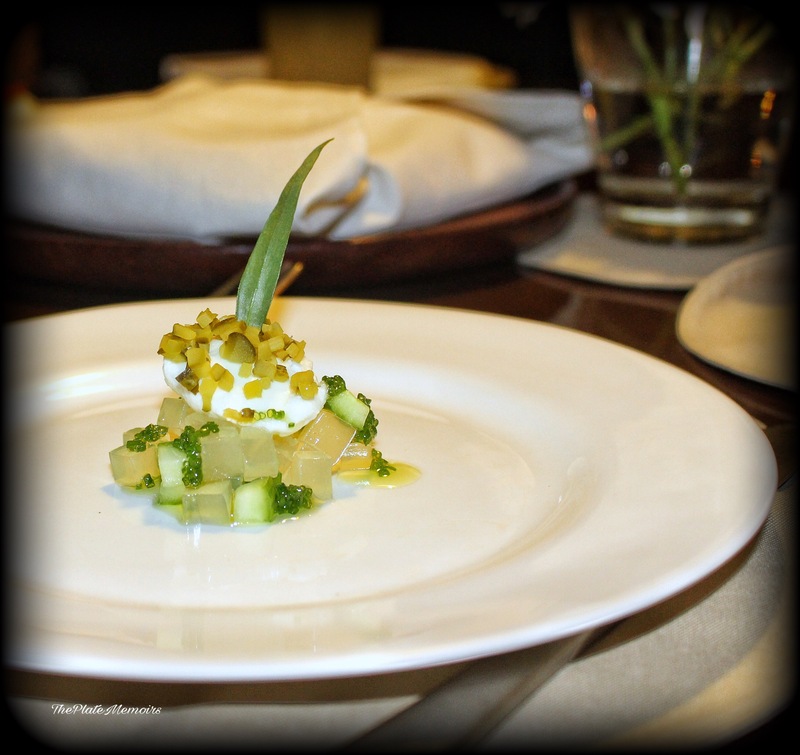 Rajdhani celebrates the #Aamlicious arrival of Mango, by incorporating mango in all their dishes. It’s a treat, if you’re a mango lover. Something to take you down memory lane, albeit on a different route. Here’s a 4 star for it. So, primarily for this reason, I decided to venture out into the depths of my favourite cuisine- Italian. I, had to look no further than “Toscano”. 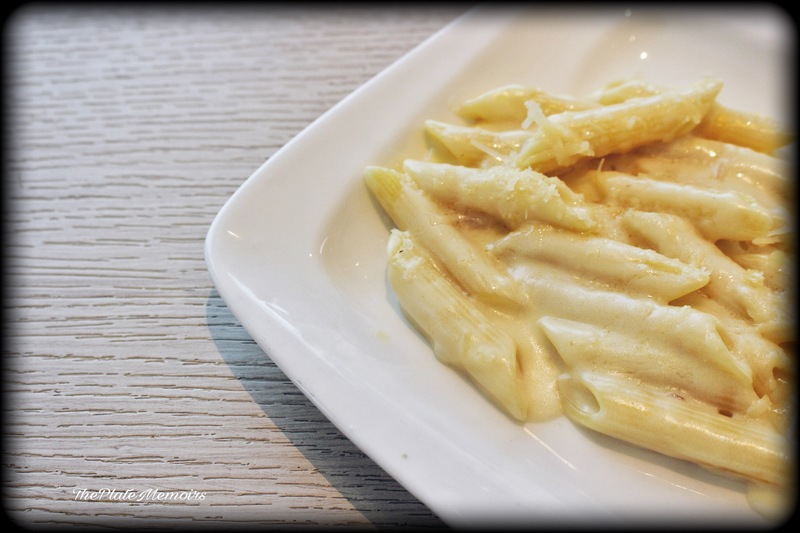 After all, I decided to debunk the magic part of Fellini’s quote and prove that “Life”, is all about pasta. Etched into the viridian hues of Italian landscape are the real essences of Italy. It’s culture, it’s celebration of food & wine and the rapture of love. It’s a trattoria styled restaurant with a bar. 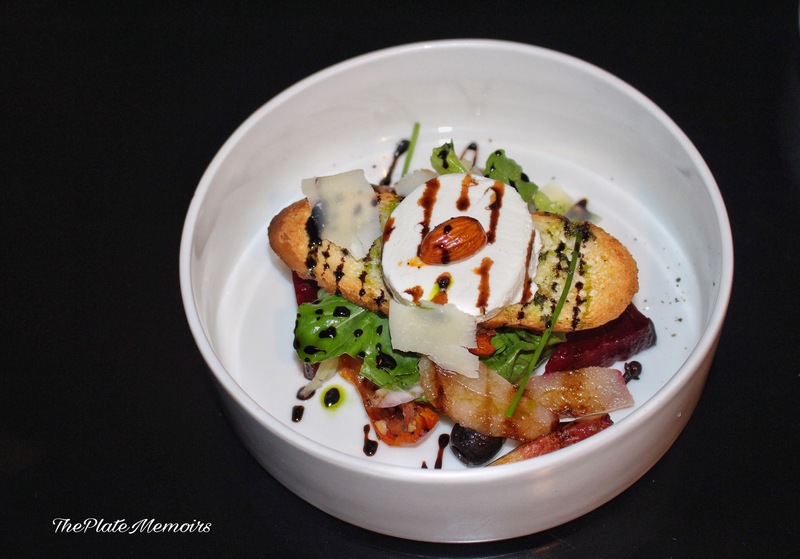 Toscano believes in simplicity of dishes, rather than complex flavours that confuse you. 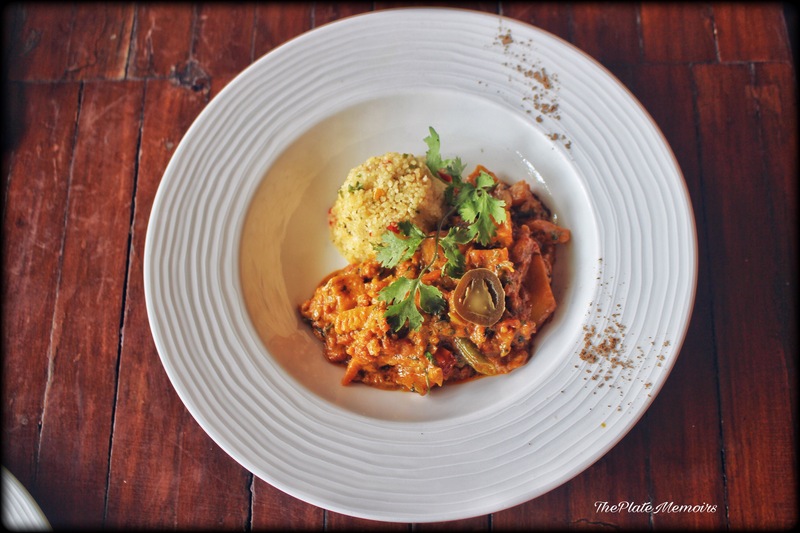 With the main aim of proffering authentic “Italian” food to the Indian palate and sensitising it, to the food culture, Toscano was conceptualised by “Jean Michael Jasserand”. Decor : Heavily prevalent of a roadside Trattoria, the template of fern green colour as an accessory in creating the over all look succeeds. The restaurant beautifully encases a part of Italy, in it. 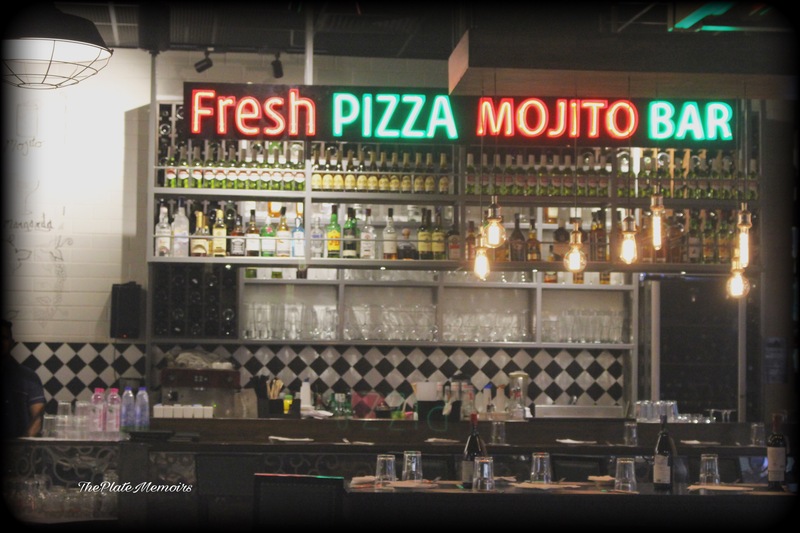 Neon boards flash across with “Pizzeria” written on them and I’m half expecting an Italian to wow me over now. The ambiance is relaxed and casual elegant. Hospitality : Right from the usher to the maitre d’, everyone made sure that we enjoyed our experience. The wait staff are highly experienced and knowledgeable in their affairs. Mr. Suprabhatt and another gentleman whose name I’ve forgotten, were a charm in handling our table. Timing, speed and execution were spot on. 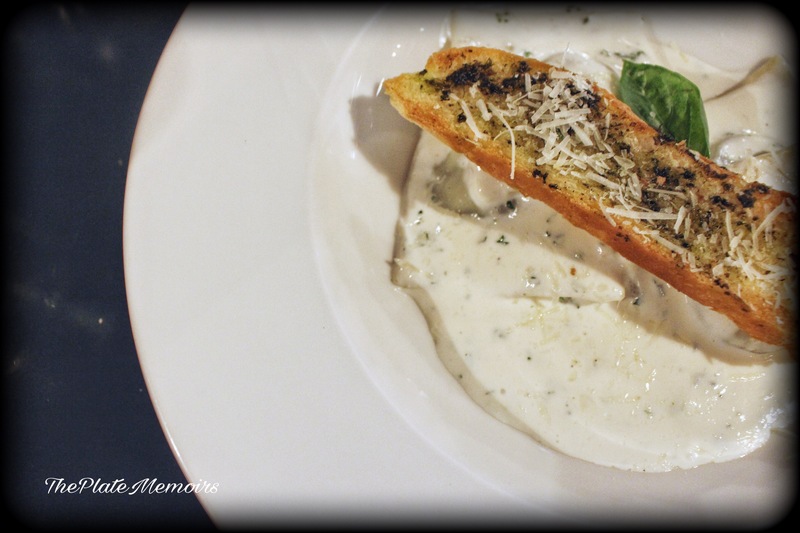 The Grub Story : Each dish was beautiful rendition to its counterpart in Italy. Goat Cheese, Rucola and Pear Salad (Rs.345/-): A beautiful pop of colour, with rocket, young spinach, toasted almonds, pear, baby beet and aged Parmesan shavings. The flavours were fresh and the punch of that Goat cheese was immaculate, with some balsamic dressing to bind it all together. 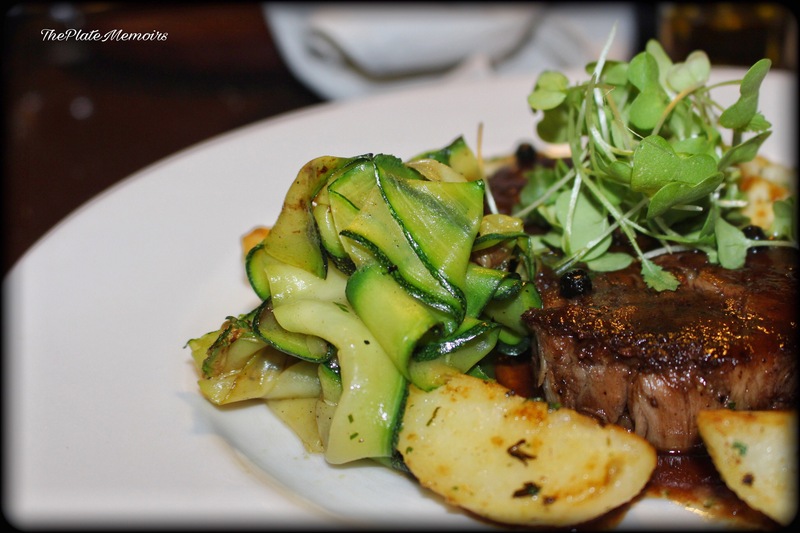 The palate was pleased and the appetite satisfied. 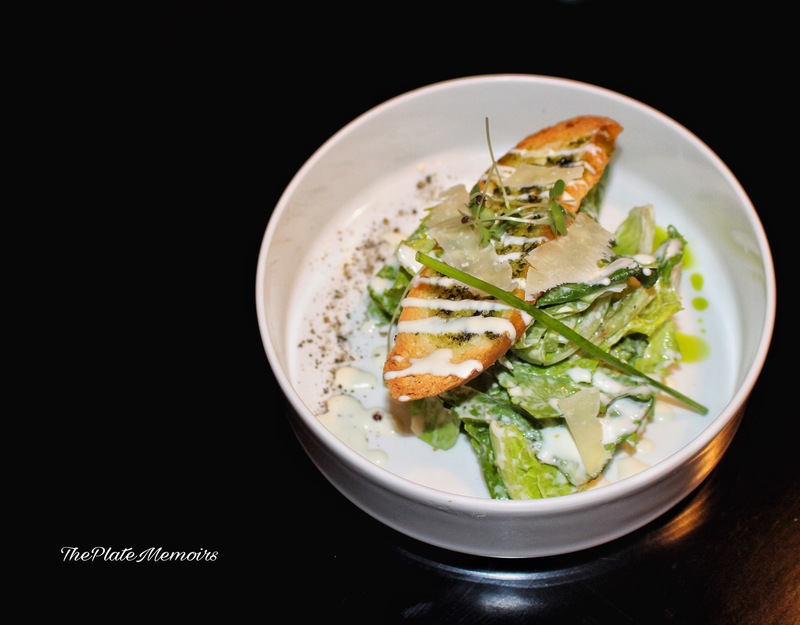 Toscano’s Caesar Salad (Rs.325/-) : With just the bare necessities of crisp romaine, homemade garlic croutons and aged Parmesan in a herbed oil dressing, this one blew our socks off! 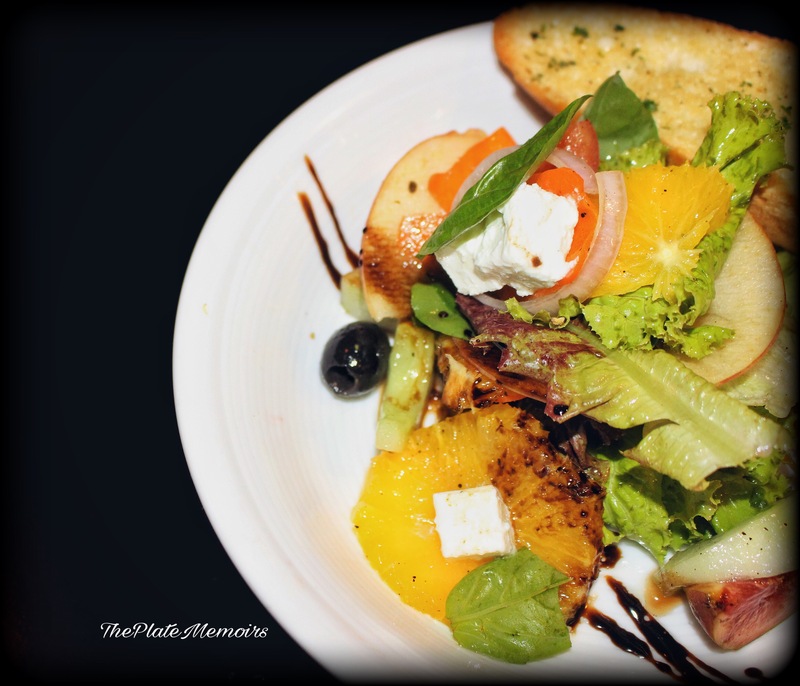 Citric Fruits and Feta Salad (Rs.325/-): Oranges, Grapefruit, Cucumber, Apples and Carrots all tossed in an in house dressing. The acidity of the citric fruits was balanced quite well with a subtle sweet tone from the dressing and the salt factor from the Feta. 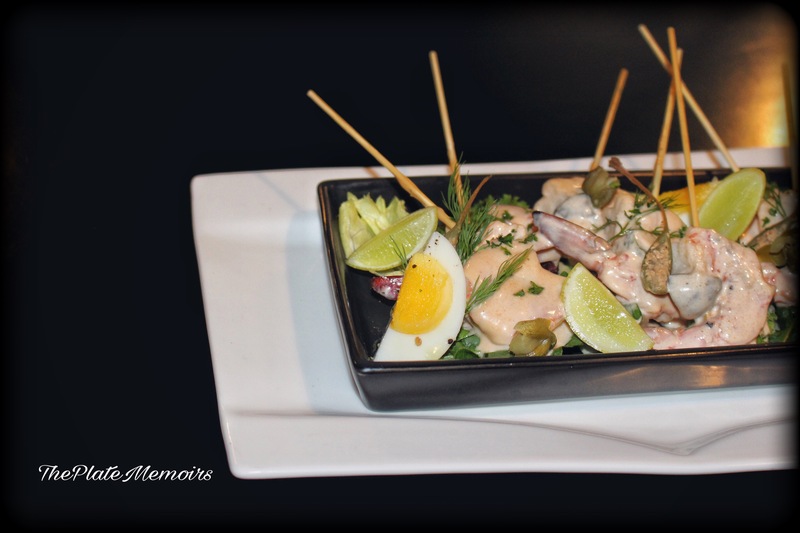 Tuna Nicoise (Rs. 365/-) : Looked every bit of fop, with perfectly hard boiled eggs and bits of tuna. 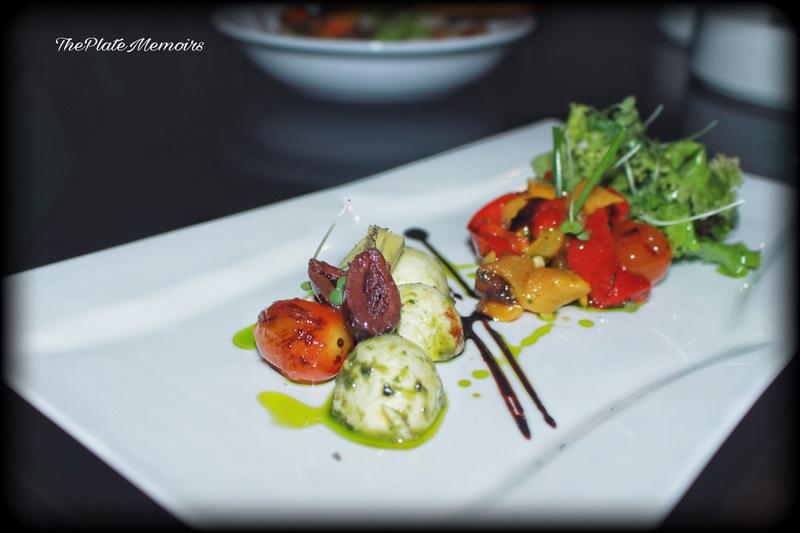 Caprese Classic (Rs.385/-) : Marinated tomatoes, buffalo mozzarella served with melon, rocket leaves, olives and basil pesto. 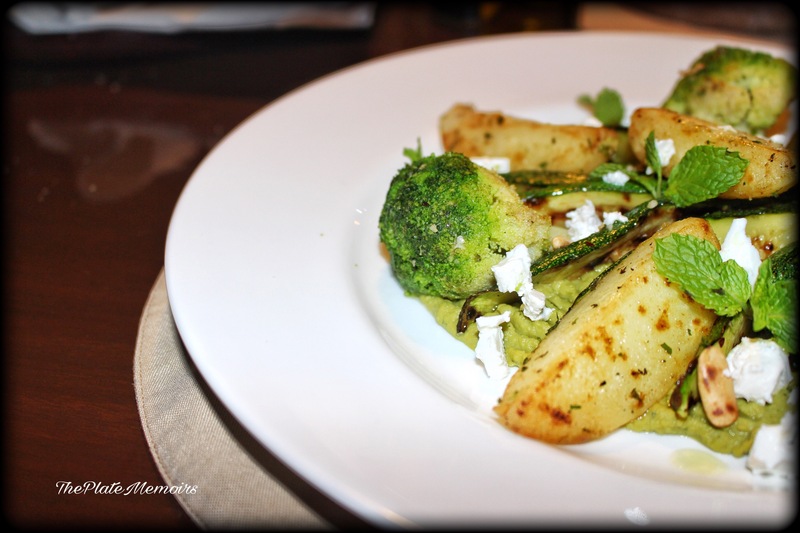 The earthiness of the flavours hits your palate and trust me, you will be more than pleased when the light saltiness of that mozzarella meets the peppery basil pesto. The tomatoes impart a distinctive sweetness as well. 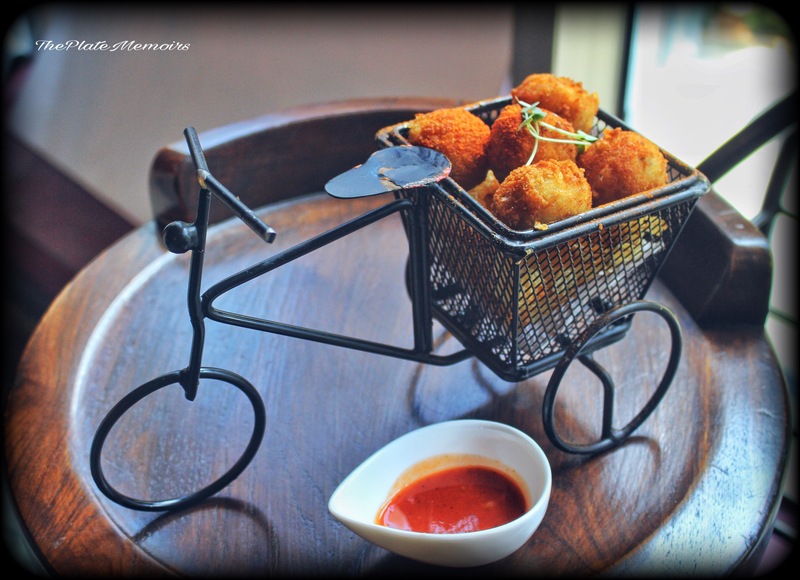 Spinach, potato and spaghetti croquettes (Rs.345/-) : Crumb fried Croquettes served with aioli and finger chips. This was a personal favourite with the crispy exterior meeting it’s match at the mushy interior with that spinach and potato gooeyness. 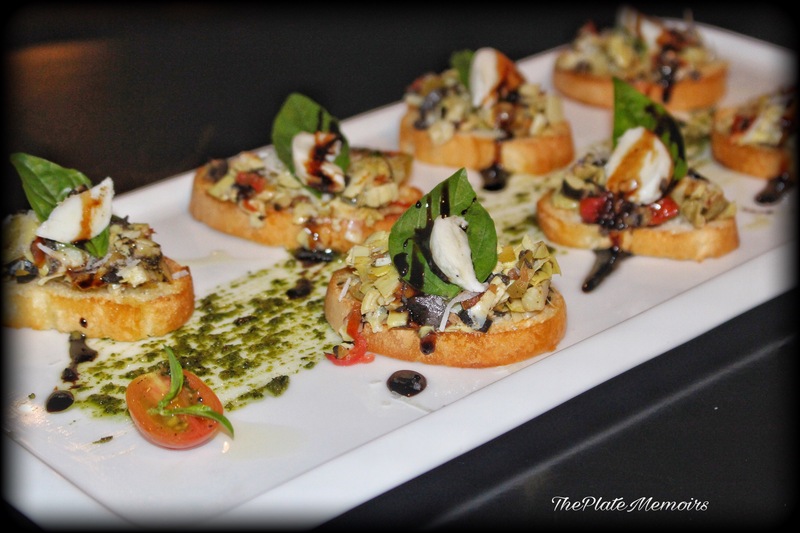 Olive and Feta Bruschetta (Rs.345/-) : The bruschetta was a magnificent piece of flavour with the Feta, mixed greens, Balsamic and Basil. They were beautifully crunchy with a soft bite. Homemade Spinach & Ricotta filled Ravioli (Rs.515/-) : The joy of just sinking your teeth, into something so pleasant is enough. 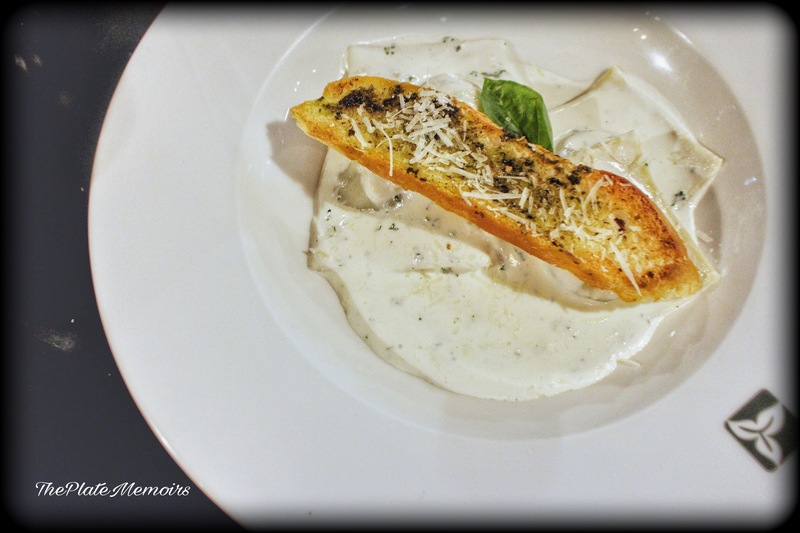 The sauce was a stark white, chive cream one and the Ravioli was done with that distinctive firmness. The filling in the Ravioli made my heart melt. Overall, a great dish. Homemade Pumpkin & Ricotta filled Ravioli (Rs.515/-) : Another beauty with a nice pomodoro sauce. Had that tang to it and was as delicious as it’s creamy counterpart. 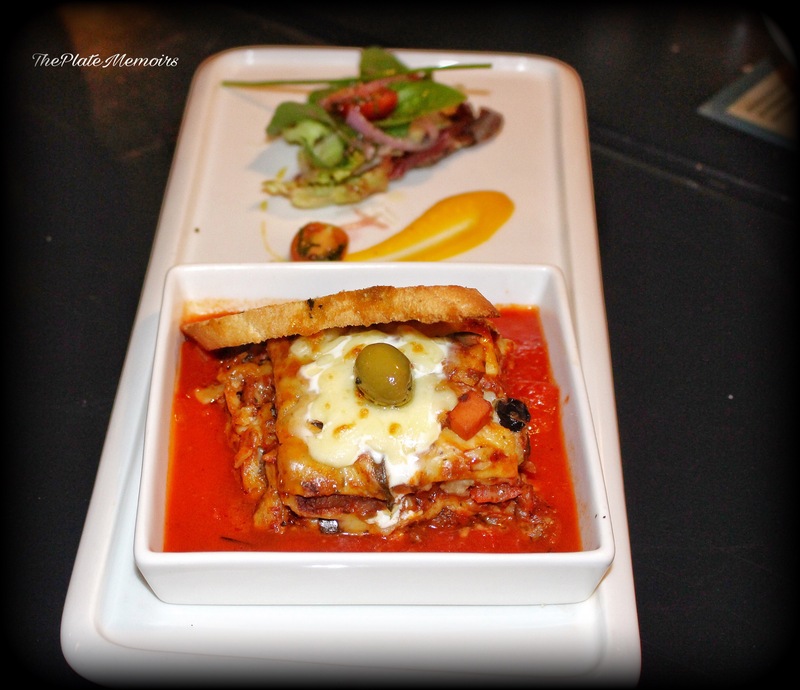 Lasagna Verdue (Rs.515/-) : Oh Lord! The flavour, yes the rich and deep flavour. That pomodoro sauce was just the right kind of acidic with the warmth of those baked veggies and the gooeyness of mozzarella. Not to be missed. 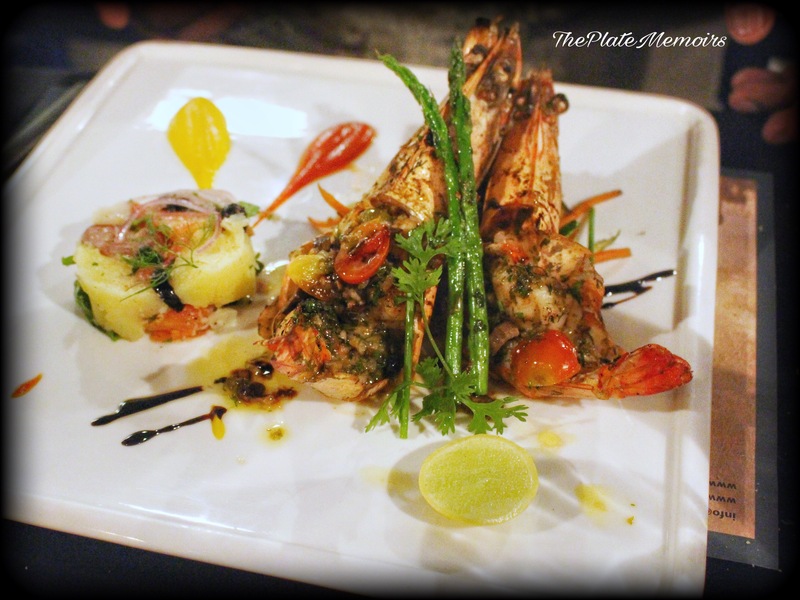 Tiger Prawns (Rs.925/-) : Looked gorgeous, but I wouldn’t be able to tell anything significant. Chicken De Toscano (Rs. 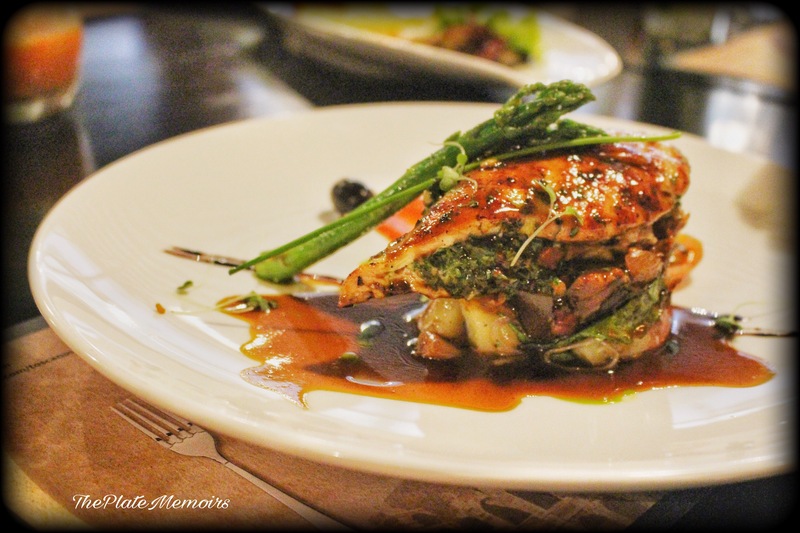 545/-) : What a delight, it was seeing the chicken breast stuffed with ricotta & spinach dripping with its own gravy. Made me wanna abandon the vegetarian in me. 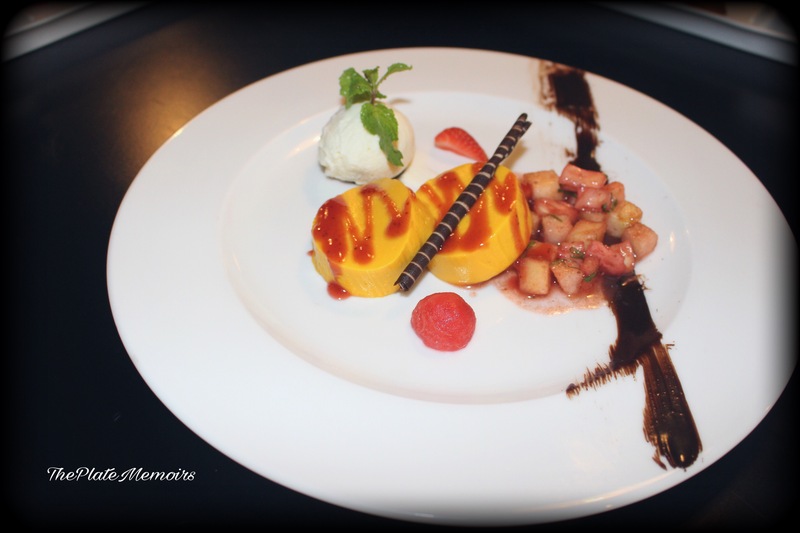 Mango Pannacotta : served with mint, Fruits and vanilla ice cream. Affogatto al caffe : A delightful Italian favourite. 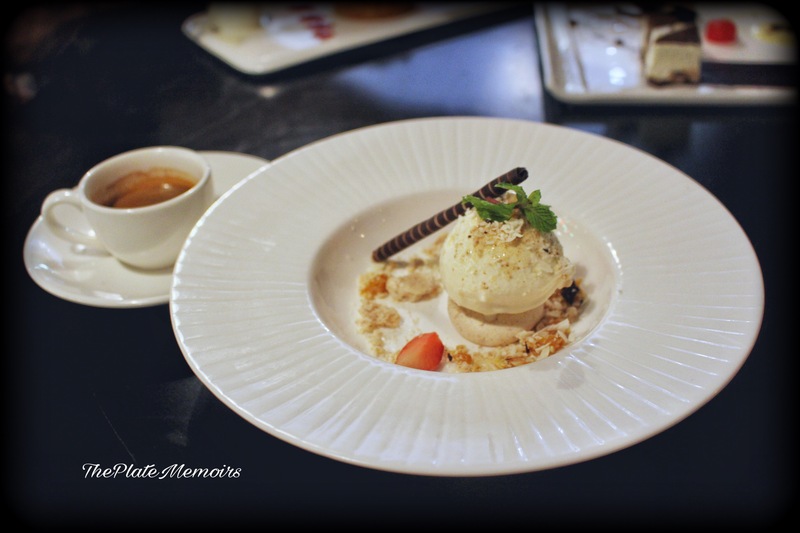 Your vanilla ice cream topped with Italian coffee and amaretto biscuits. 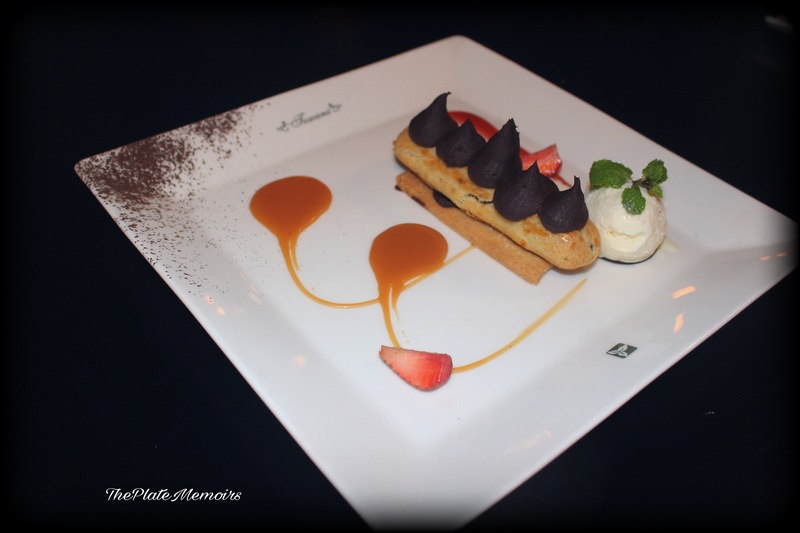 Chocolate Eclair : Heart and soul warming. Looked every bit of love on a platter. My favourite! Verdict : What’s not to love, when you are taken on a food trip through the by lanes of Italy, stopping at every trattoria that comes your way. 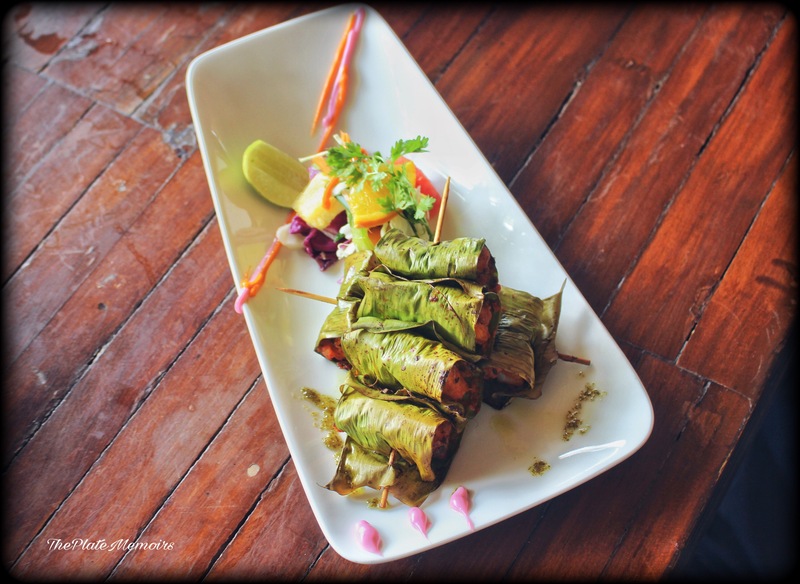 Relishing & diving in love with the cuisine. 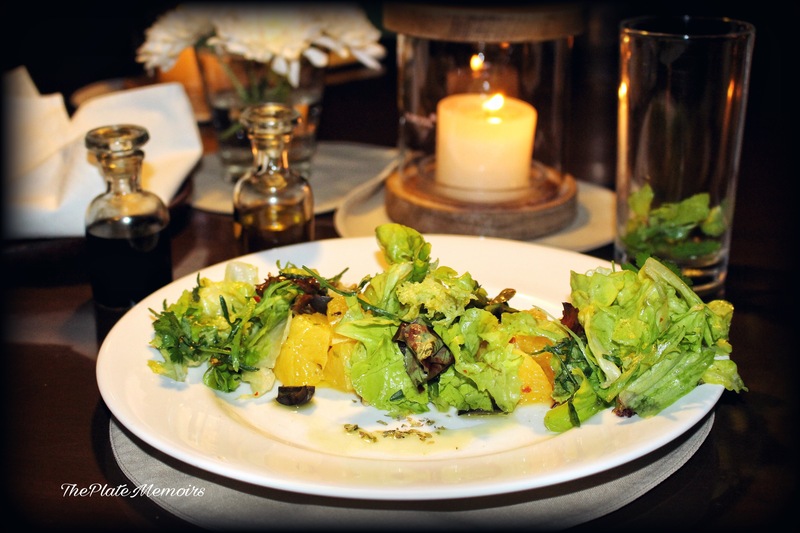 A worthy place to visit & familiarise yourself with the simplicity of Italian cuisine. 4 stars for this beauty! And, that is how precisely, the group of us found ourselves around a table full of food. 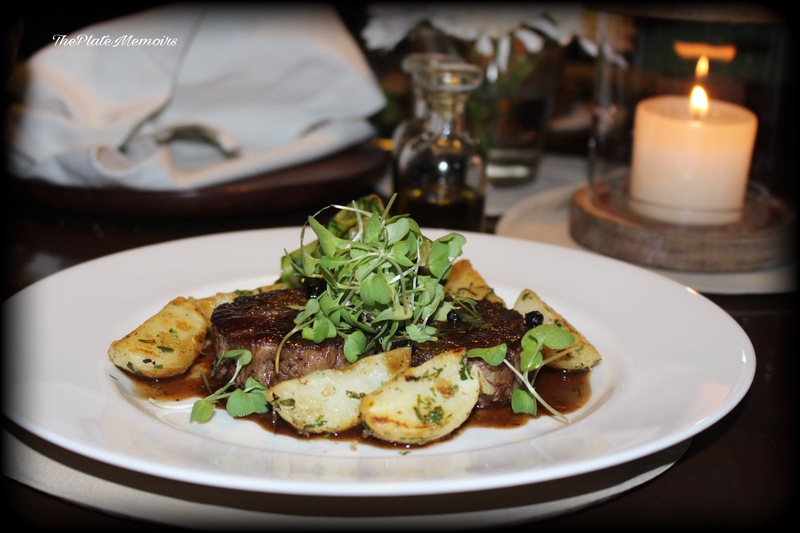 Having been proclaimed by many, to be one of the best restaurants in Bangalore. It wasn’t that hard, to grab the opportunity that came knocking on my door, in form of an invite from this place. While the world around me, was tinted with chartreuse green on the trees due to the summer in full bloom, I decided to put my rose coloured glasses on for the event. 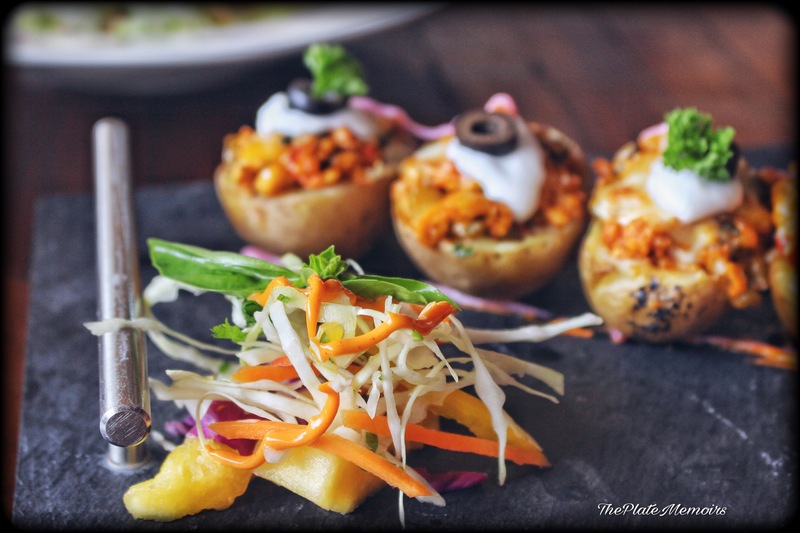 Being the brainchild of “Zorawar Kalra”, who is aptly regarded as “Prince of Indian Cusine”, Farzi Cafe strives to find a middle ground between gourmet and casual dining. 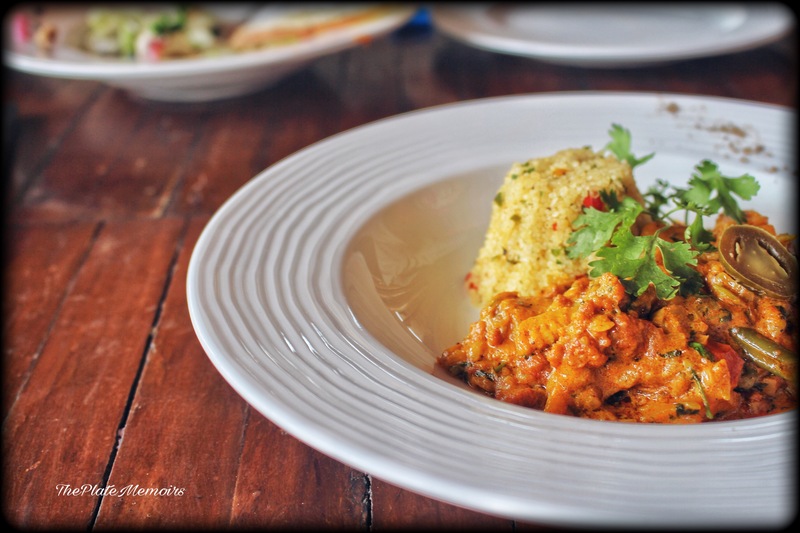 While the food remains familiar to the Indian palate, the techniques and sometimes spices are modern & global. 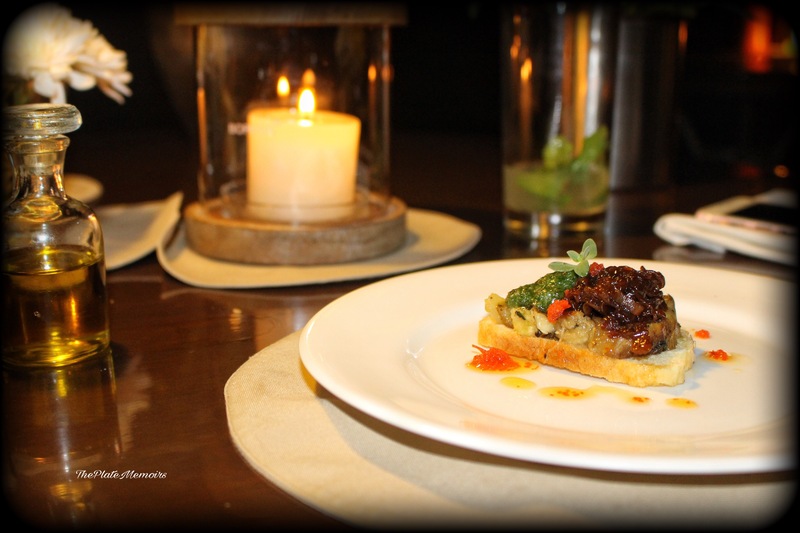 Molecular Gastronomy, gourmet ingredients, par excellence presentation are just a few highlights of the restaurant. 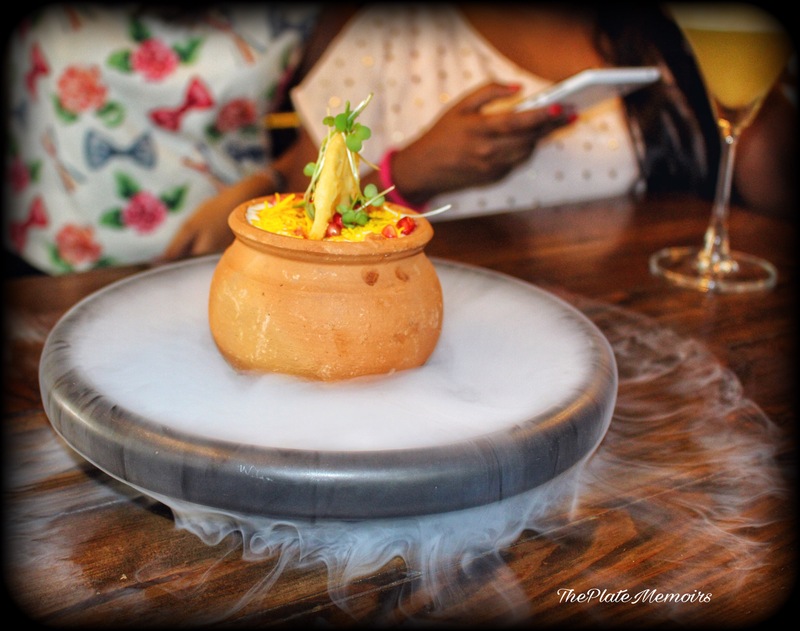 This is your modern Indian bistro with a twist! 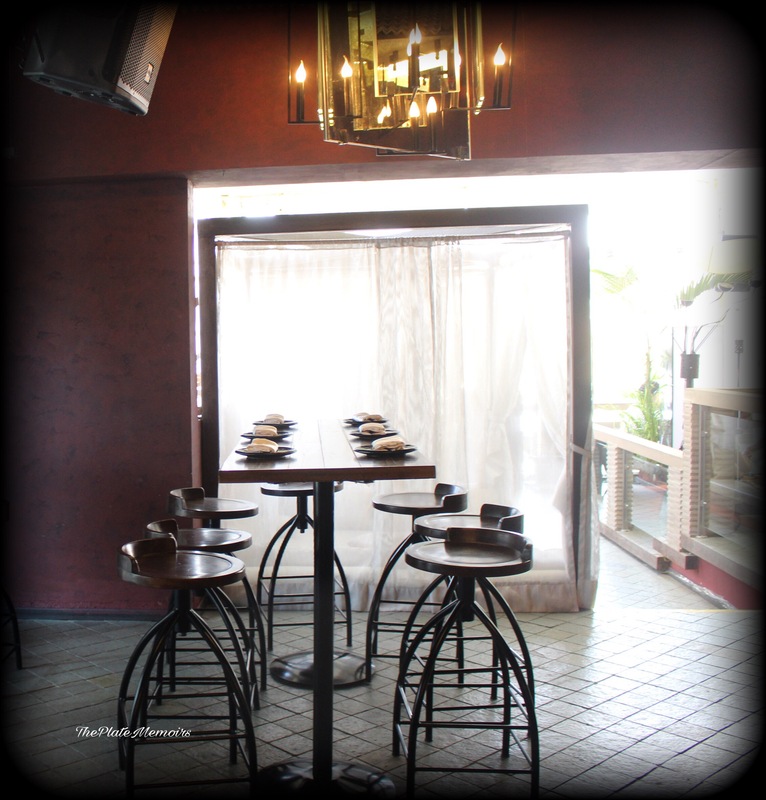 Decor : The decor is contemporary with quite a few shabby chic accents that grace the restaurant. 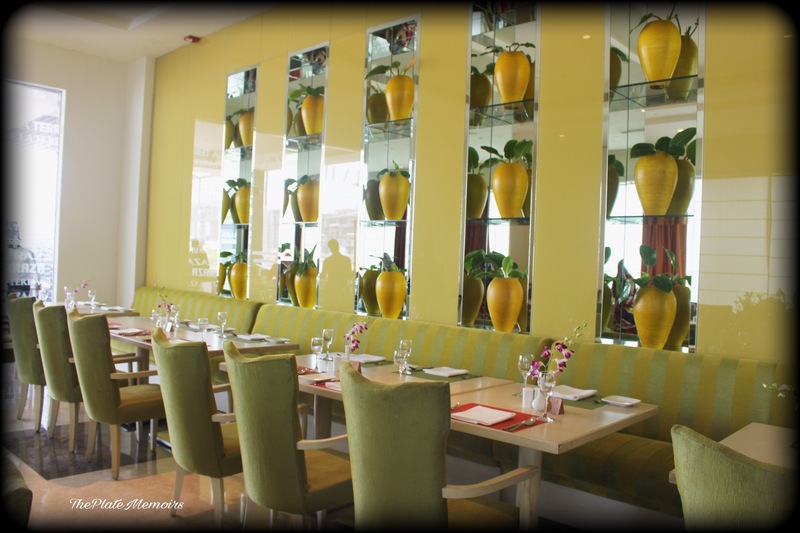 It’s divided into two sections- an air conditioned one & an al fresco dining that does wonders during the summers. 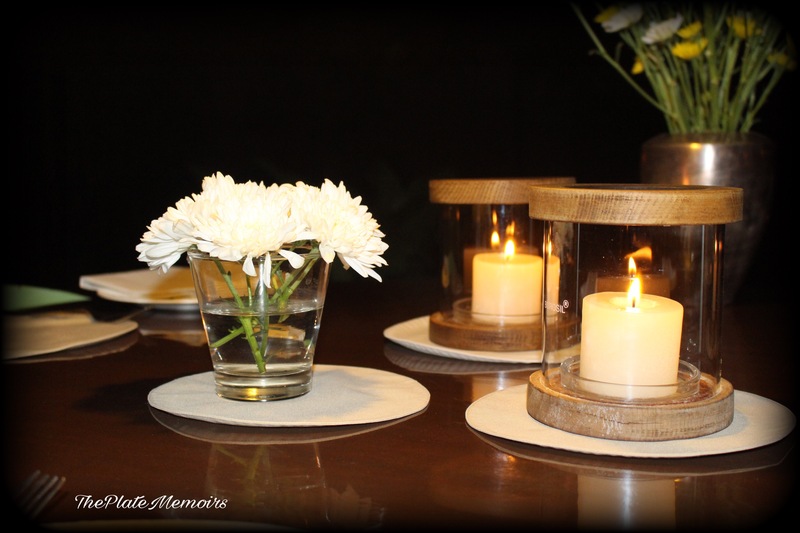 The ambiance is a breezy, soft and relaxed. Perfect for a quiet tete a tete or a hearty conversation. 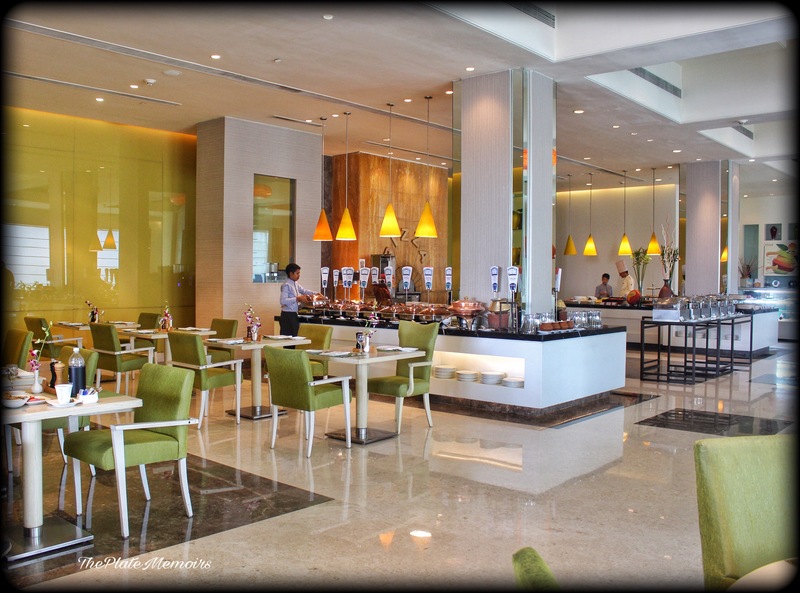 Hospitality : It’s ” Massive Restaurants”, that we are talking about. It’s the pioneer of hospitality. The wait staff were well informed, nimble on their toes, keen to serve and impart a good experience to the customer. 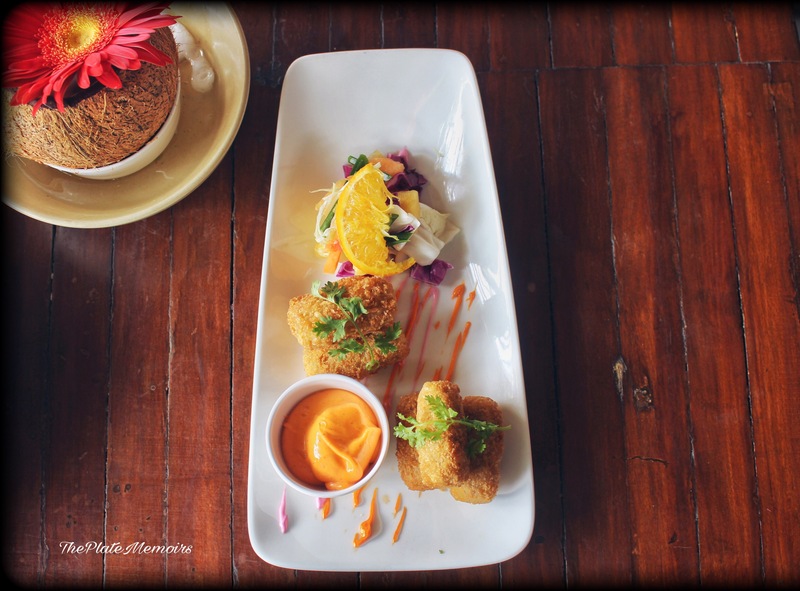 The Grub Story : Embarking on a trip of exuberance, come along with me. 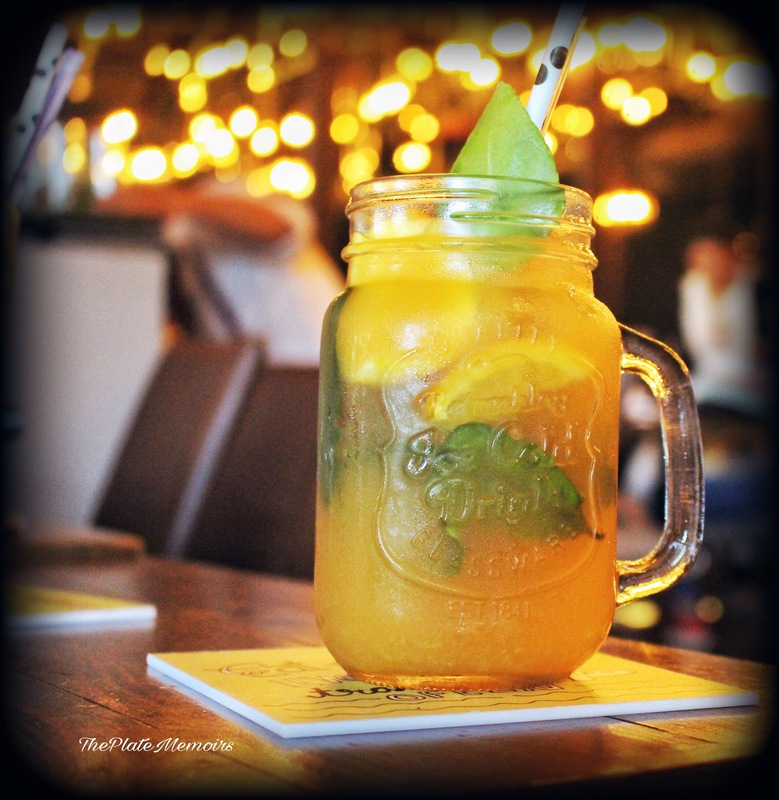 Farzi Ok : Refreshing burst of the citric orange juice with kaffir lime leaves. I, would’ve preferred a tad more body to the kaffir lime flavour in my drink, but this was just my favourite! 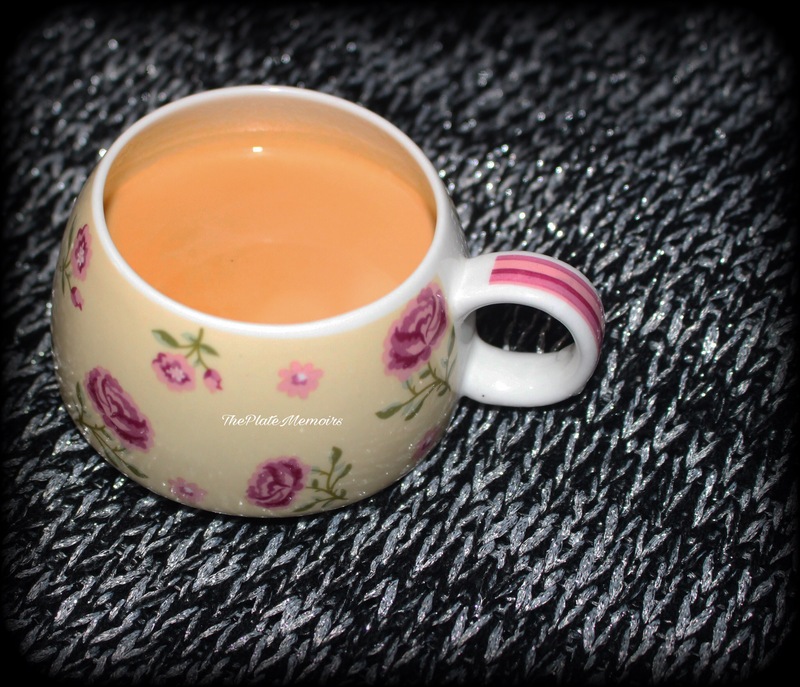 Mishti Doi : We were given “Mishti Doi shots”, which were almost like tiny balloons popping in your mouth. The pops were slightly sweet & not much of a flavour there, as its supposed to be a palate cleanser but the texture was commendable. 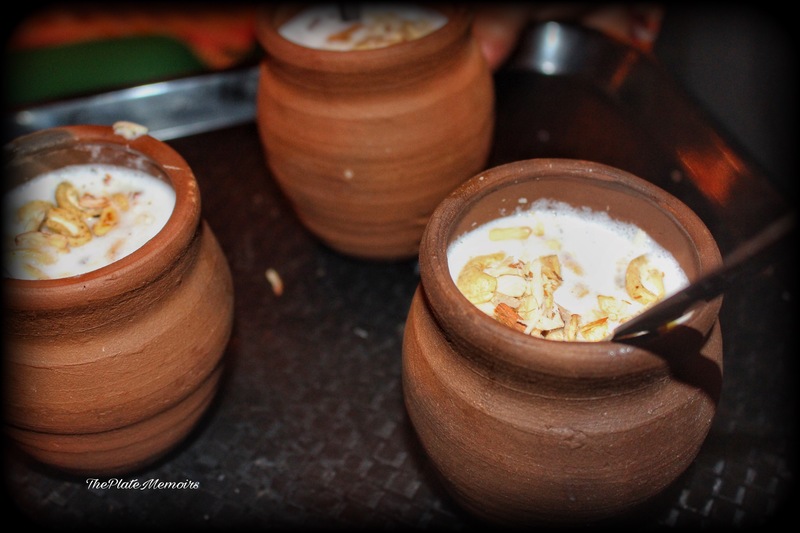 Dal Moth (Matka Chat) : Just the plain ole Dahi Bhalla in an earthen bowl. One of the best chaats, with right amount of green Chutney and Saunth Chutney to flavour the yogurt right. Recommended! 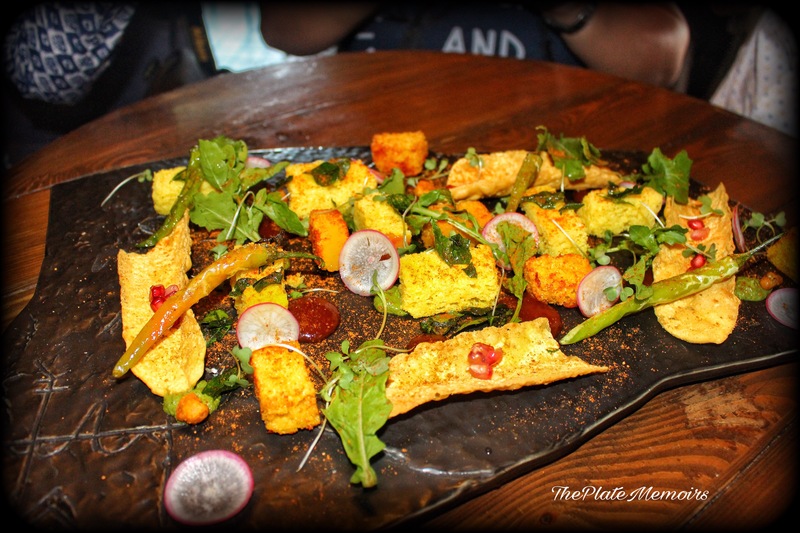 Dhokla and Farsan Salad : When salads are this Indian, I would love pacifying myself with salads and not feel guilty about it. 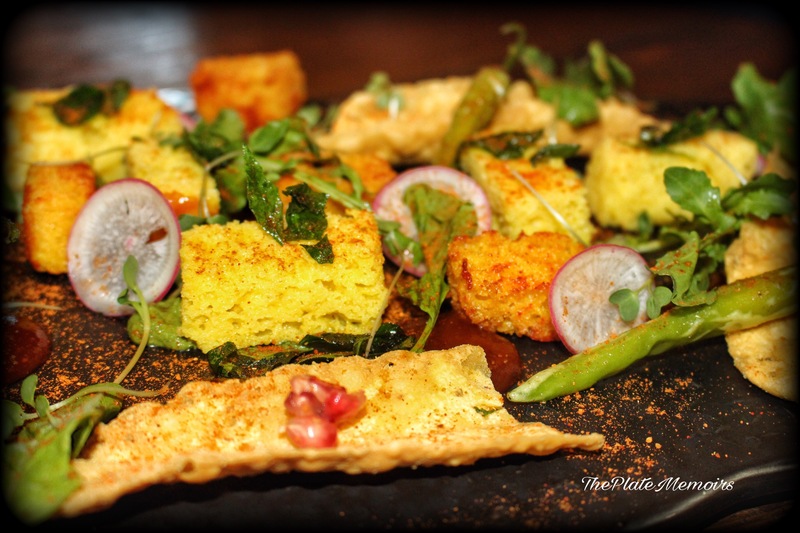 Warm flavours of tadka chilli and nuts combined with sweet Dhokla and spicy Farsan. 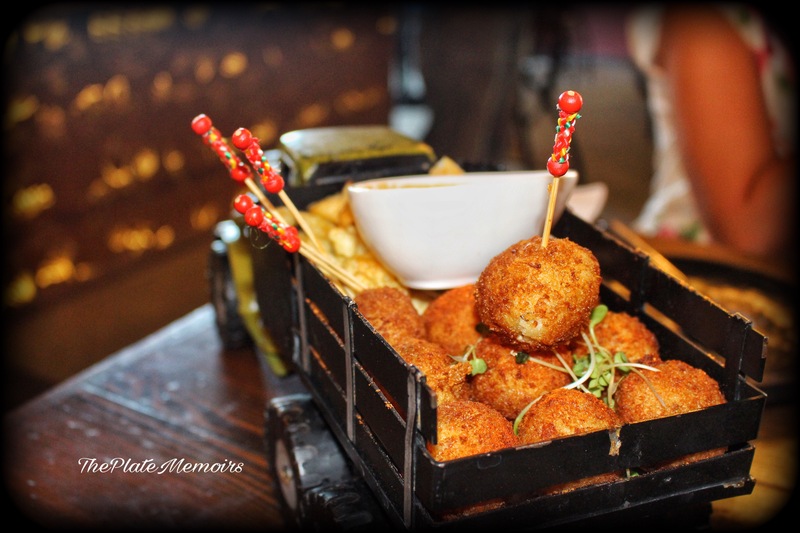 Mac & Cheese Tadka bites : Mac & Cheese made into perfect rounds and crumb fried. As much as I wanted to love these, they kinda failed to strike the chord. Couldn’t find the cheesiness of M&C, just a very floury flavour. 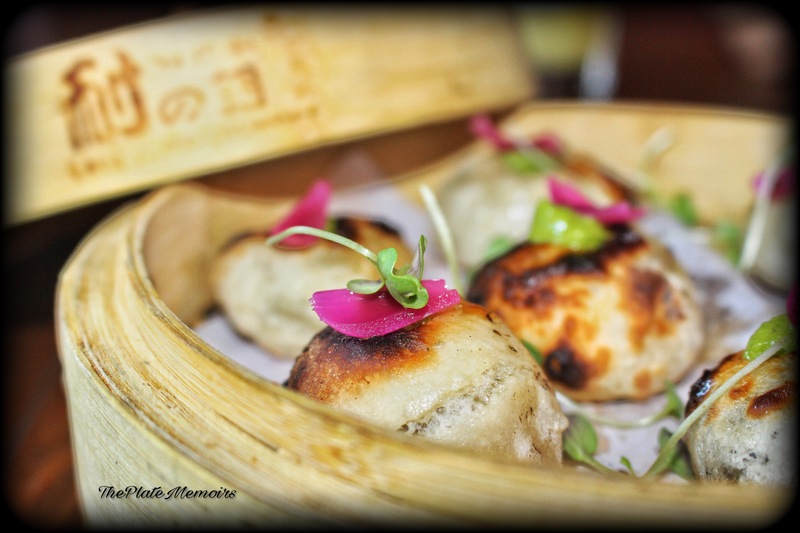 Mushroom Khurchan Kulcha : Tandoori Kulchas, filled with assorted sautéed mushrooms and cheese. 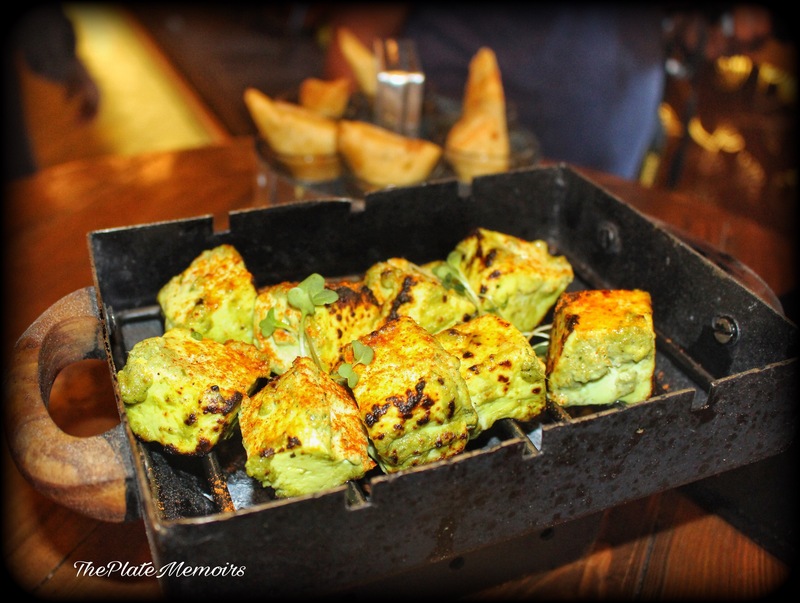 The beautiful blush of the tandoor was evident on the kulcha and made me grab another one. 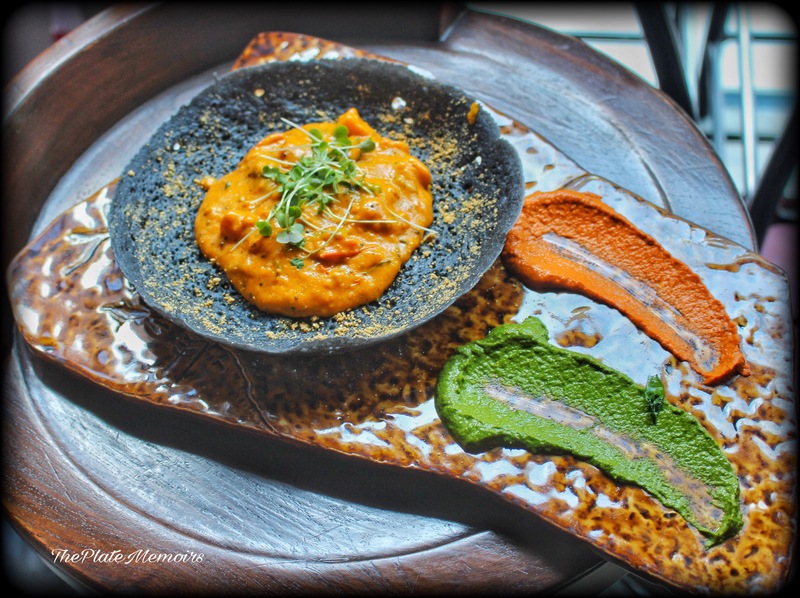 Green Curry Marinated Paneer Tikka and Sambal Mayo : The flavours were very Indian and it was nothing but Hariyali Paneer Tikka. It’s been advertised as Thai Green Curry marinated paneer, but I couldn’t find any strong Thai flavours in the dish. The Sambal Mayo, just felt like Red Chilli Mayo. The dish on the whole was excellent, but if you’re going to tell me it’s Thai inspired, I’m gonna have a hard time believing that. 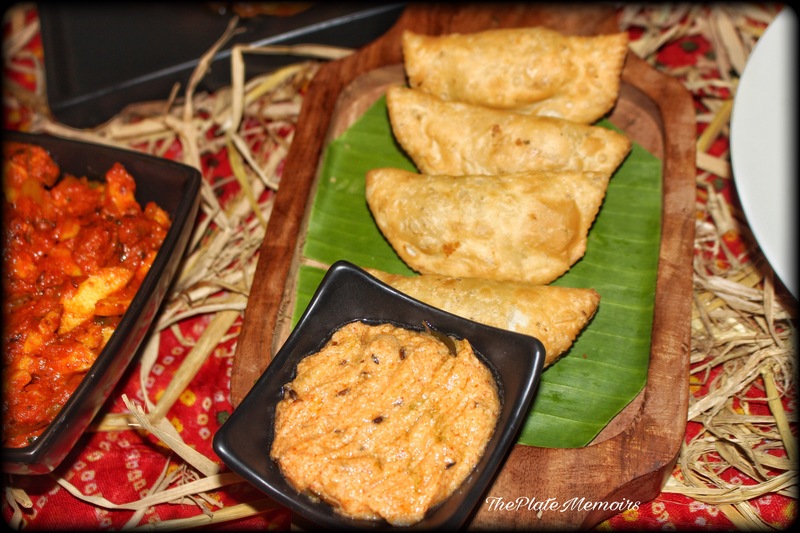 Tandoori Chilli Soya Patti Samosa, Sulaimani Chai Chutney : Yup. This was right! 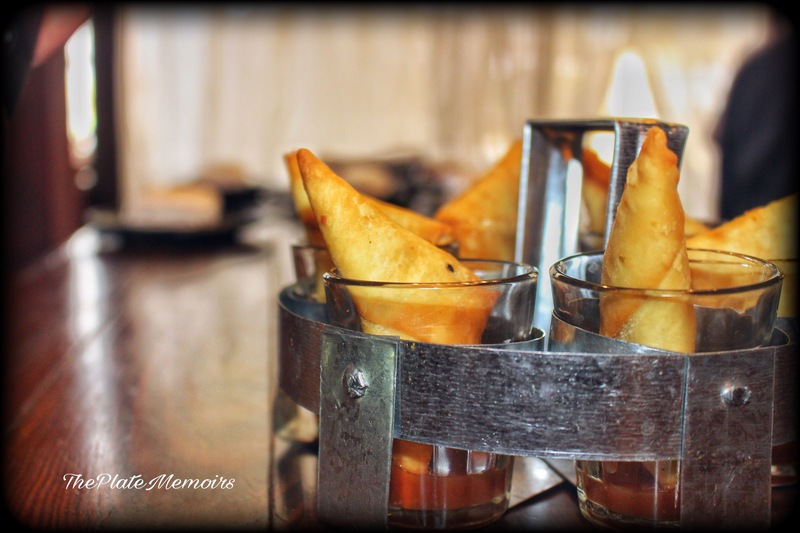 The hot quotient of the chilli soya samosa was calmed by the subtly sweet sulaimani chai chutney, with amber hues. 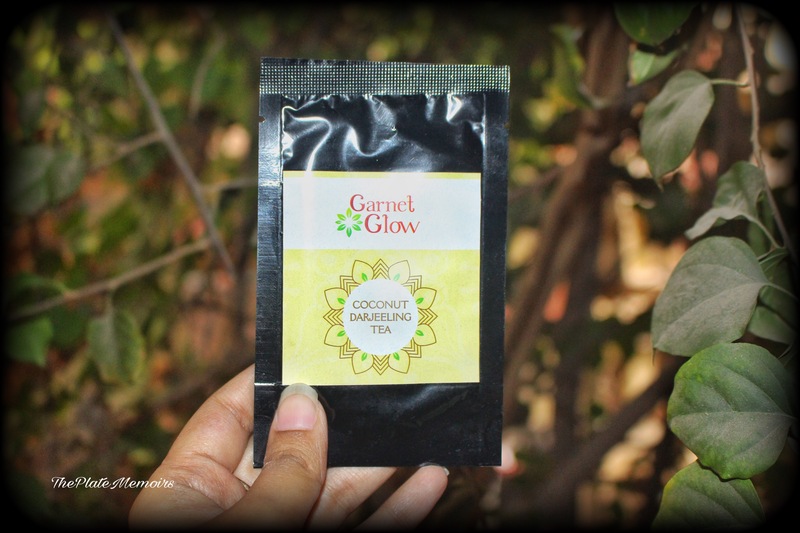 Something you ought to try, for its novelty. Bisibele Bhaat Risotto : Magnificent and utterly satisfying. This was what I call, a perfect fusion of cuisines. 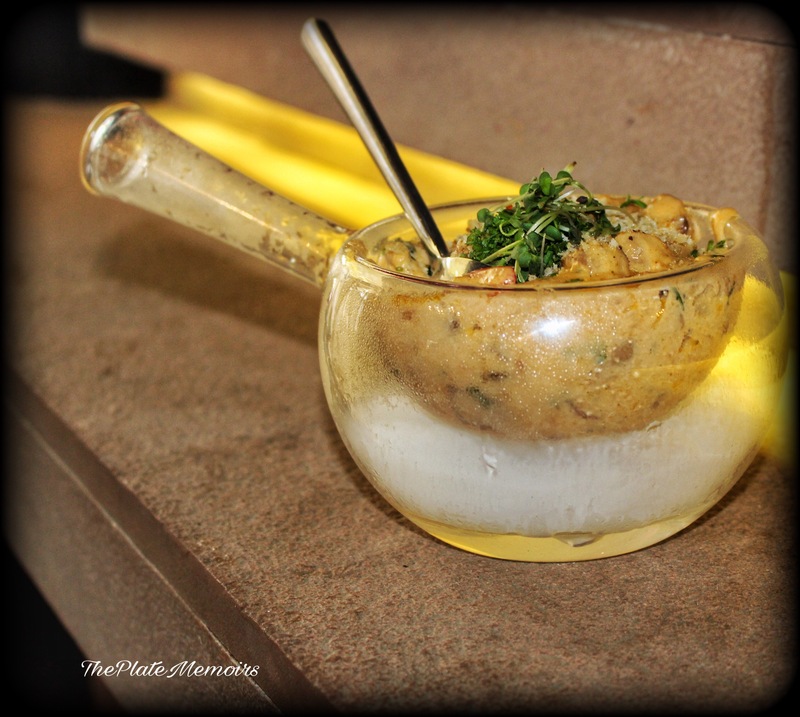 Heart warming Karnataka spiced risotto rice with dollops of Ghee and Charred Artichokes to up it by a notch. I just couldn’t stop eating this. Must must have! 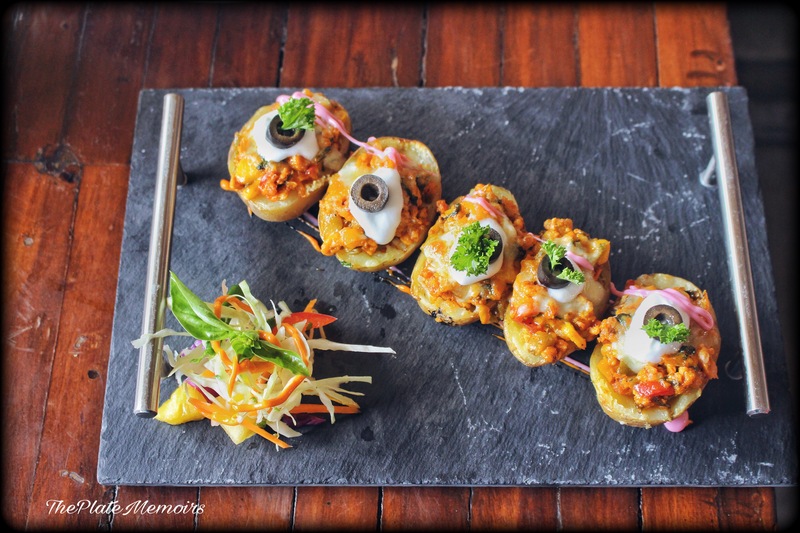 Masala Paneer Burger : The light and delicately spiced paneer patty served in a bun with bell peppers and Makhani Mayo. Yet another delight to the heart. 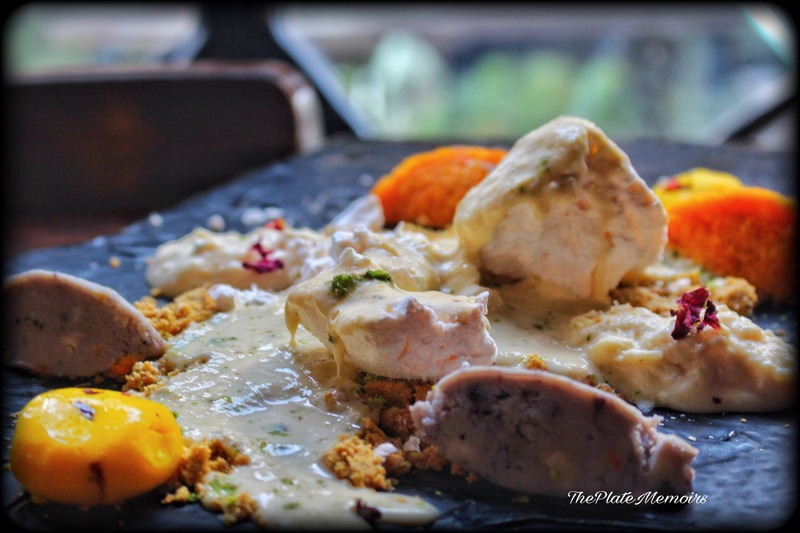 Farzi Sundae : A mellow Sundae made out of pistachio, Blueberry and Saffron Kulfi. Doused with chocolate vermicelli and brownie. The combination as delicious as it sounds, was a little disappointing. 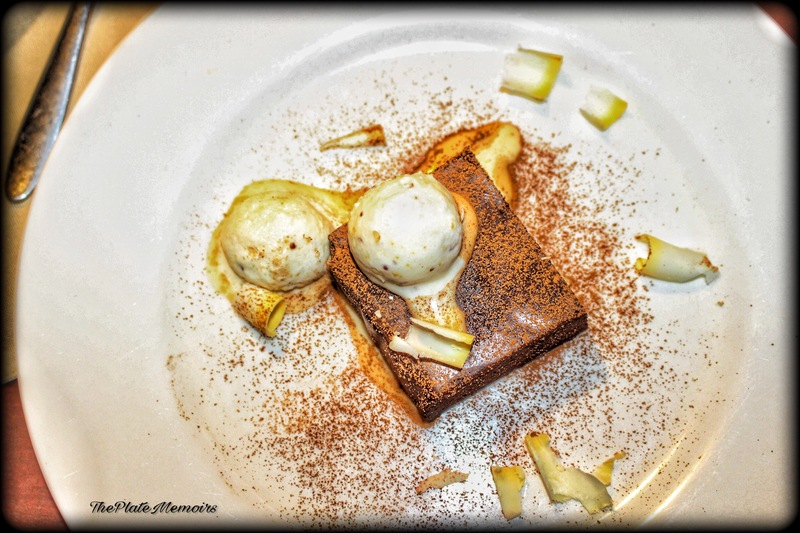 The flavours failed to express themselves, could have been more pronounced but got lost in the mishmash of their dessert confreres. The highlight was the gooey and chewy chocolate brownie. 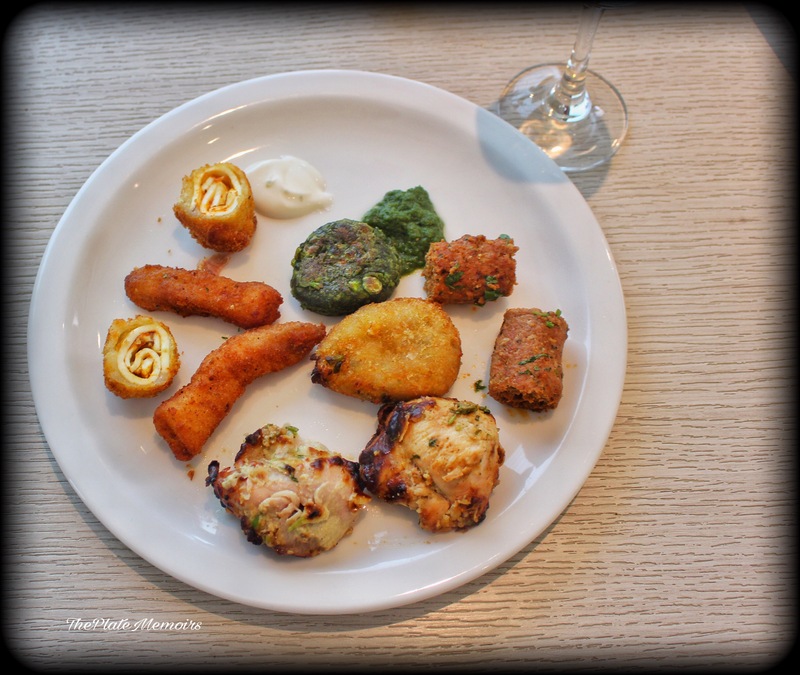 Textures of India : This was Farzi’s representation of the well loved Indian desserts on one plate. Each little quenelle, was representative of that dessert. 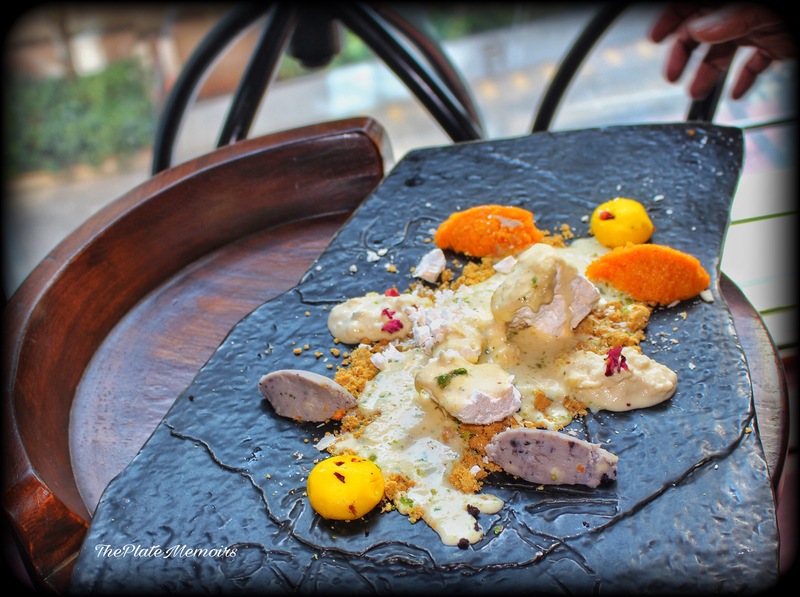 This dessert had orange kalakand, Mango pedha, Blueberry Pedha, Chenna payas, carrot cream, Besan laddoo crumble and Apple custard Rabdi. The Rabdi was incorporated with nitrogen and poured over the quenelles. A visual delight! 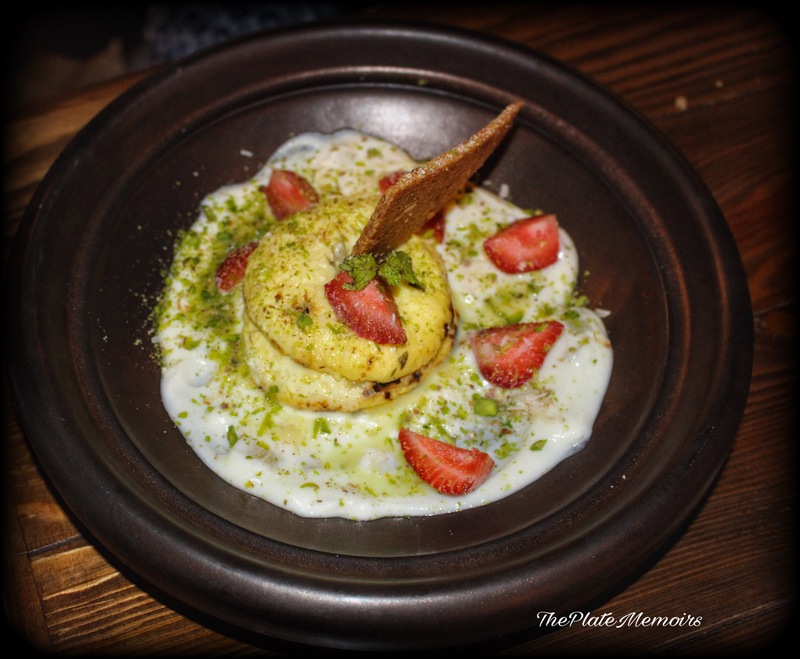 Tandoori Rasmalai with Shrikhand and Almond Nougat : Another beautiful dessert that went well with my tastebuds. Immaculate flavours not too sweet and certainly not too heavy on the tummy. Slices of strawberry adorned it. 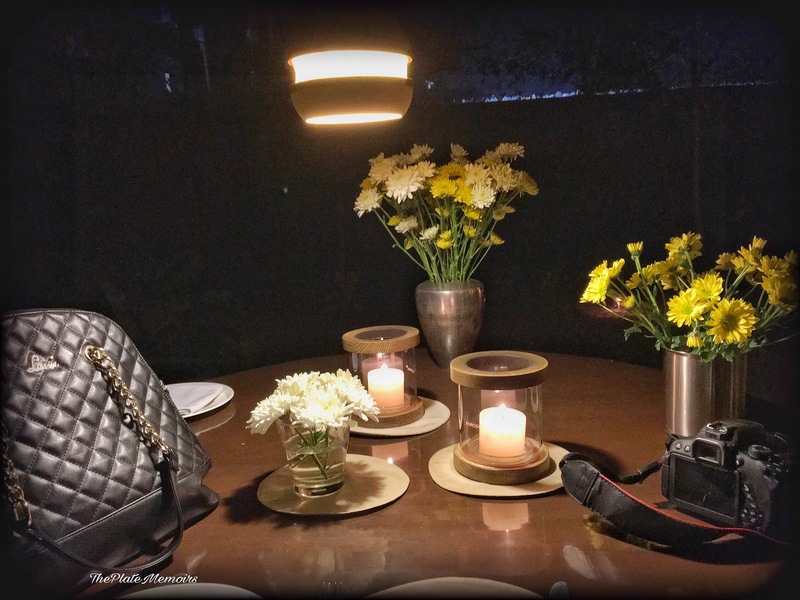 Verdict : Farzi Cafe has a certain aura, which is embellished more on the fact that “You dined here”, rather than the “Food is outstanding”. It’s an experience nonetheless, but on that note I would love to say this quite proudly, that there are a few dishes that can be found nowhere else, like “Mushrooms and Cheese with Walnut Dust”, “Bombay Bhel”, “Charcoal Appams with Water Chestnut Curry”, etc that are niches in themselves. 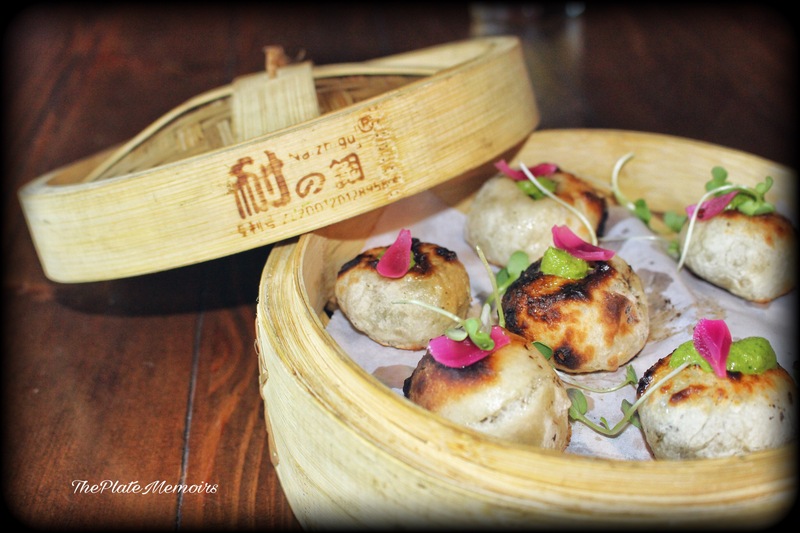 The new menu, is fair enough with average dishes and a handful of mind blowing dishes. It’s all about, what you order. If you’re ordering the right things, you will be pleasantly plump with joy and if not, you’re going to label it as “Overrated”. Here are 4 stars for the experience. Made to mimic a Polynesian Tiki shack, Three dots and a dash, looked every bit of bonzer. The heat waves were quite adamant at being prominent, but little did they fathom that they would meet their match. Spiralling down the portal into Hawaii, I had my heart at my sleeve today, because of the utterly delish menu in my hand. Quite an eccentric name, isn’t it? Aah..the history is quite eccentric as well. 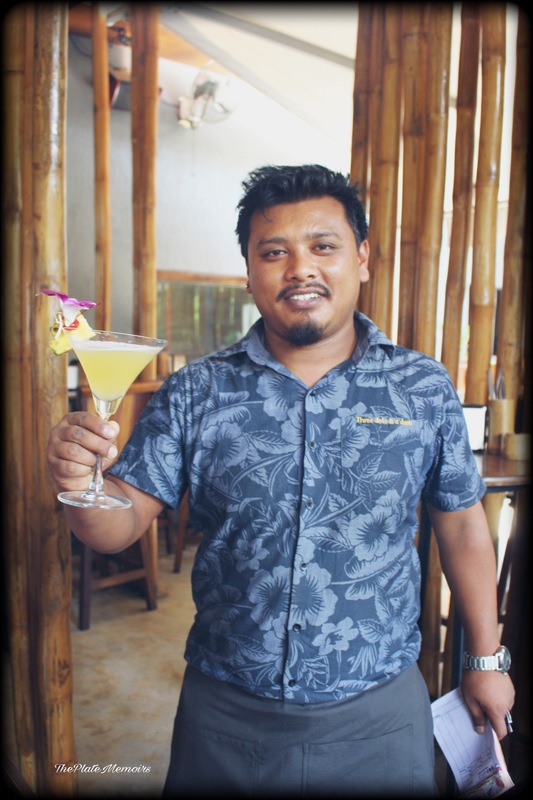 Three Dots And A Dash is a drink created by Don The Beachcomber. It is the morse code for the letter ‘V’ which represented victory during the World War and was his tribute to his comrades who fought beside him during the war. 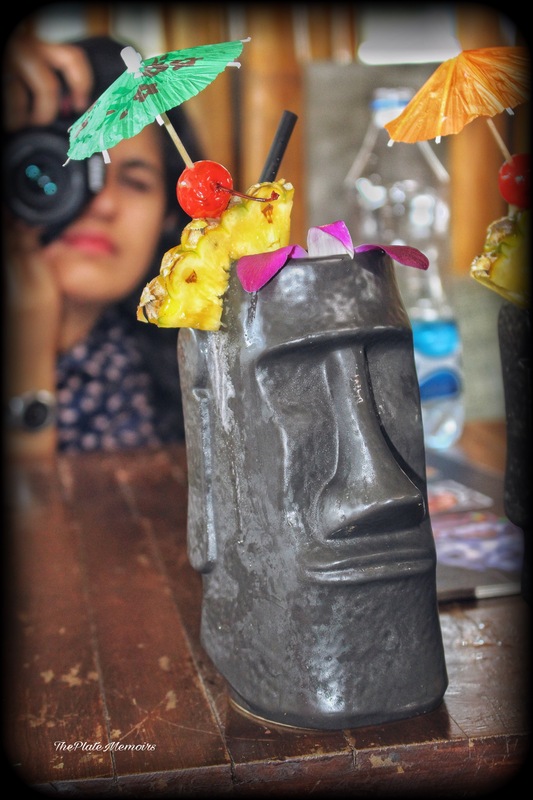 Almost 70 years after that legendary drink, Paul McGee set up a tiki bar in the midst of chilling Chicago weather. The result, as we all know is pretty evident. Bangalore had been blessed with “Three dots and a dash”, last year and the overwhelming response tells us that they are doing everything right. We got a taste of Polynesia, at last! Decor : There are 2 levels dedicated to making you feel comfortable. The first one is relaxed & dark. The rooftop is designed quite in rustics. The bareness of it, is the USP. There is an inadvertent use of bamboo batons all around. You have bar stools and comfortable low rise chairs. 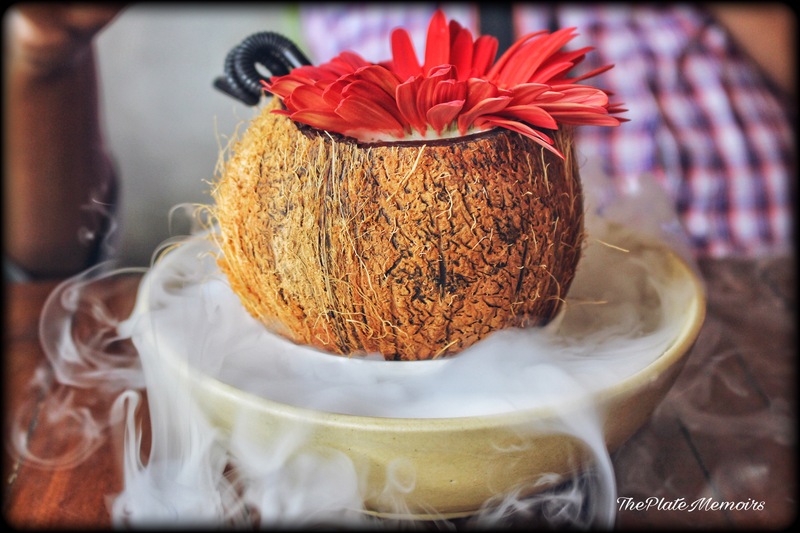 They even have their own coconut tree, from which they base their coconut drinks. The ambience takes the cake for being casual yet inviting. Hospitality : Spot on, with their service. Attentive and polite, our servers were a charm. Enquiries were made on how many of us were there and the best table set up for us. Kept an eye at our table and kept the food scene flowing from one course to another. 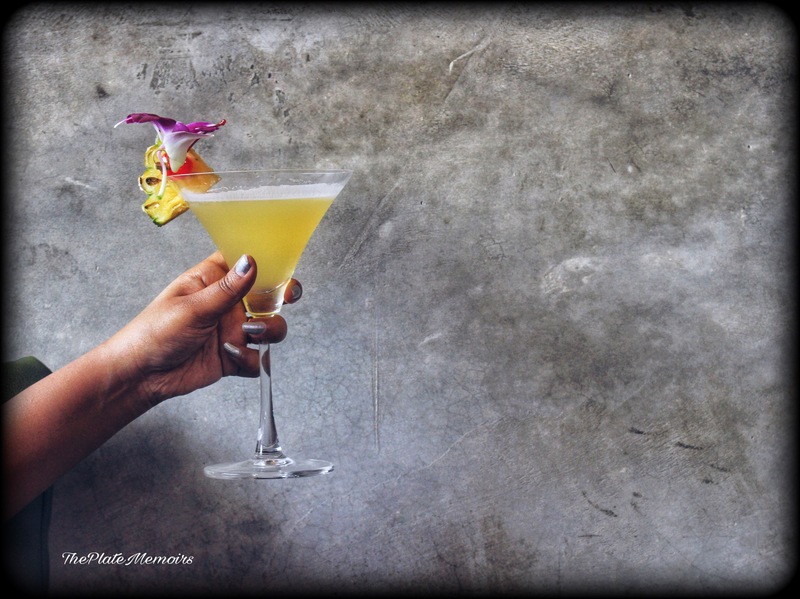 Caribbean Dream : A thick mocktail with a sweet- sour profile. Made out of strawberry crush, black currant and cranberry juice. Yum yum yum! Lemon Coriander Soup : Delighted! The soup had one of the most sublime flavours of the lemon and coriander. 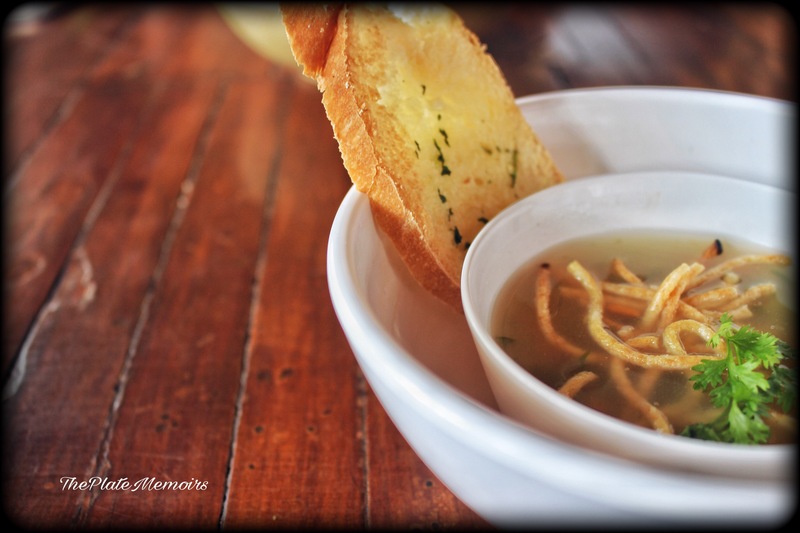 The comforting clear soup had cubes of carrot, fried noodles to grace & served with a slice of toasted garlic French baguette on the side, gave us a good start to the meal. 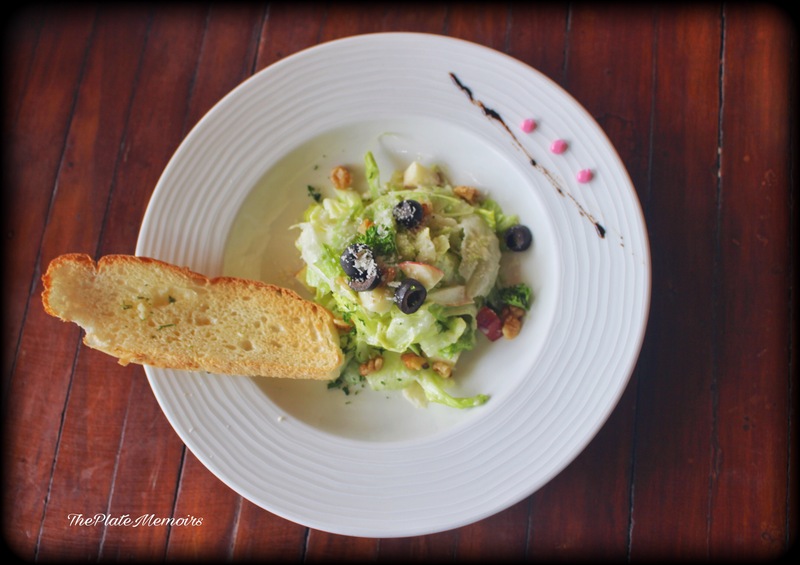 Waldorf Salad : A perfect medley of apple triangles and crunchy walnuts tossed with lighter than air mayonnaise, served on a bed of cos lettuce and garnished with black olives and Parmesan. What, I would like them to do is, be a little more heavy handed with the mayonnaise. It would bring forth more flavour. Herb cheese stuffed mushrooms : Did I hear mushrooms? I, Hootie patootie, right did. What a magnificent piece of happiness this was. 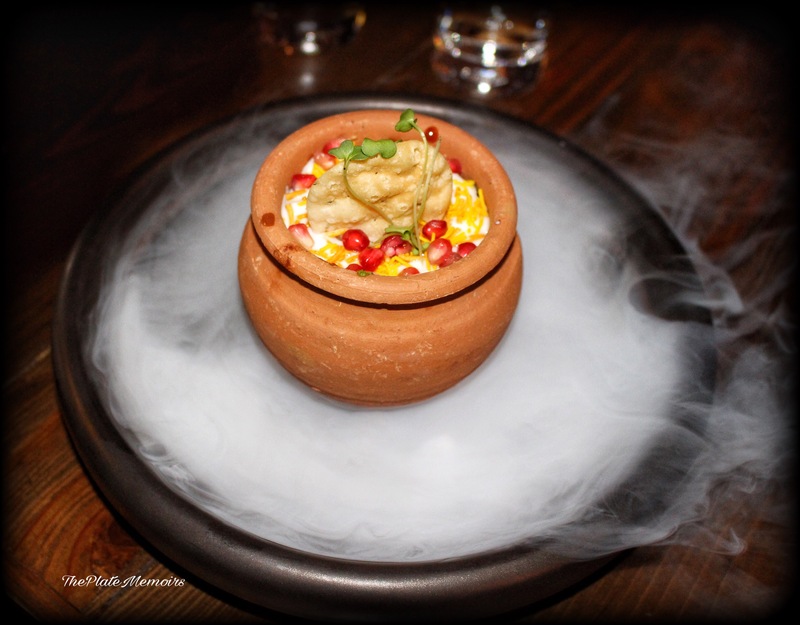 The flavours were just so intense and light, that my mind started playing games with me. Was I over eating or eating just fine? I would never know! They have a baguette scooped and stuffed with mushrooms, herbs and Cheese. The crispy exteriors and the Cheesy interiors, had me! I’ve never seen a better interpretation of stuffed mushrooms. 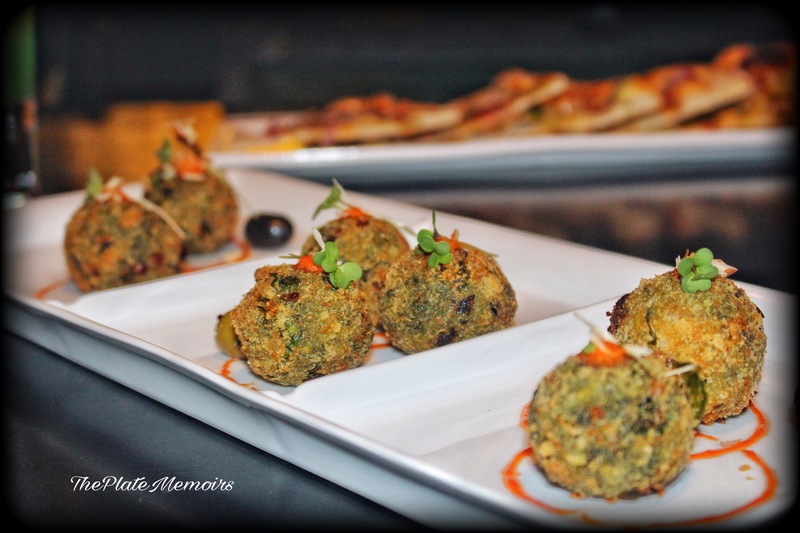 Vegetable Croquettes : This one, looked beautiful, but sadly didn’t make the cut for me. Though, it’s good, I’ve had better croquettes. I expected a more bland flavour profile as opposed to this one, which leaned more towards an Indian Aloo tikki. The crispy exterior was spot on, by the way. California Spud : I love Spuds, they are one of the things that keep me happy. 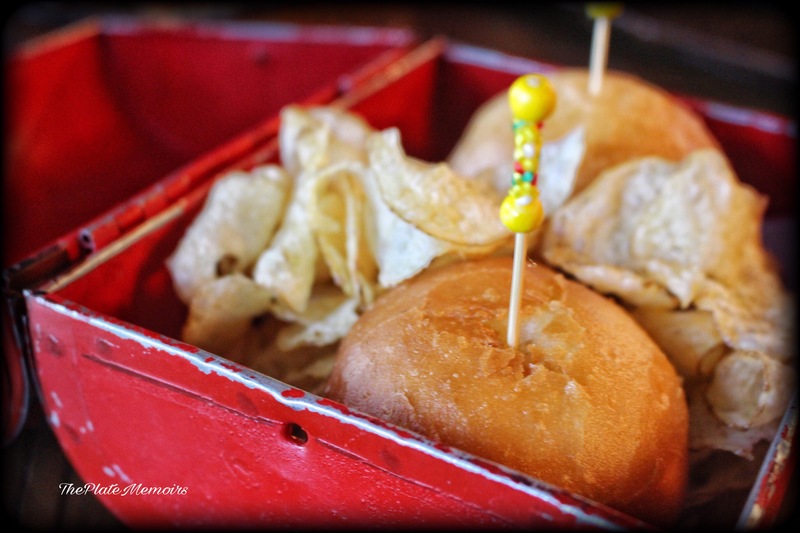 The California Spud was nothing but your Classic Jacket potato minus the big jacket. The Spud was scooped in the middle and filled with a spicy filling & topped with cheese and cream. Vegetable Tagine with Cous Cous : Tagine’s are a thing that are close to my heart. The earthen ware has always been a part of my life. The heartiness that is there in a tagine, is usually found when it’s meat based. Having said that, I adored this vegetarian tagine a lot. 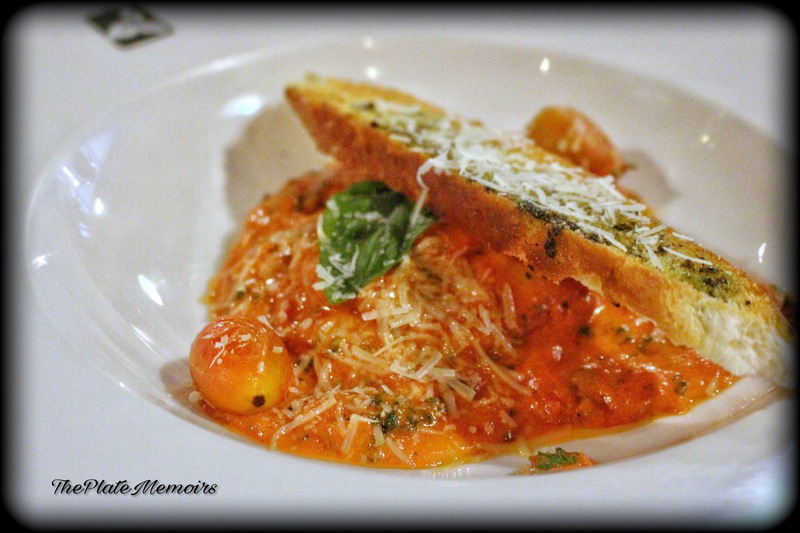 The flavours were perfect, with a lot emphasis on the tomato base. The veggies were simmering with warmth. Pair that up with some couscous and it was a worthy delight. Spicy Veggie Whole Wheat Pizza : Pizzas are sinful and I like them that way. I wasn’t very excited to try the whole wheat version, but boy! Was I glad, when I did. The pizza was ever so light and didn’t give you a feel of being full. Liked it pretty much! 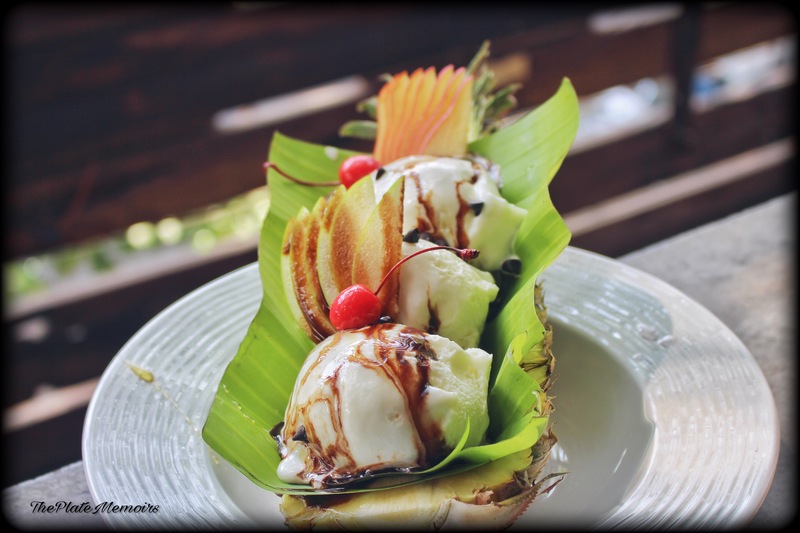 Hawaiian Banana Split with Cream : More than the taste, it was the presentation that wowed me over. This was the Polynesian touch, I was looking for. Snuggled in a pineapple, the scoops of vanilla ice cream and banana slices, were perfect. Raspberry Gateau : Light and airy, with subtle raspberry tones from the coulis. Nothing jaw dropping, but fair enough. 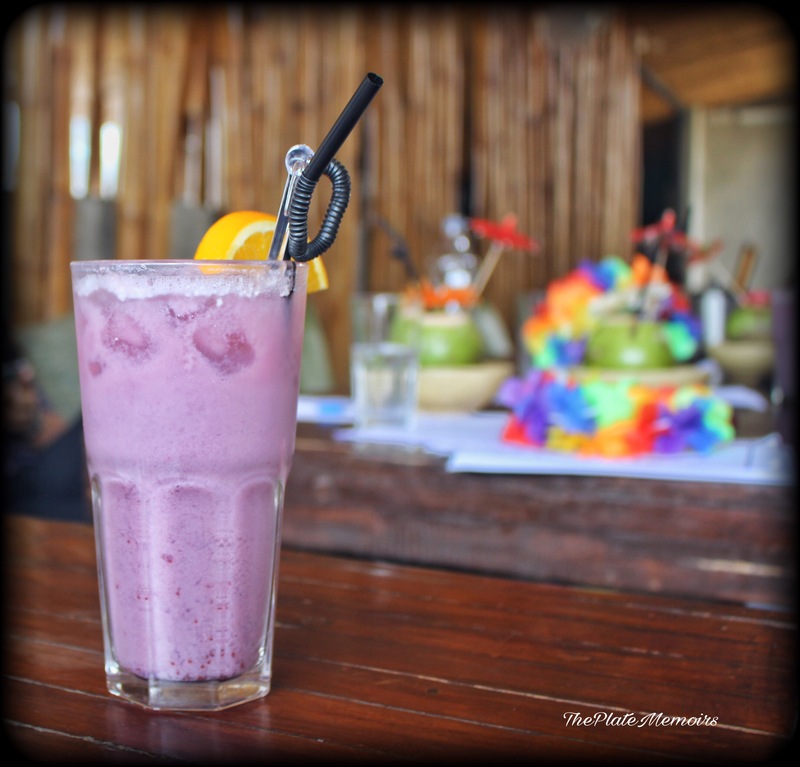 Verdict : I, loved the vegetarian version and was quite happy with my berry Mocktail. 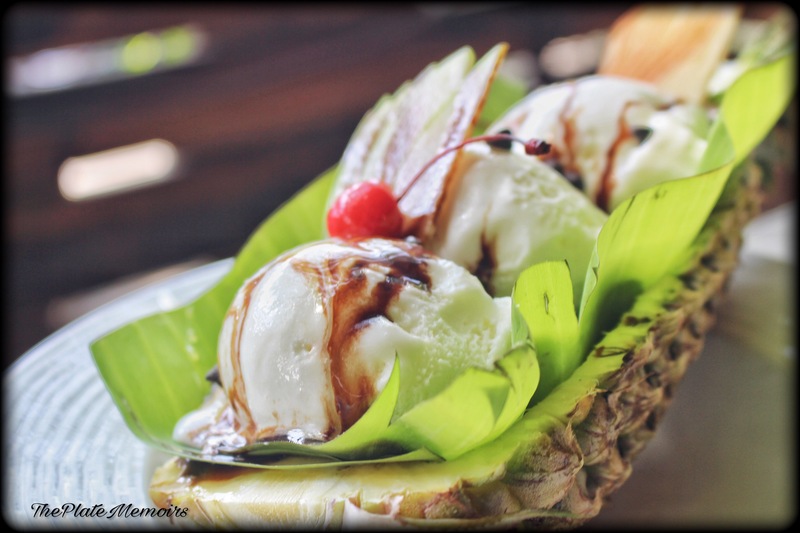 There is a dearth of more Polynesian dishes on the menu, it’s more like a hodgepodge of continental cuisine. I do see, a lot of Hawaii on the drink menu, but what, I would like to see is more of Polynesia on the plate as well. Three dots and a dash stays true to the Hawaiian Proverb, I quoted at the beginning and pampers you with all the love they can. All in all, a great experience and something I would look forward to again. Here are those 4 stars.